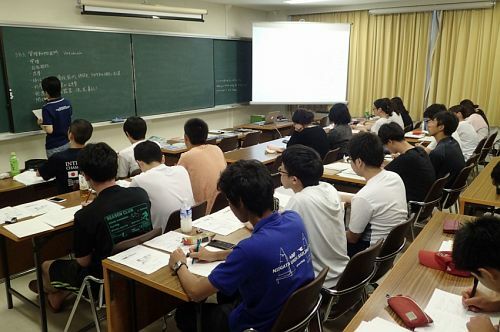 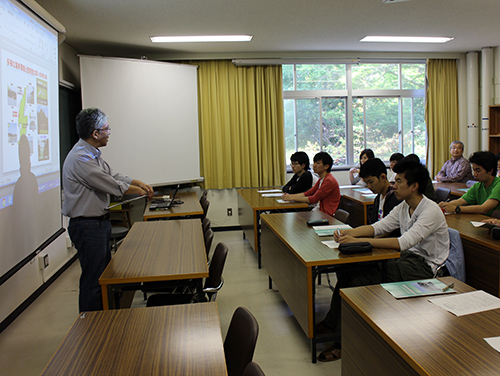 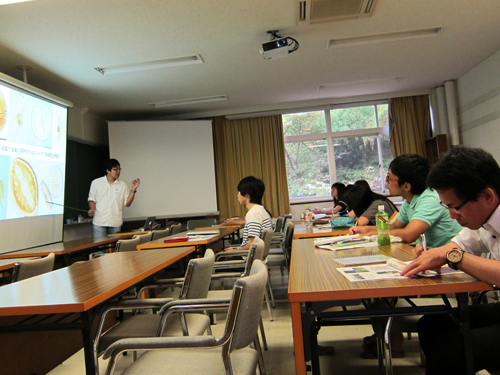 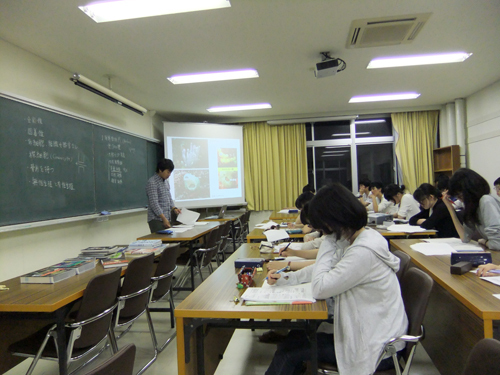 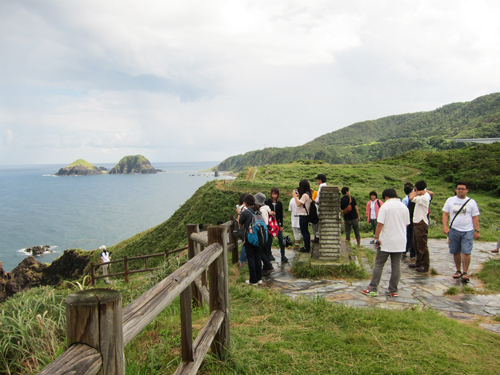 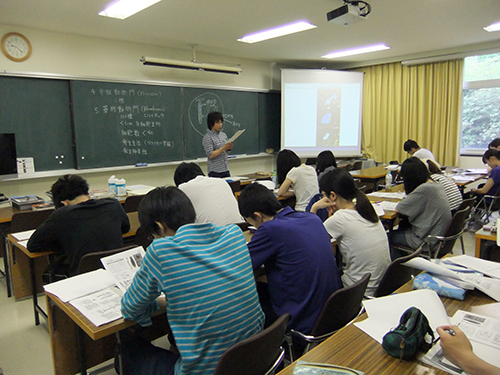 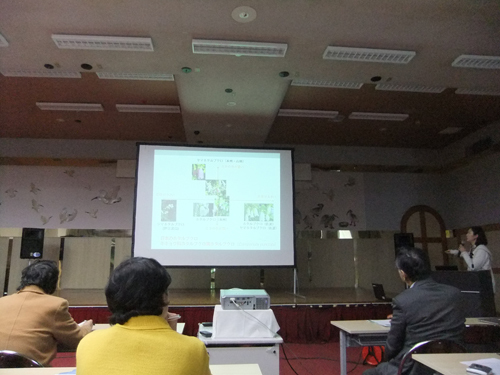 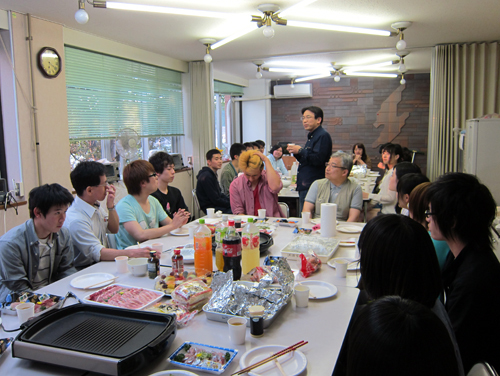 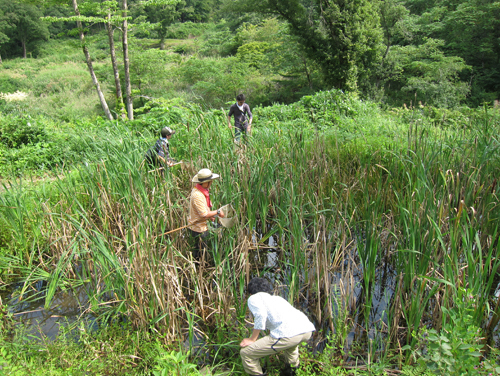 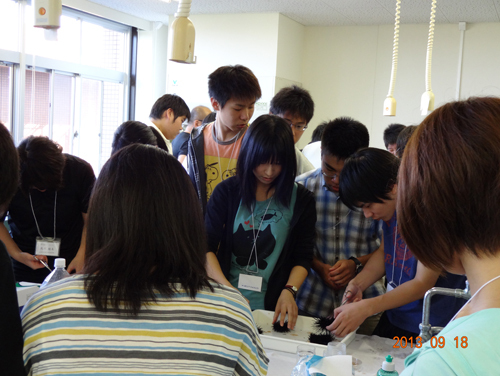 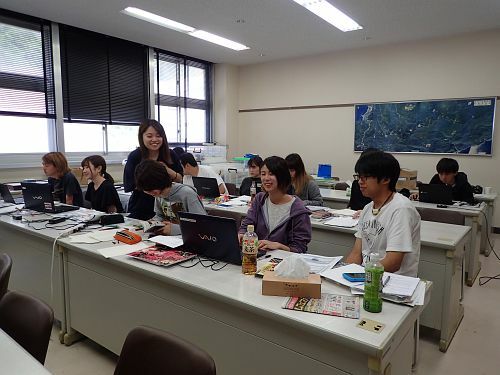 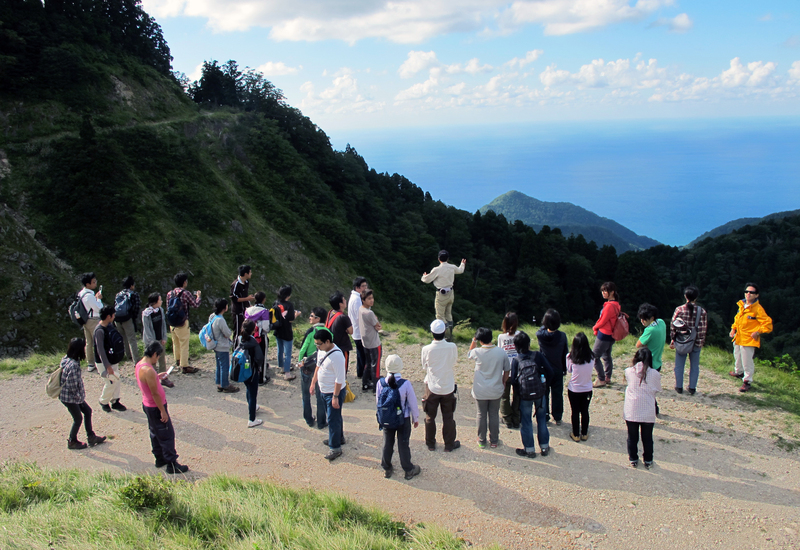 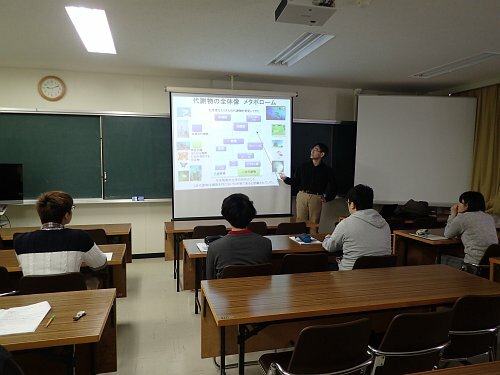 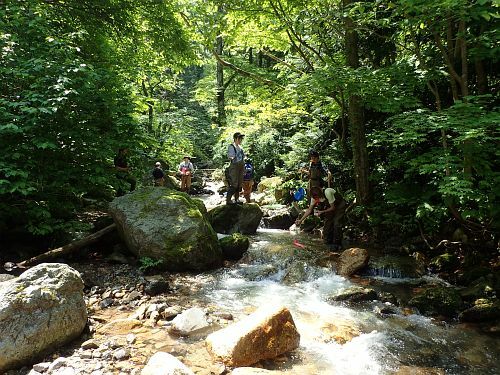 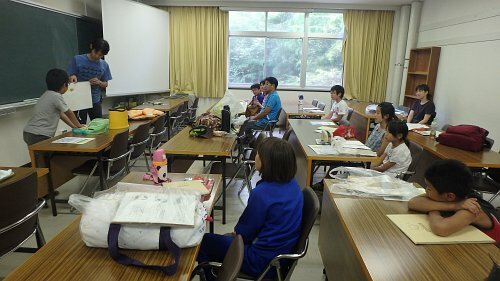 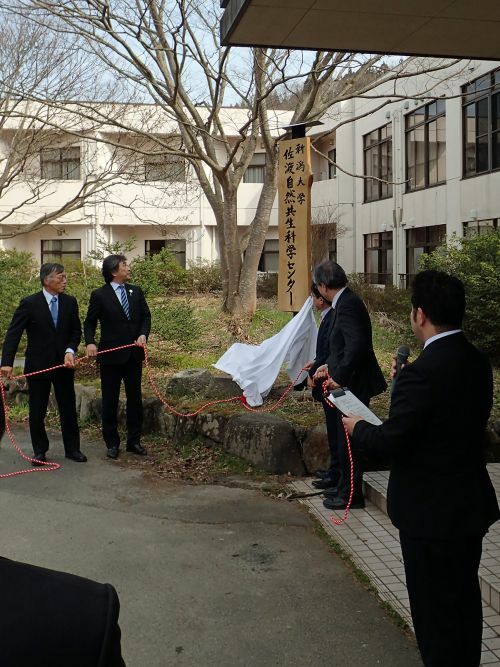 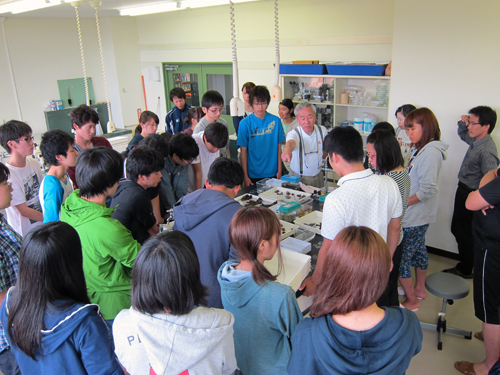 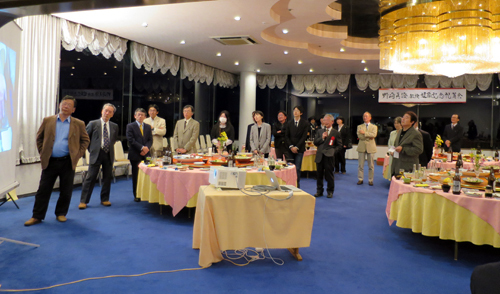 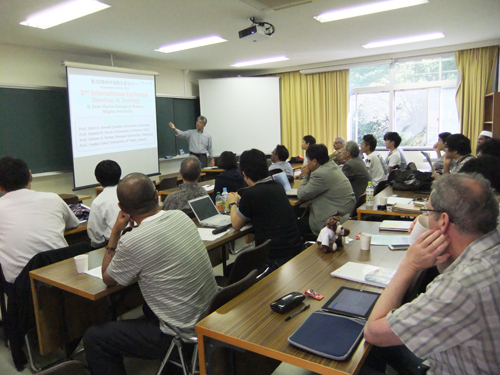 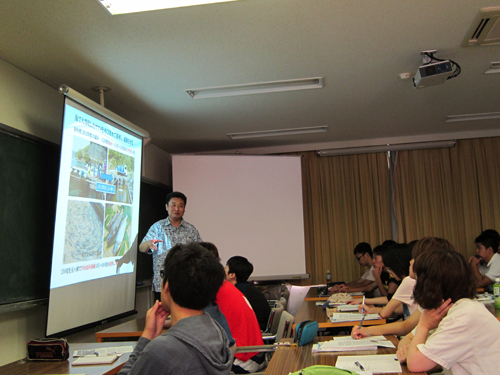 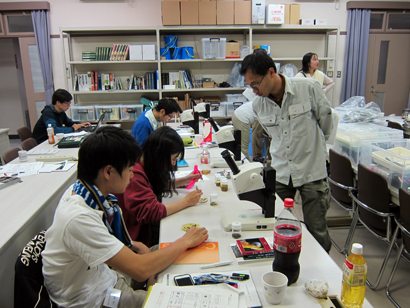 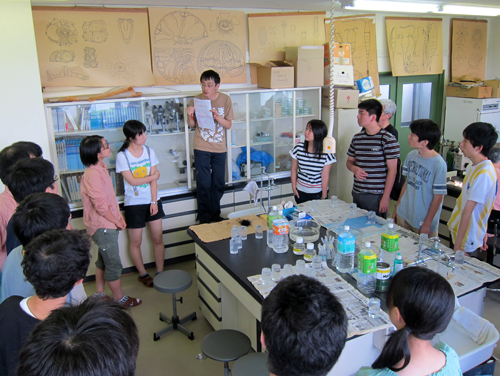 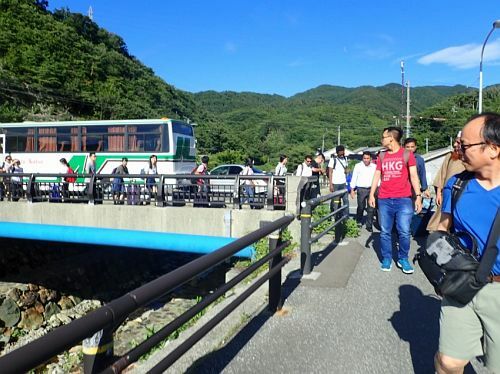 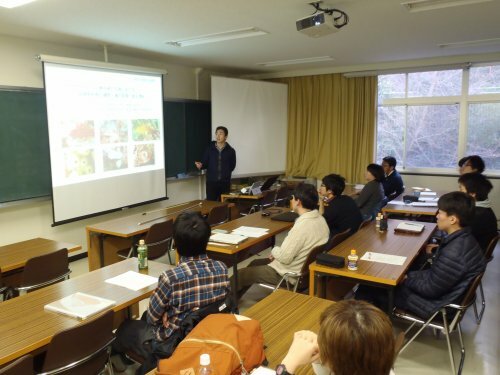 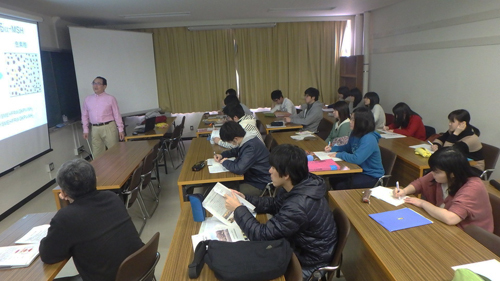 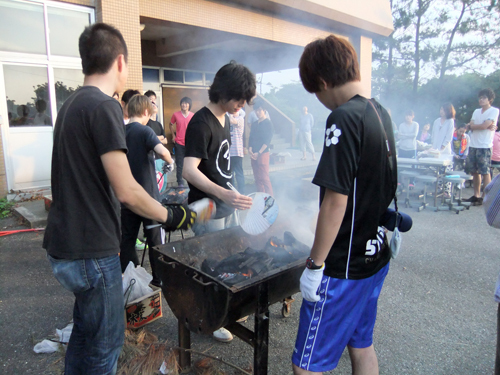 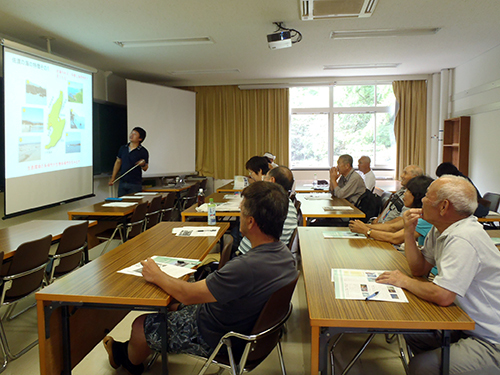 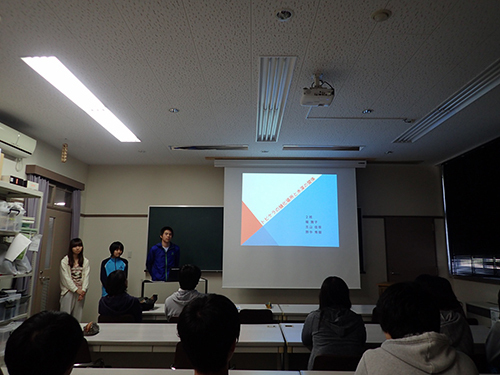 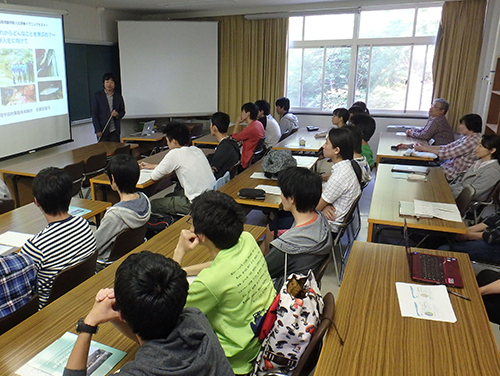 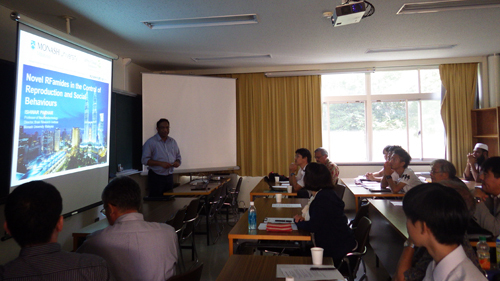 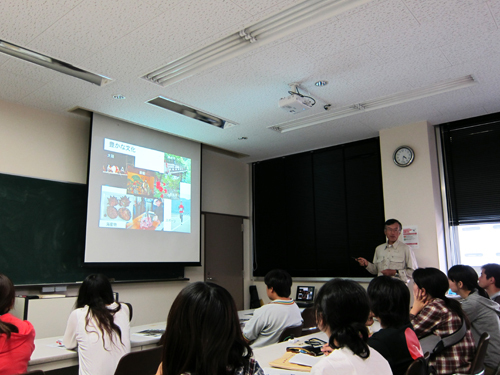 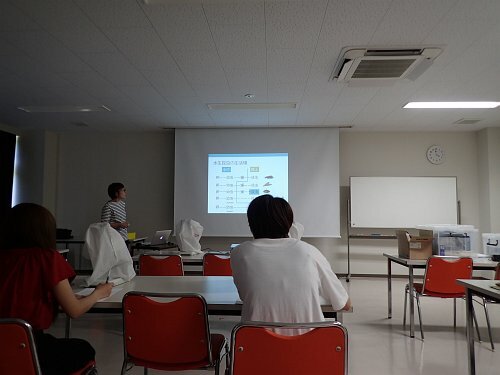 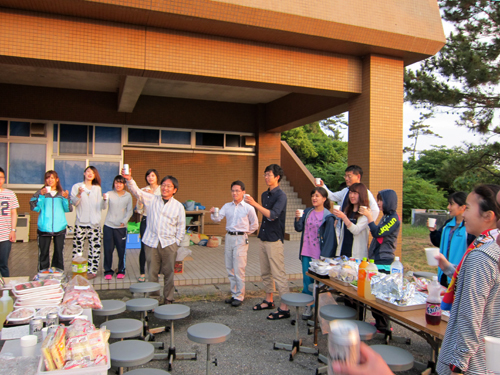 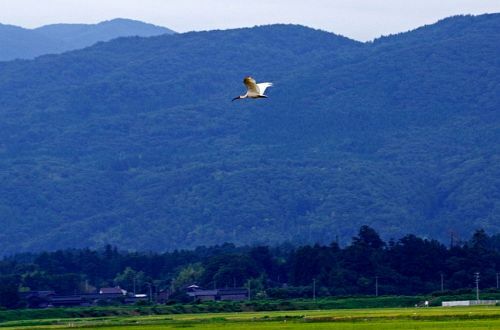 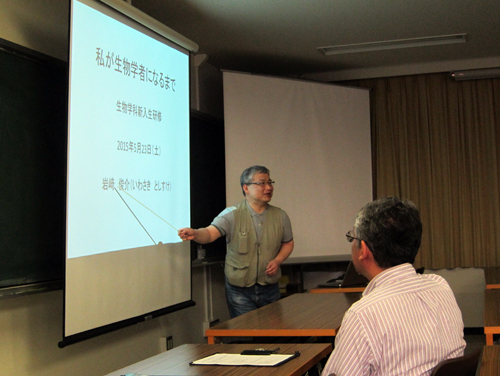 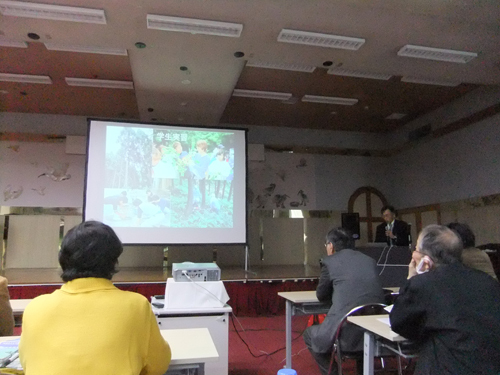 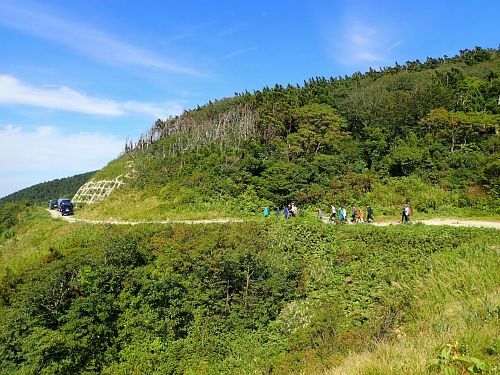 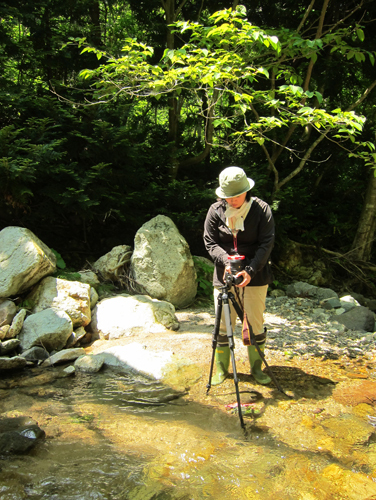 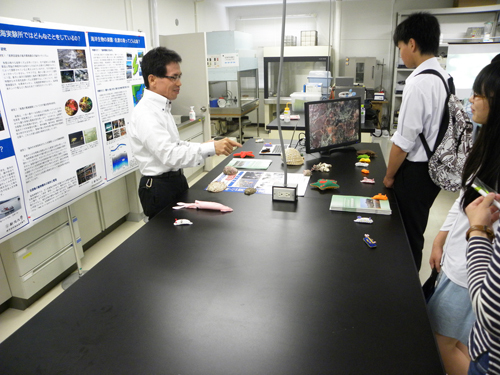 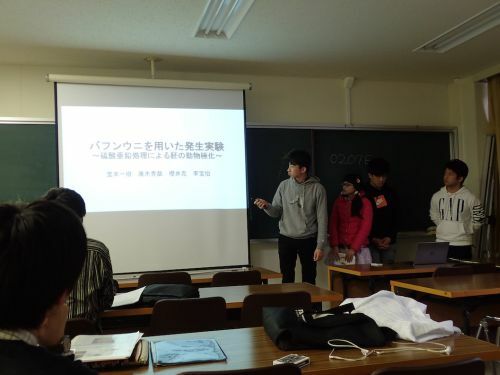 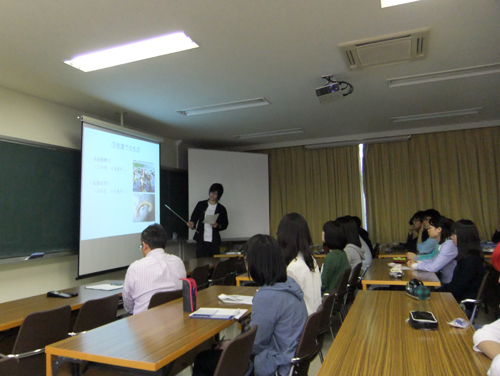 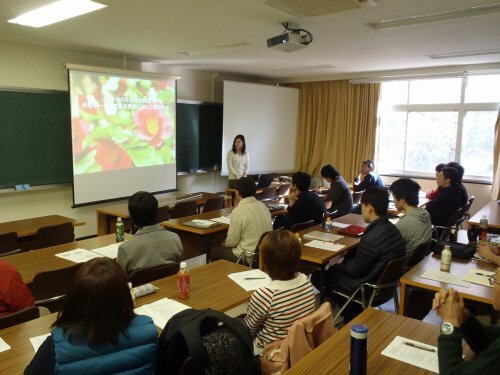 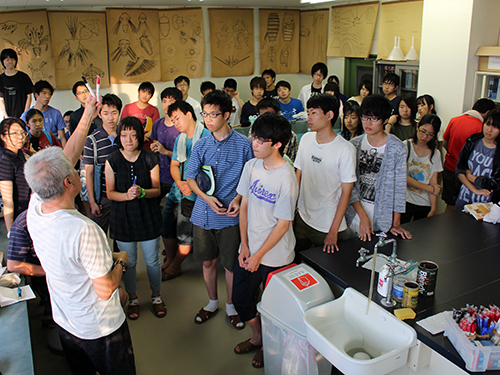 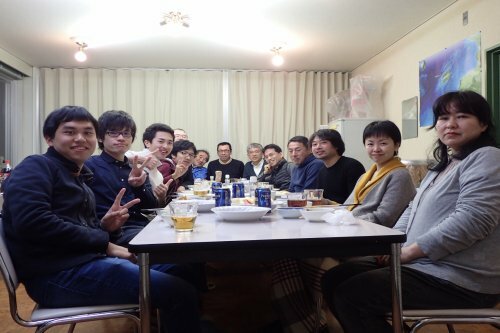 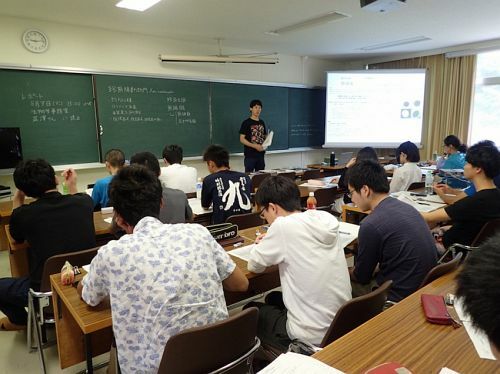 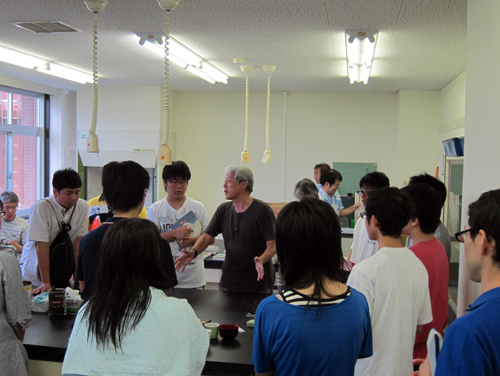 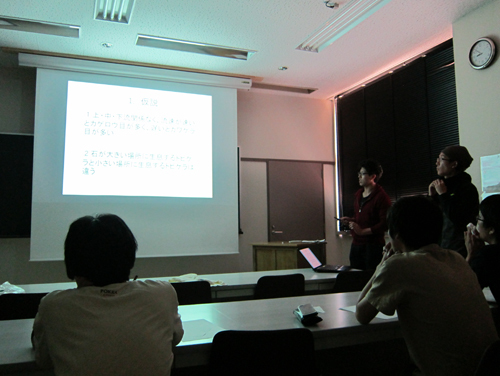 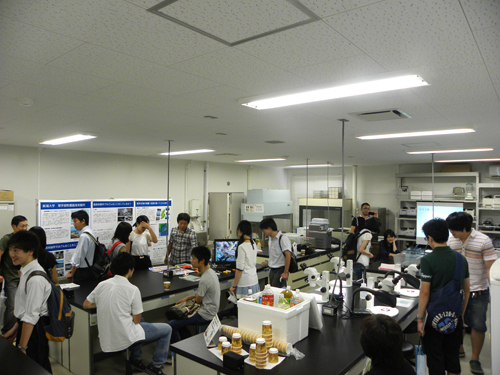 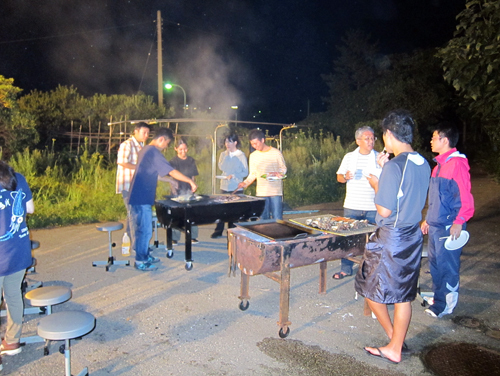 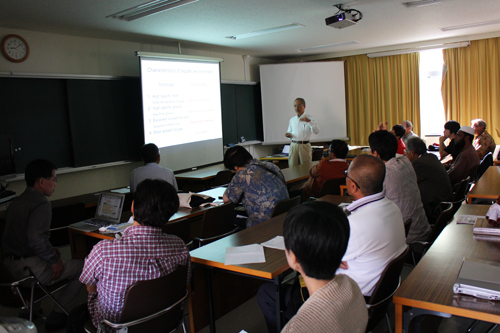 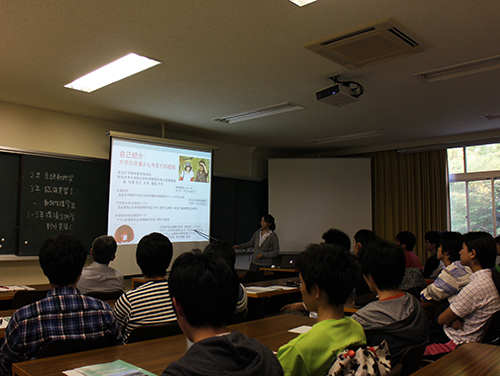 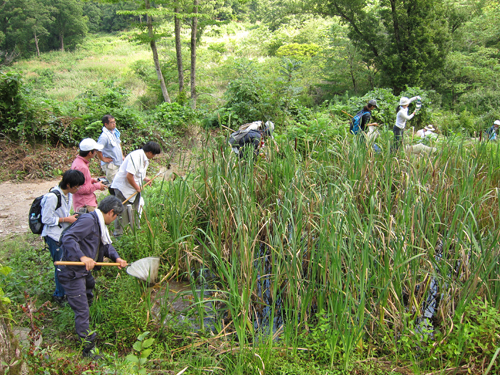 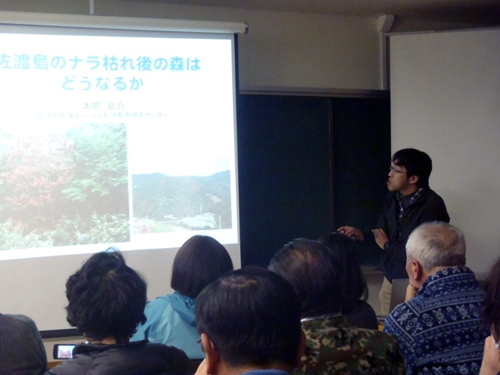 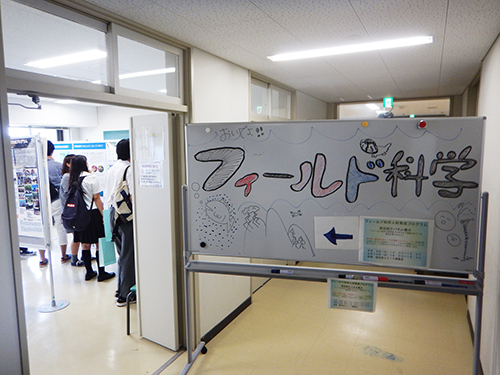 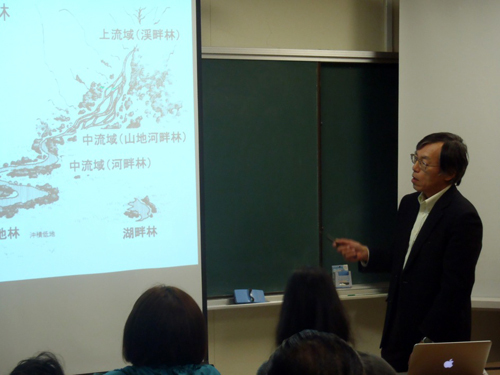 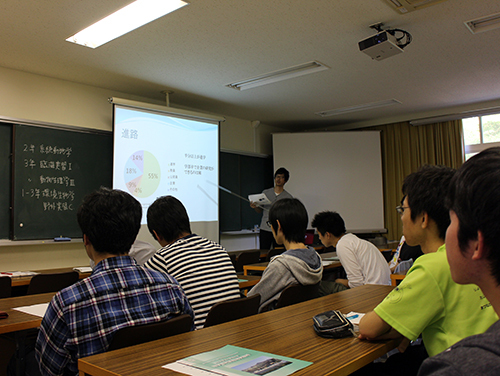 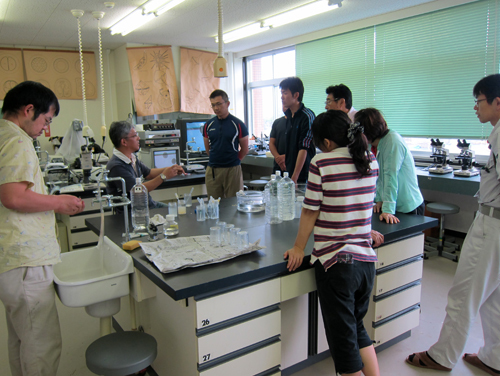 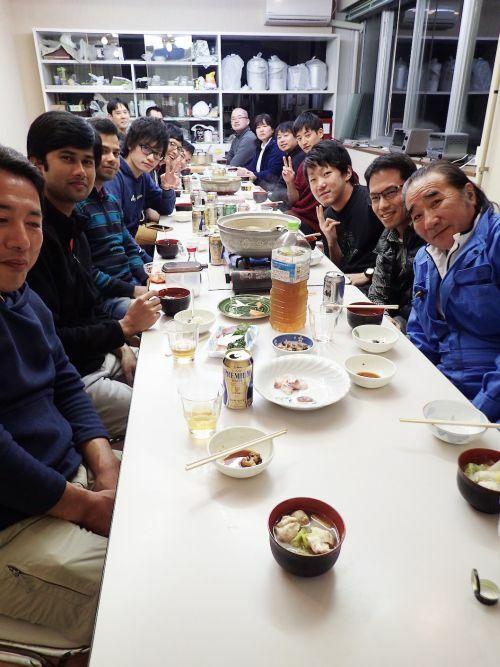 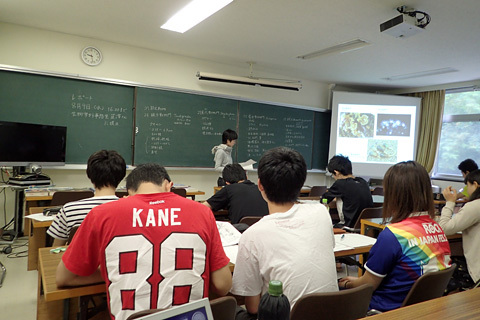 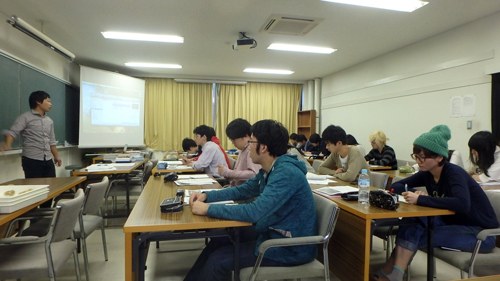 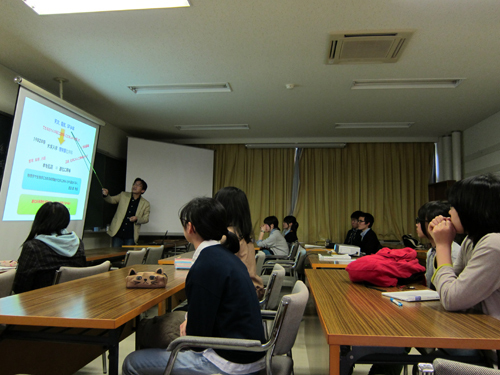 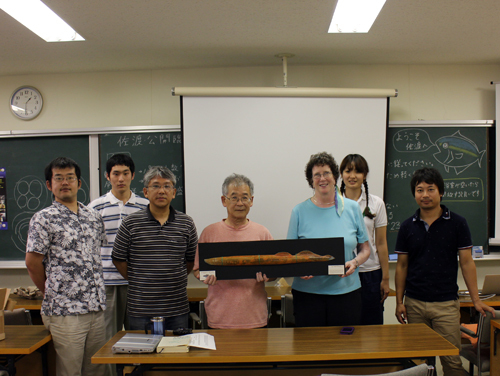 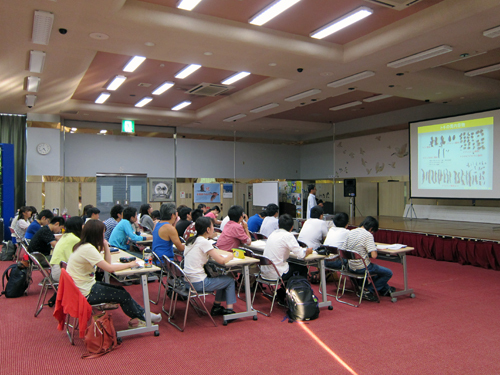 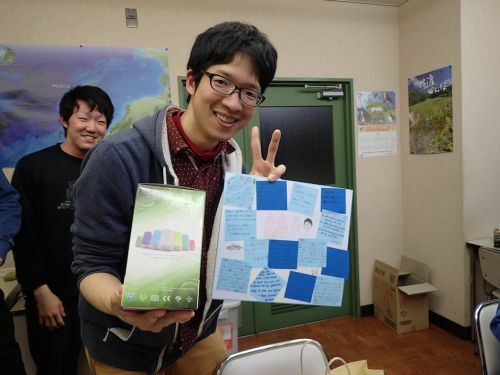 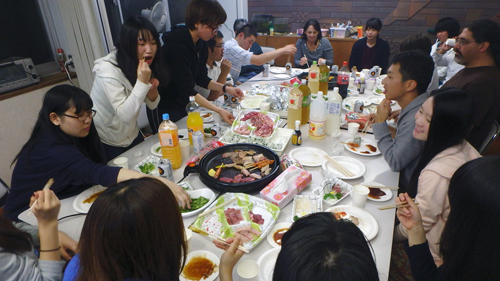 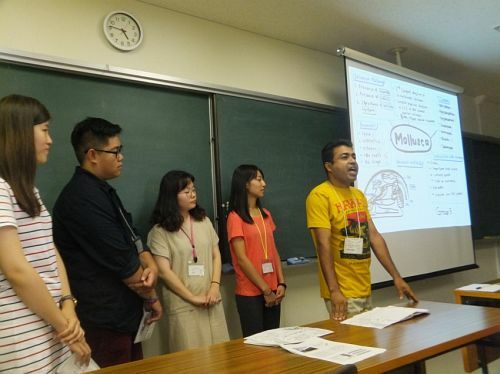 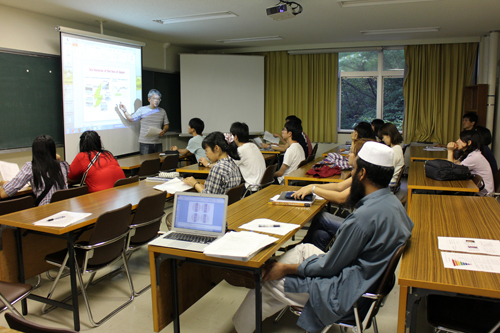 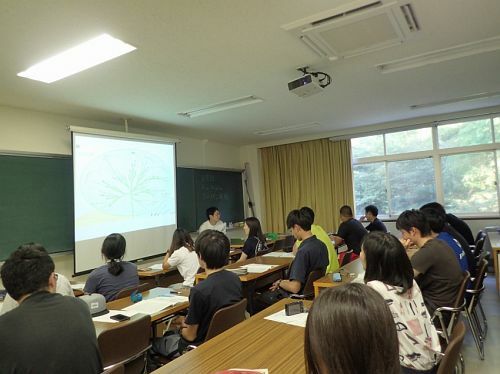 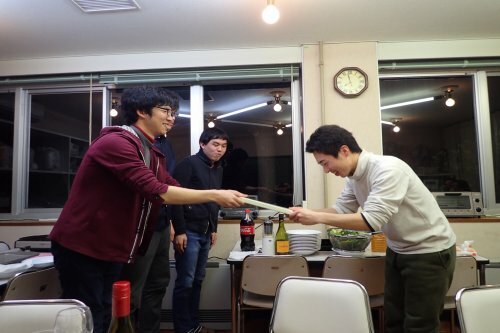 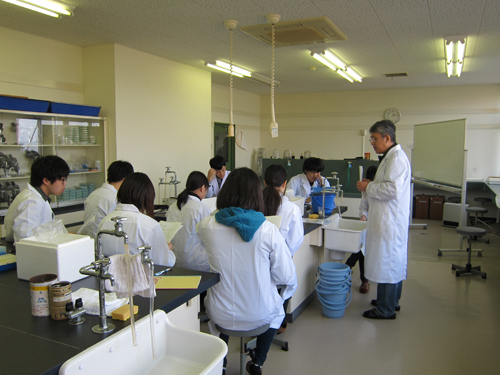 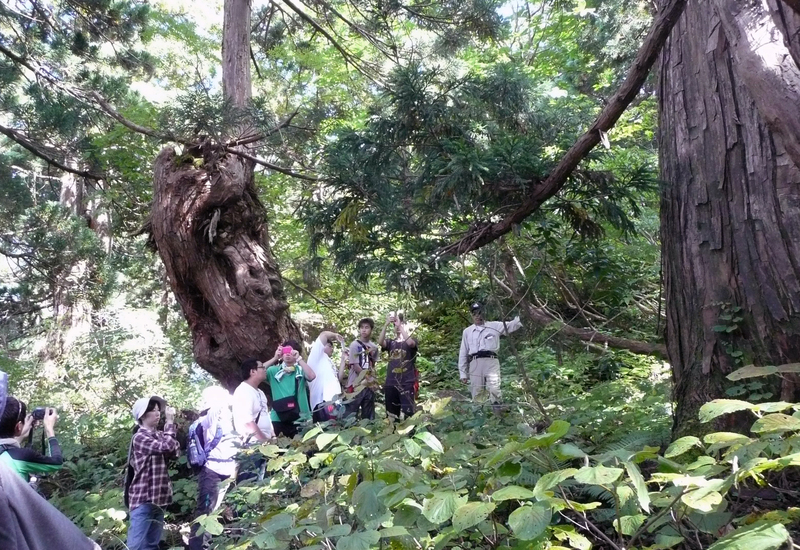 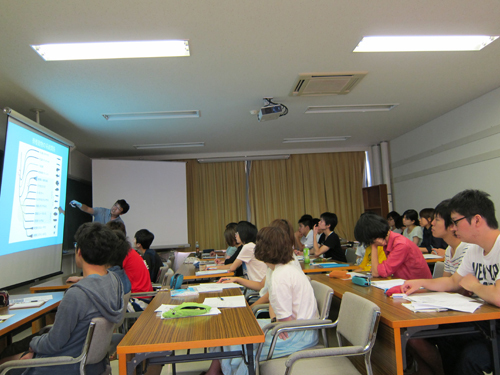 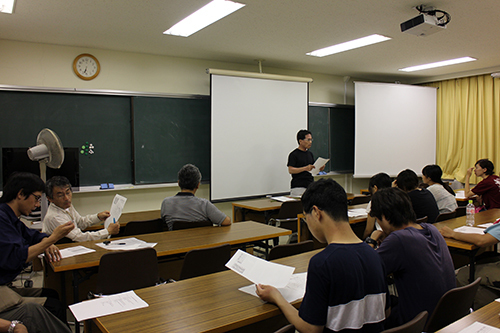 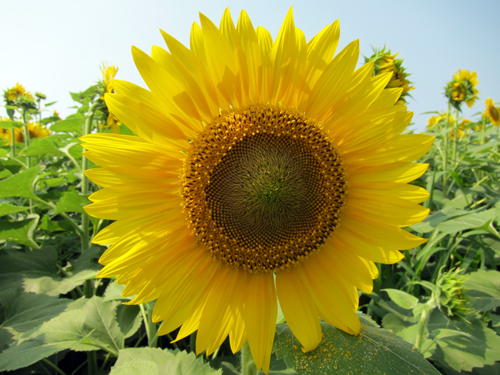 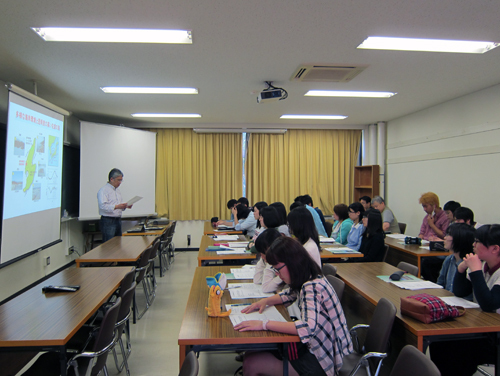 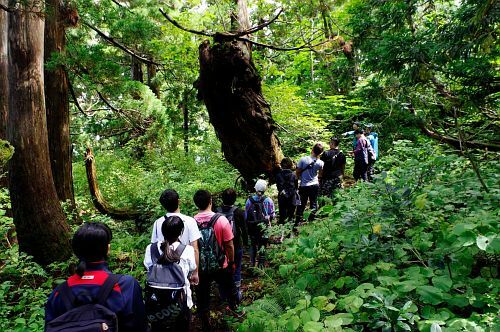 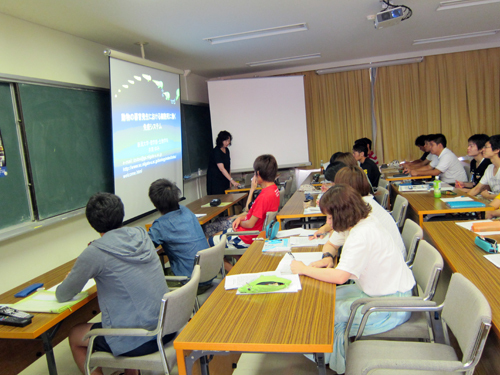 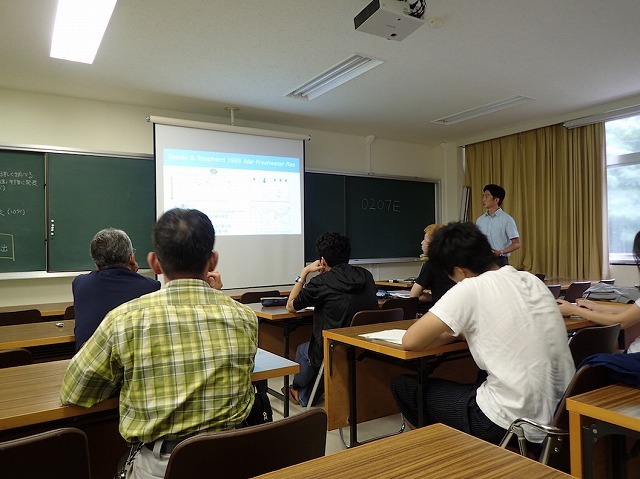 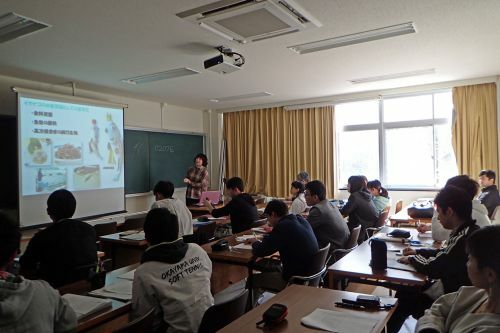 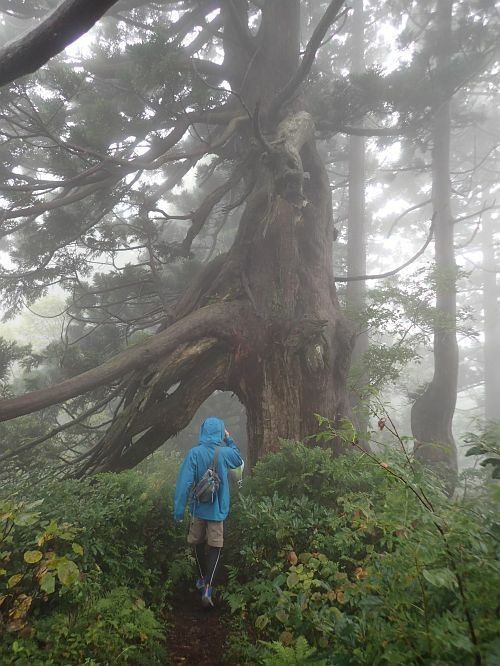 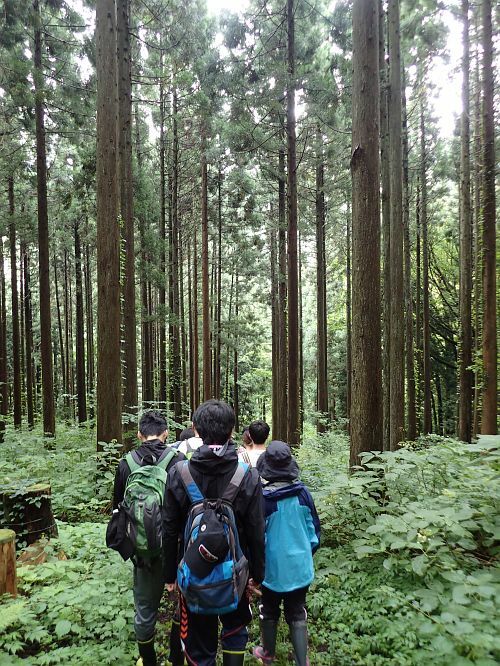 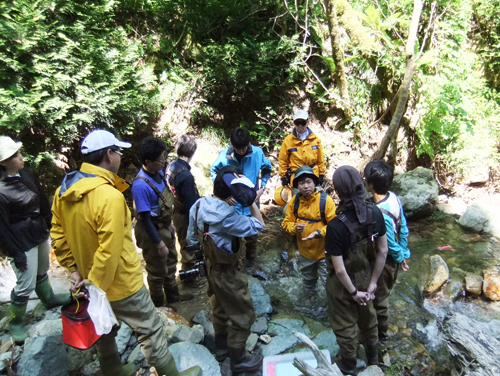 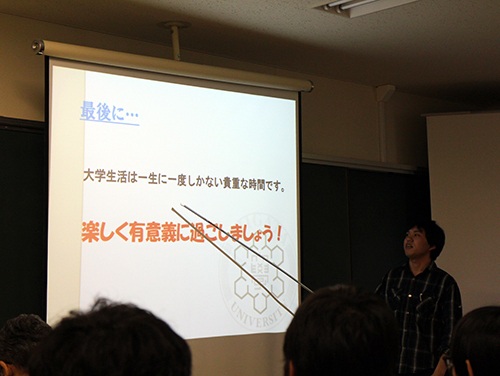 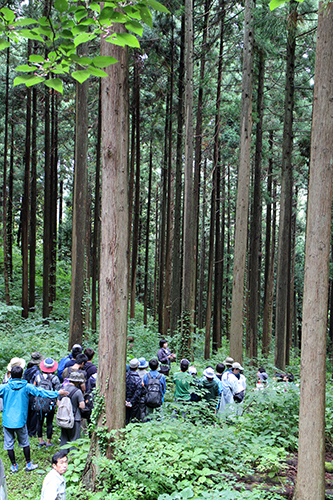 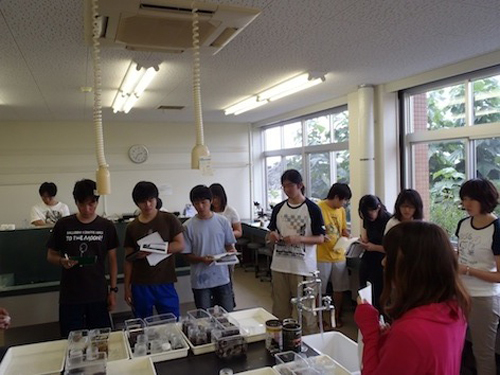 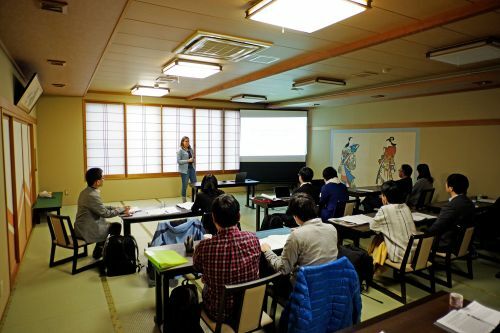 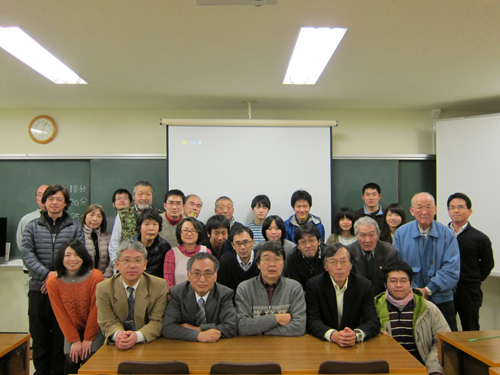 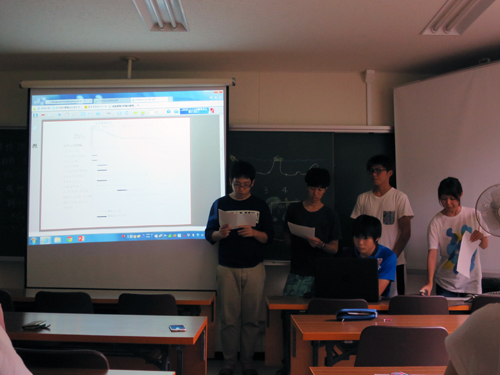 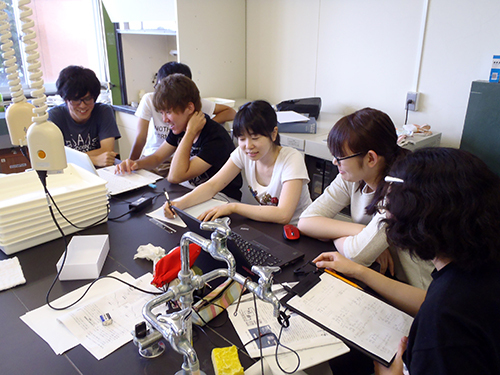 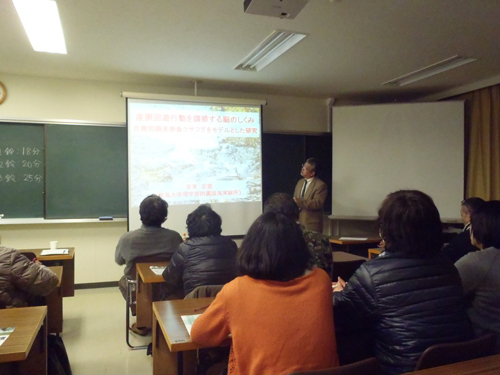 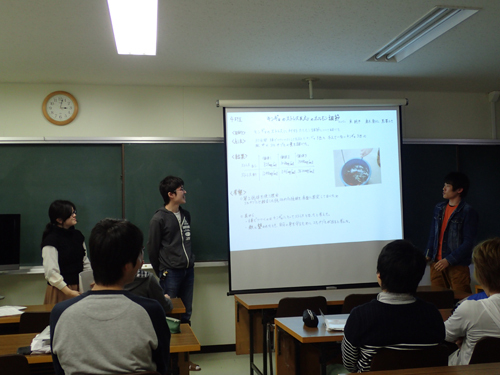 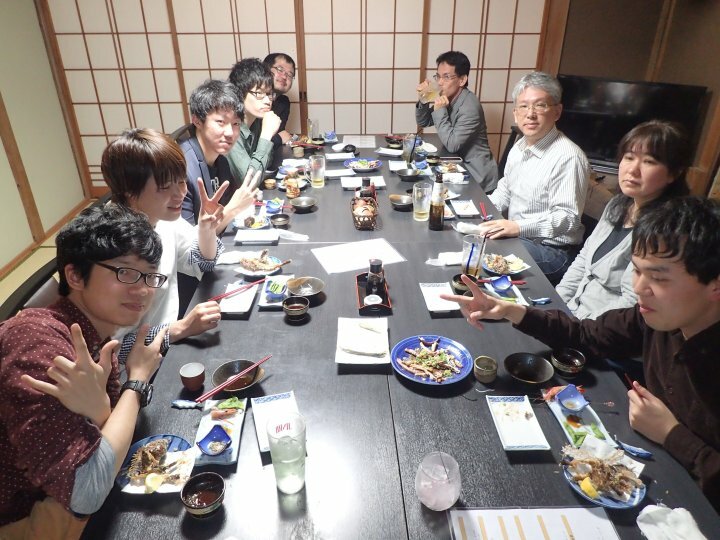 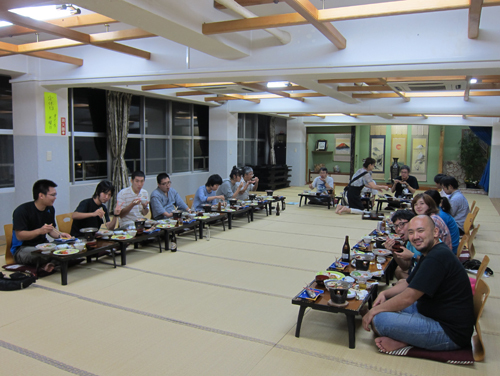 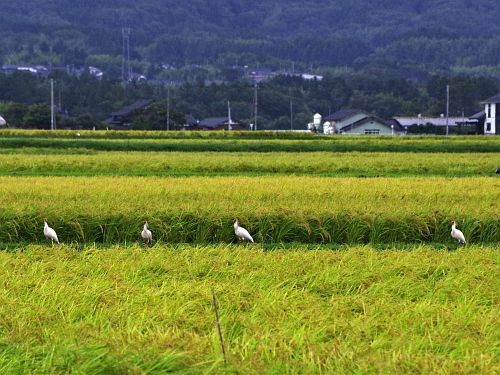 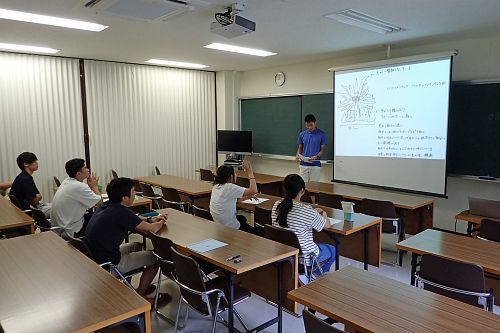 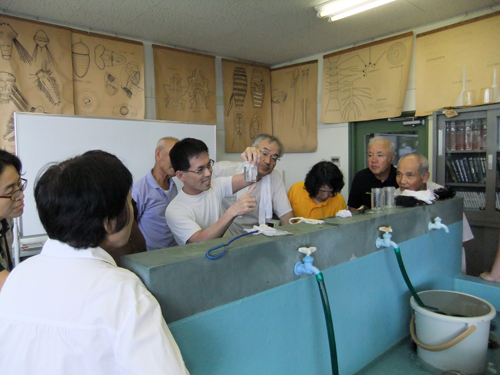 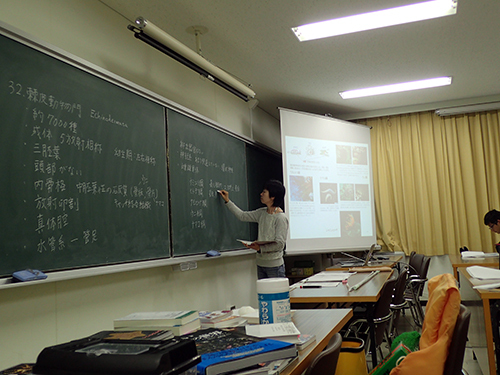 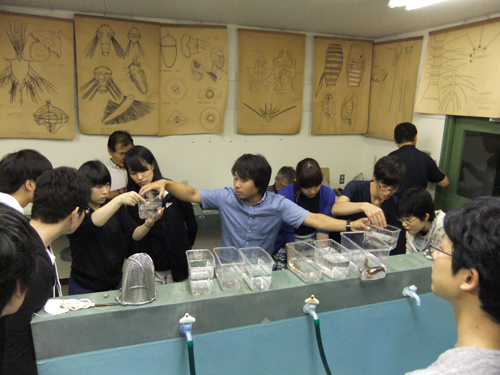 SMBS accepts practical courses not only for Japanese but for foreign participants. 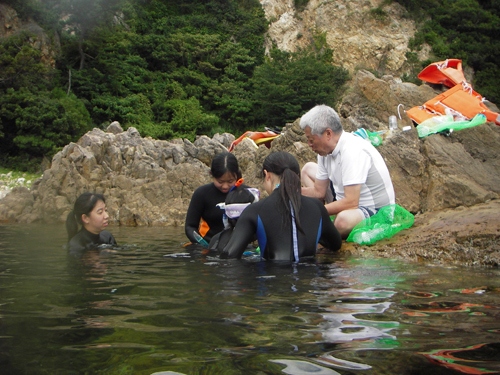 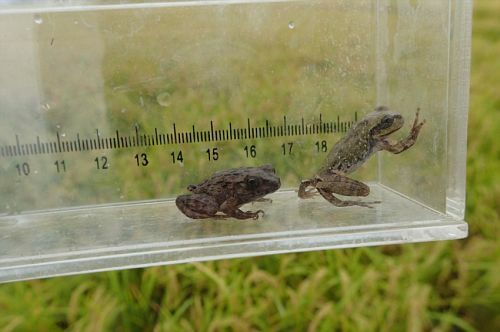 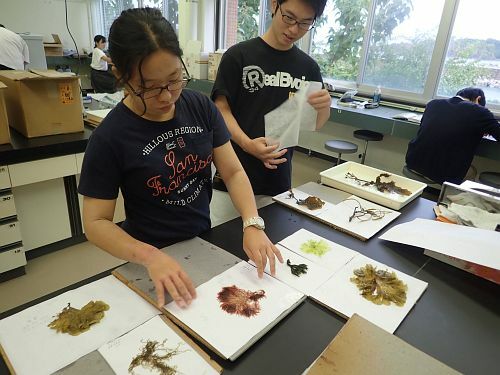 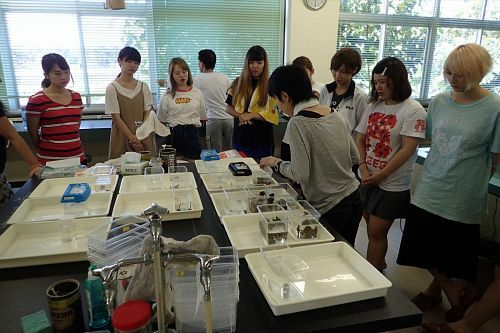 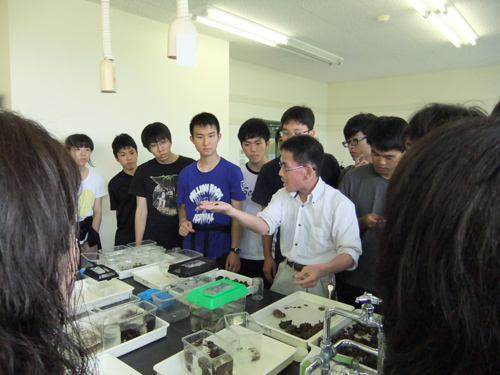 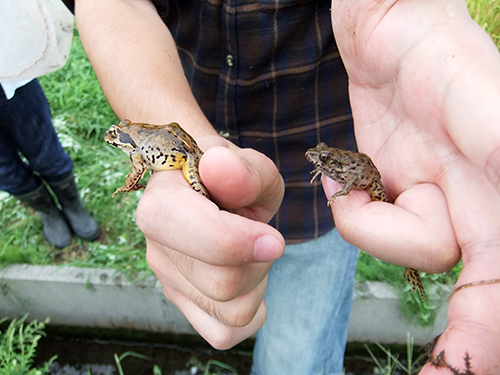 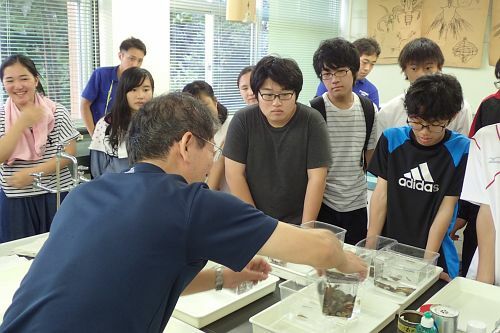 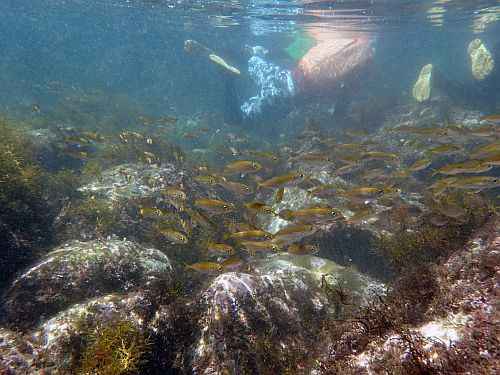 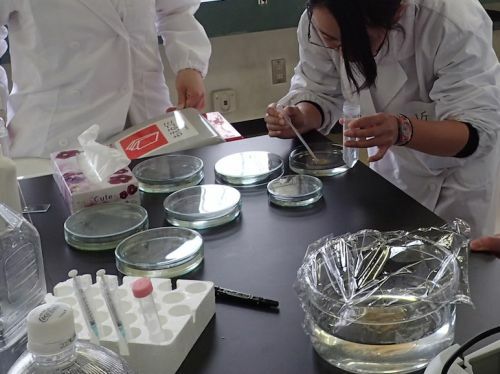 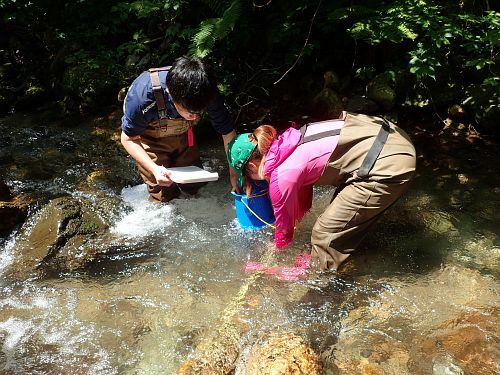 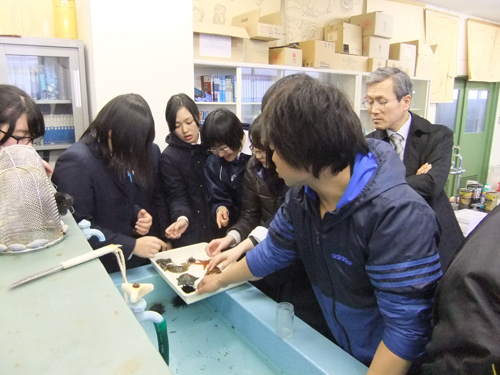 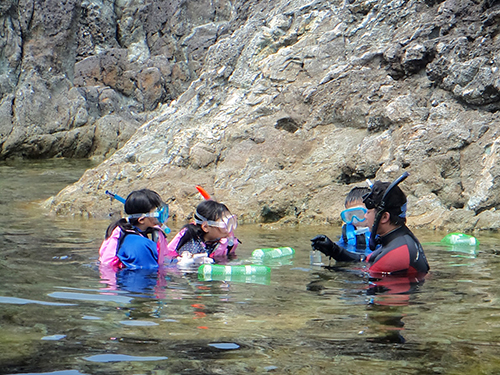 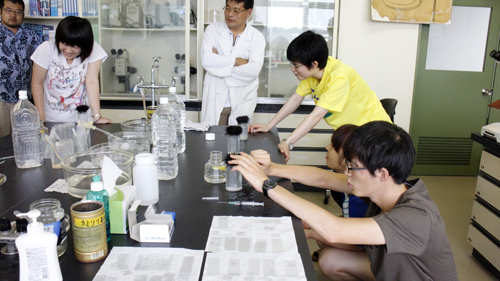 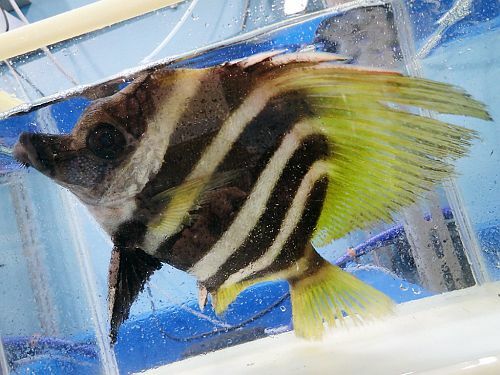 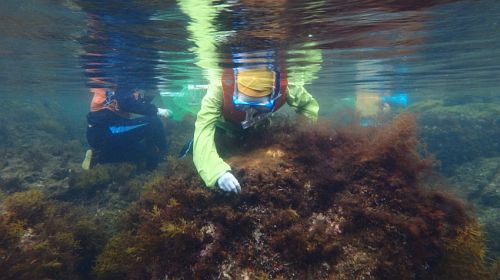 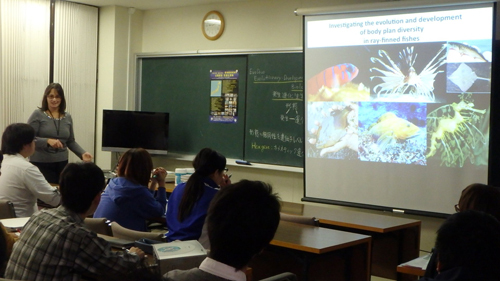 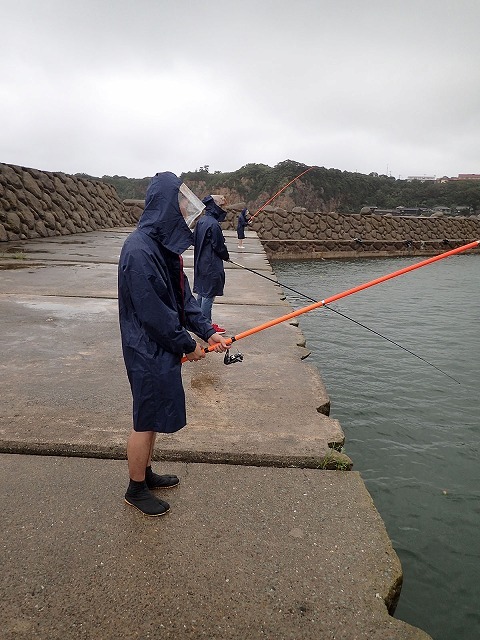 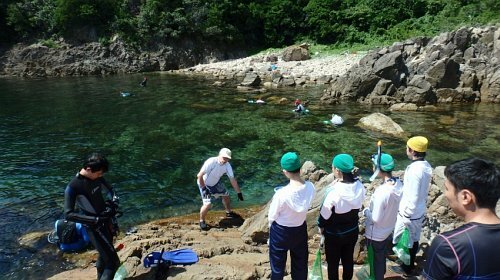 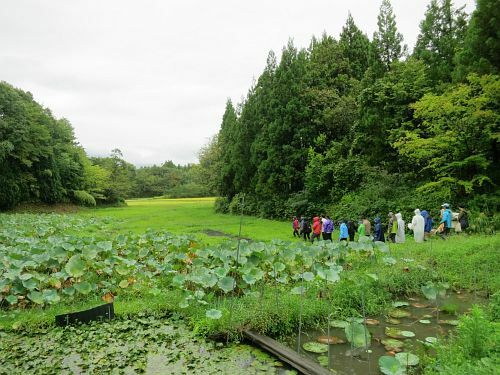 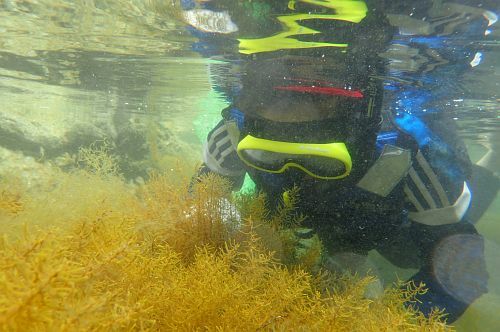 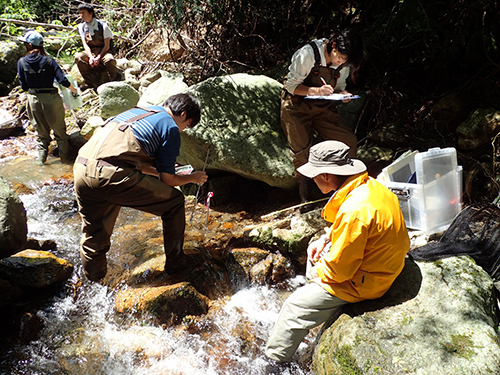 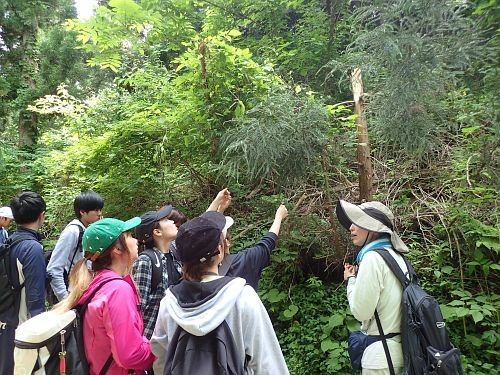 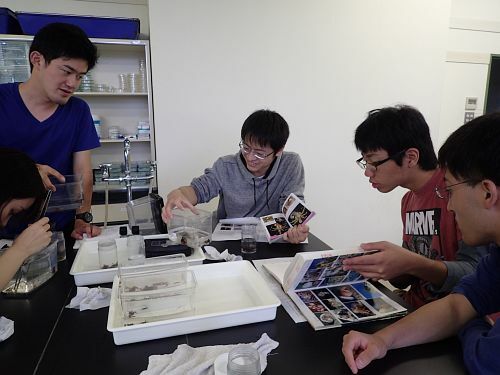 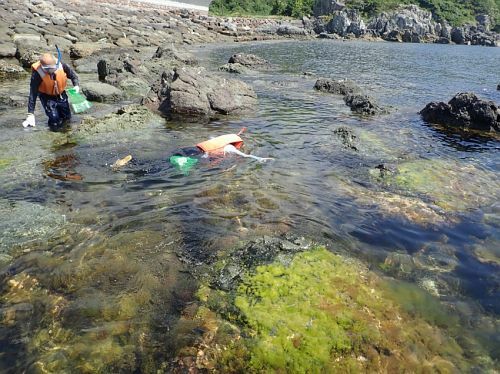 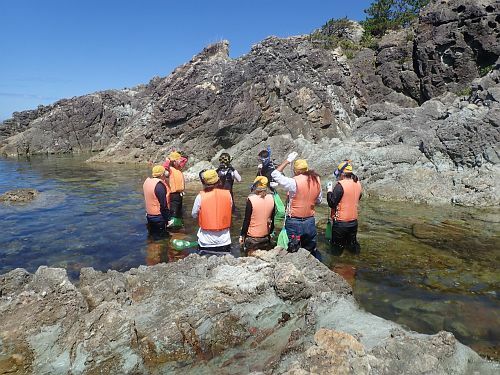 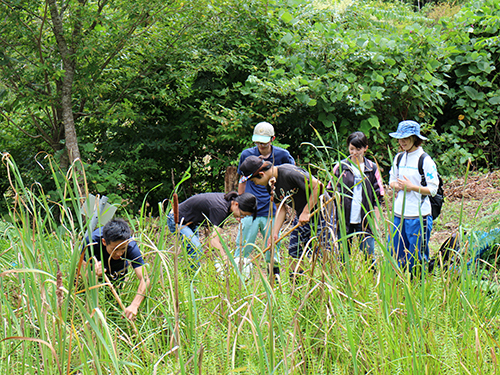 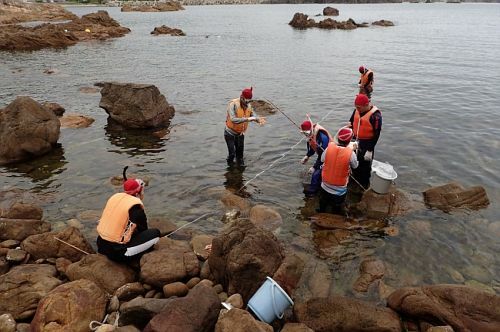 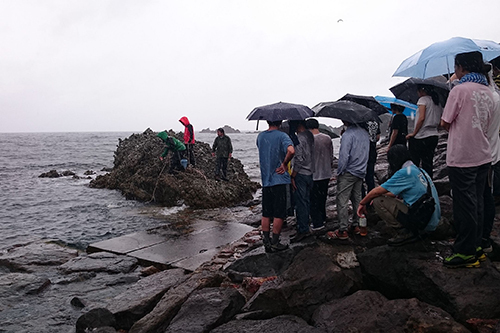 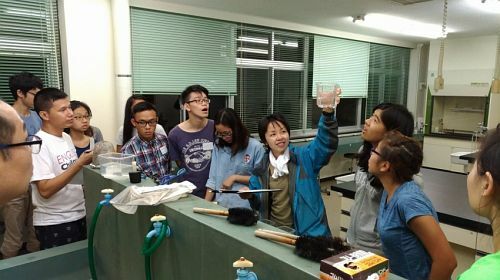 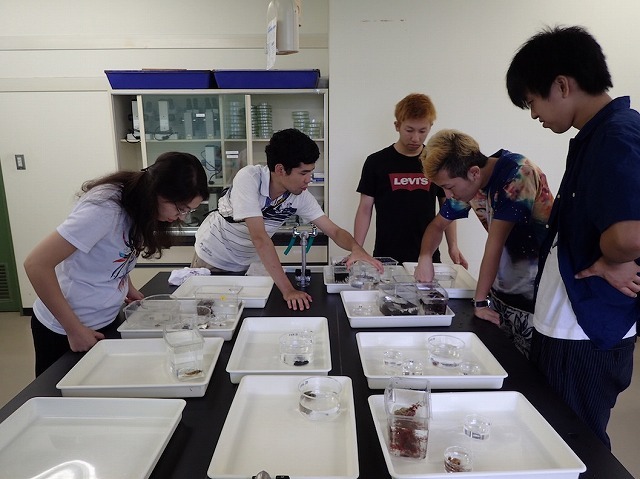 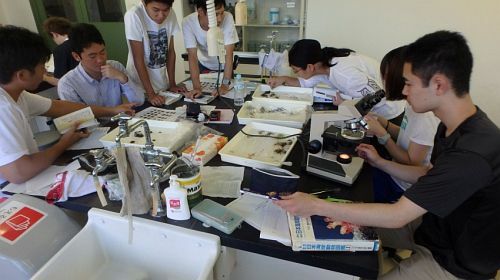 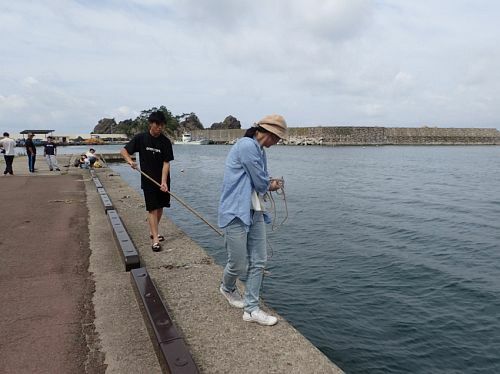 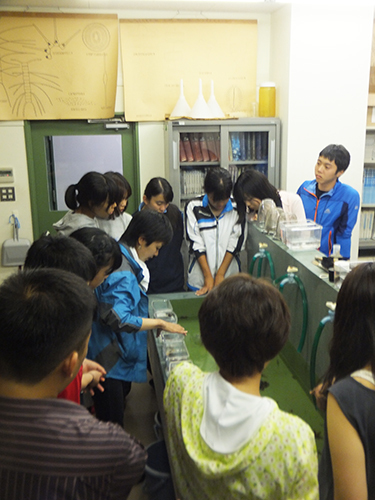 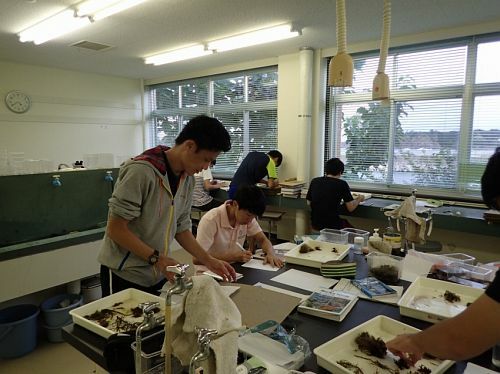 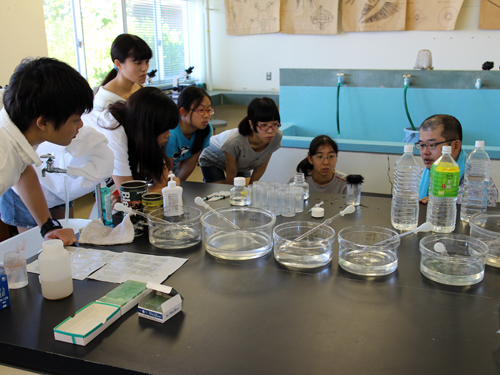 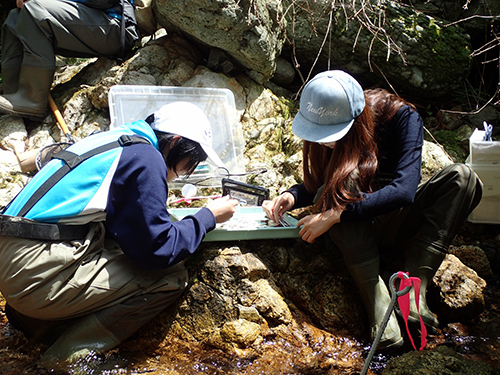 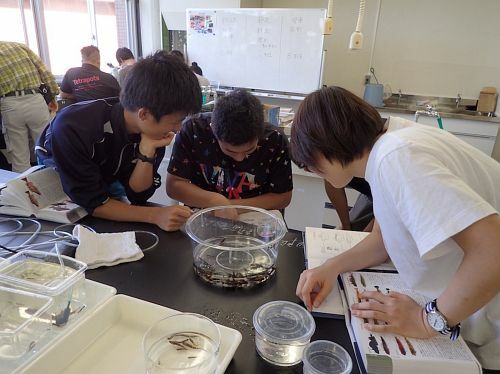 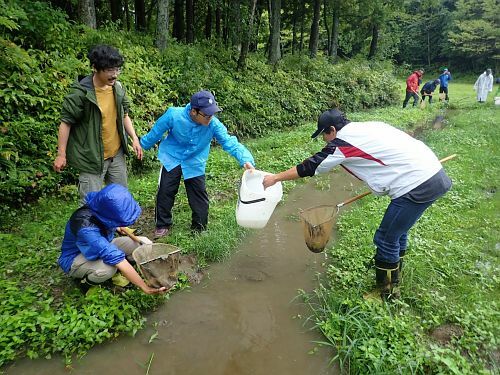 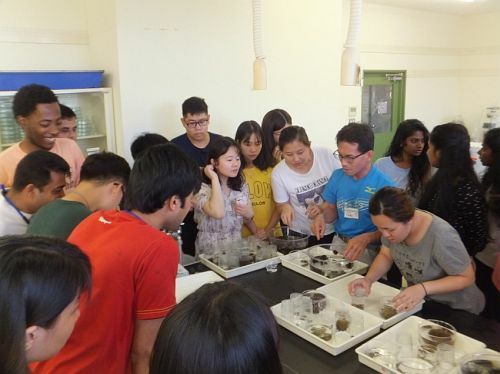 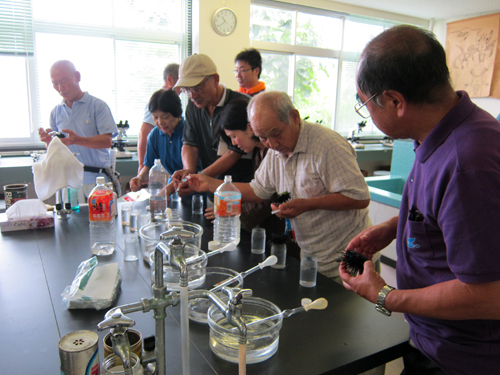 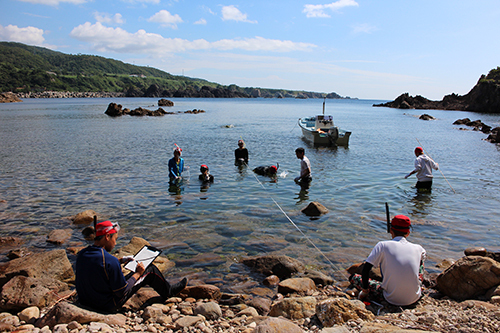 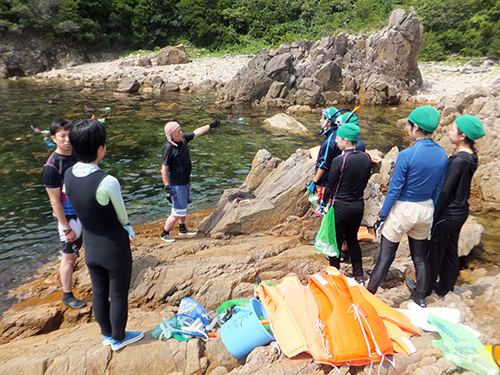 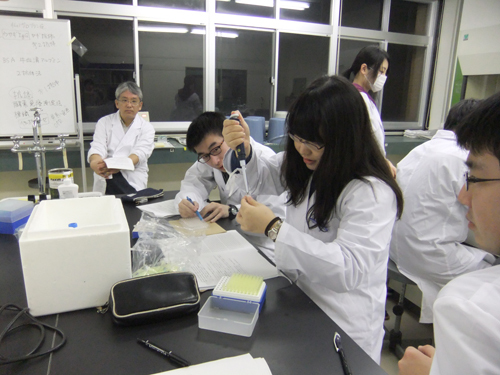 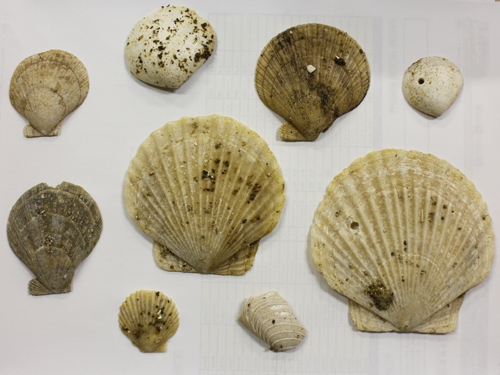 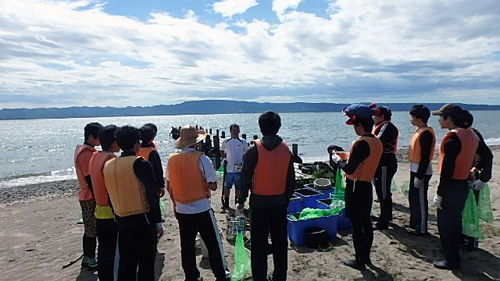 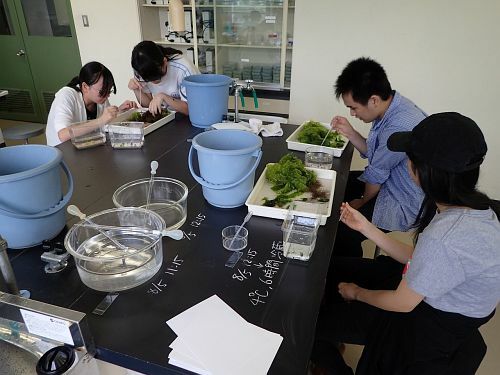 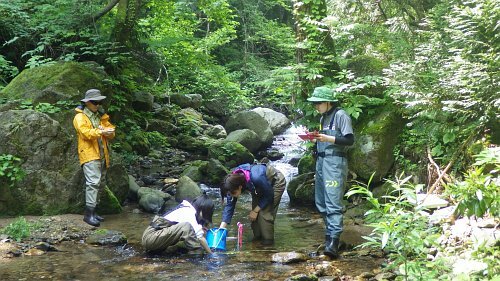 Today, students and a teacher from Xishuangbanna Tropical Botanical Garden, Chinese Academy of Science, joined a practical marine biology course at SMBS. 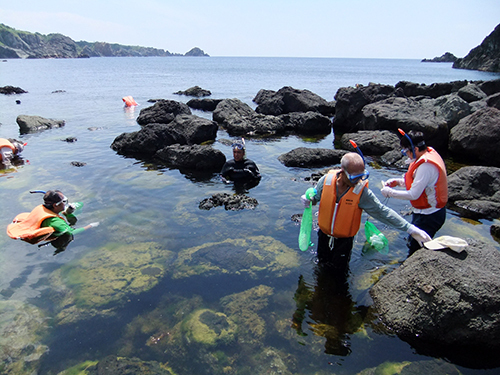 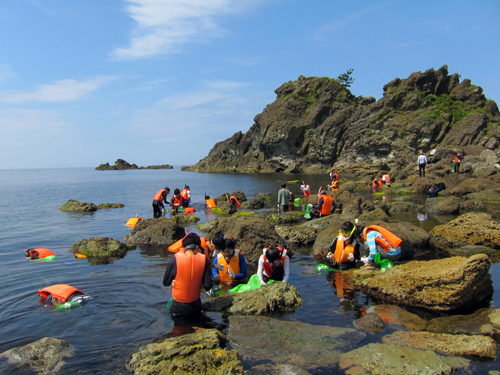 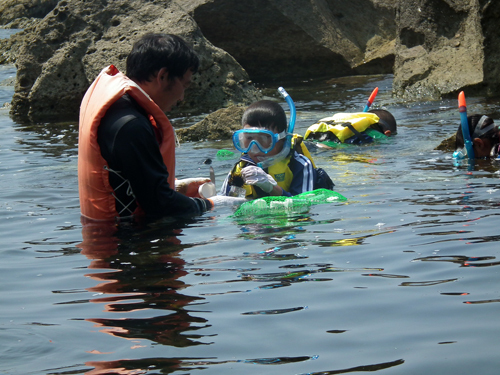 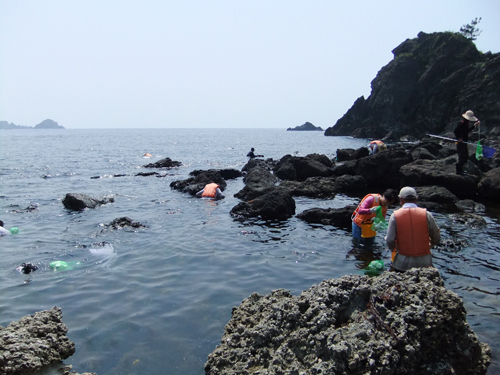 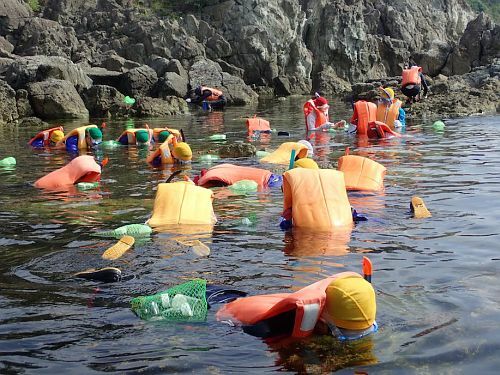 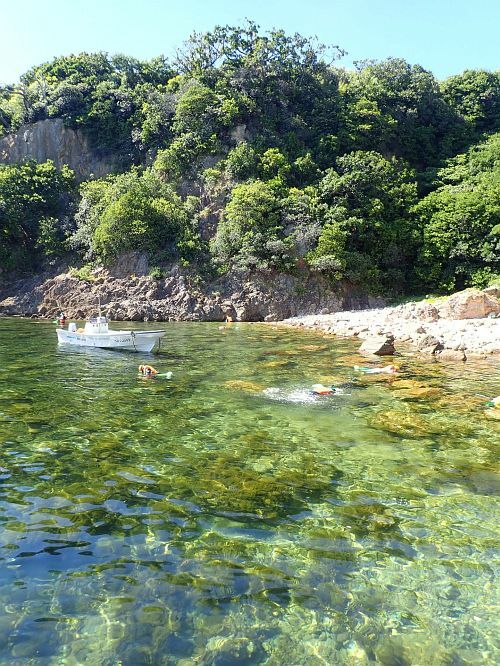 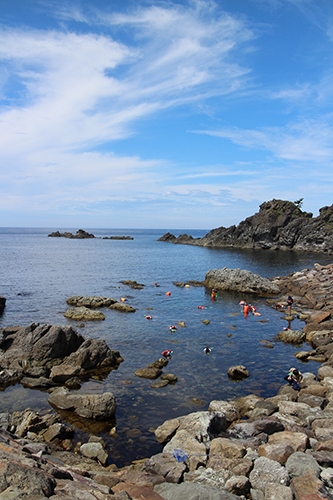 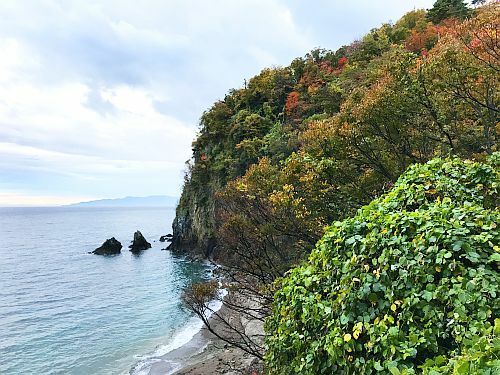 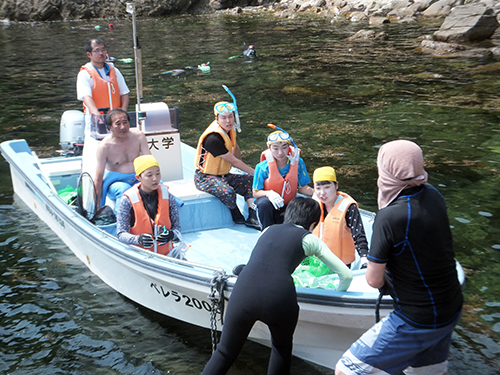 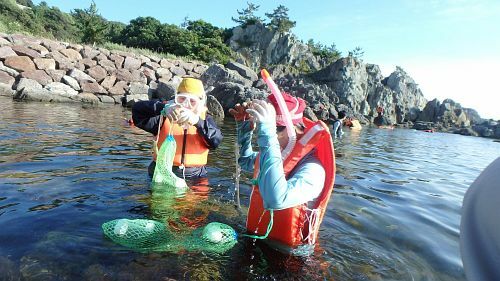 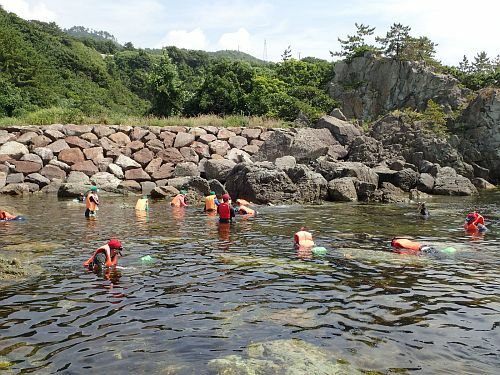 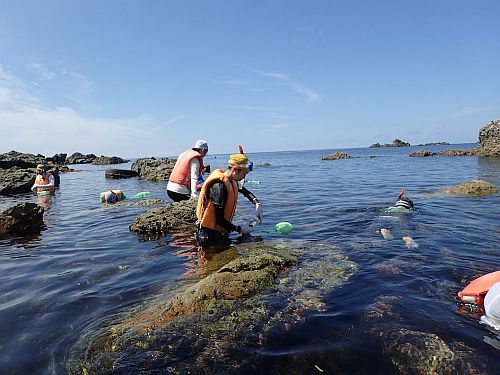 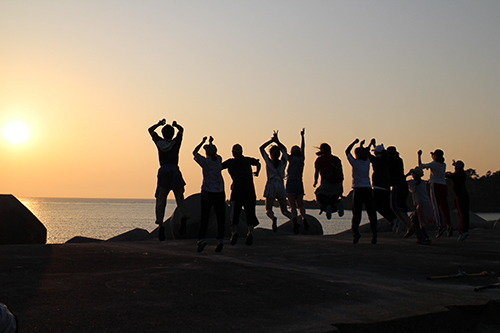 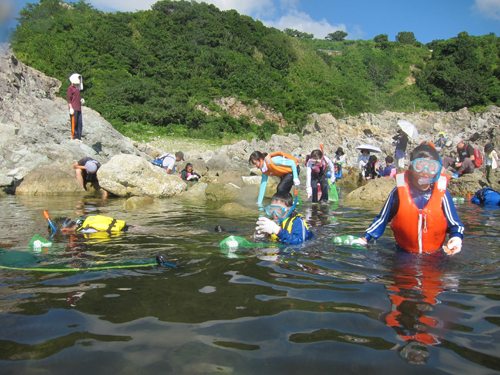 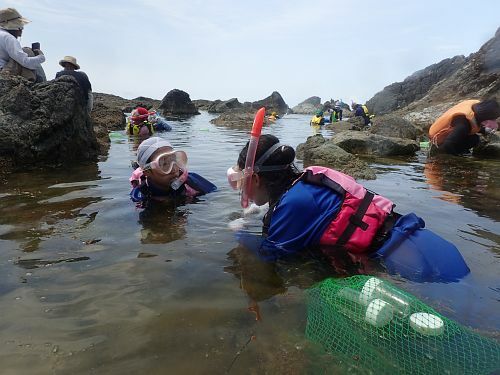 Although some participants had just arrived Sado Island early in the morning, they were all in high spirits, and enjoyed animal collection by snorkeling. 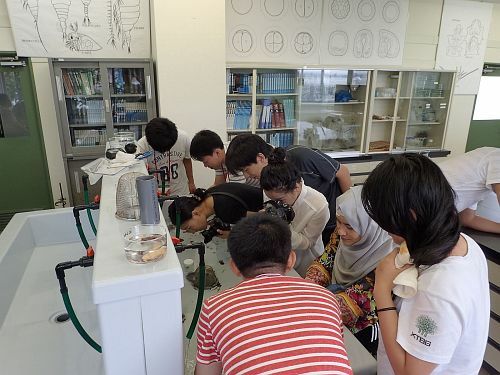 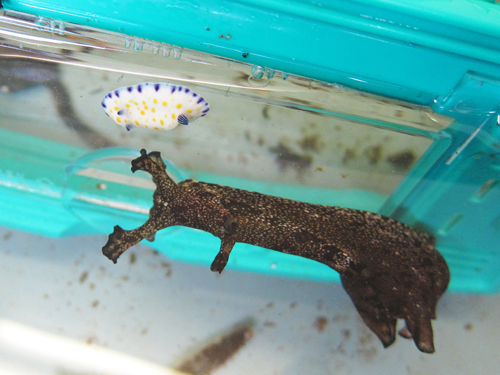 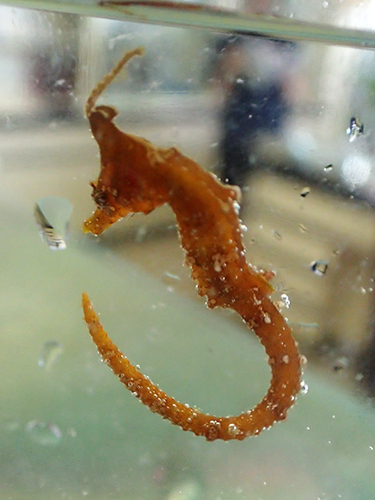 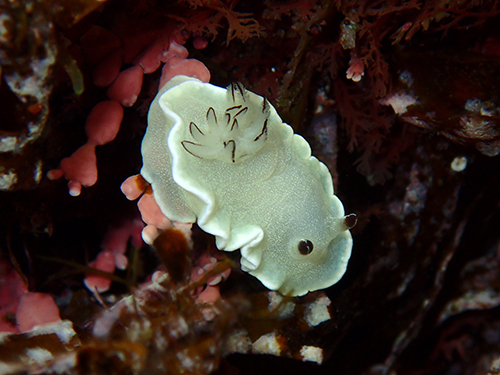 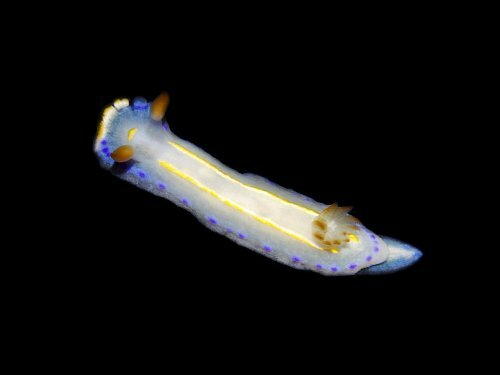 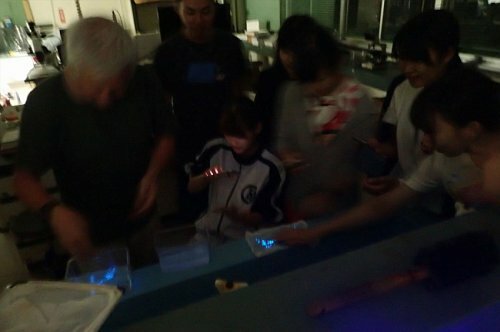 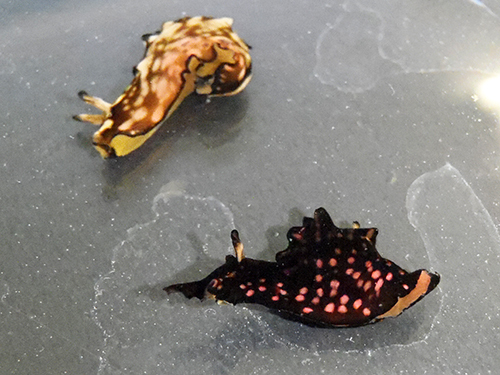 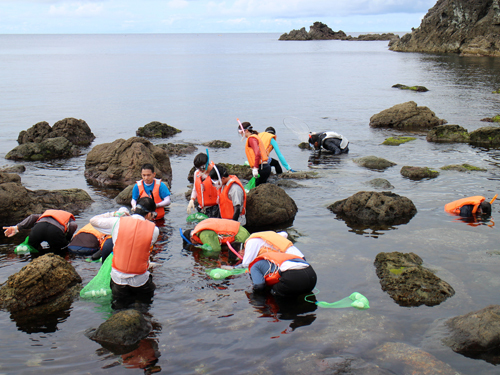 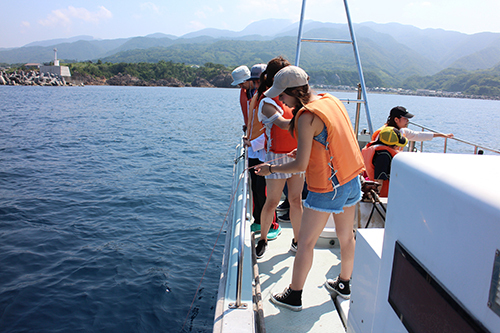 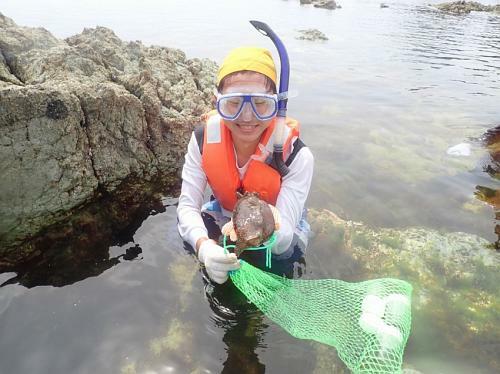 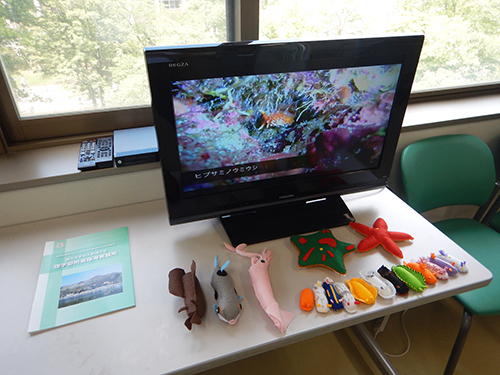 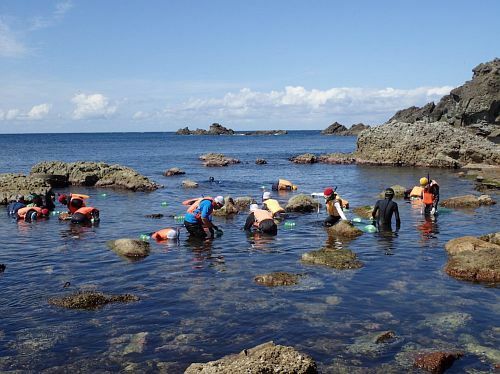 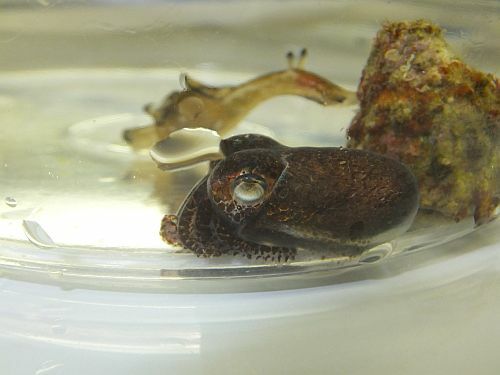 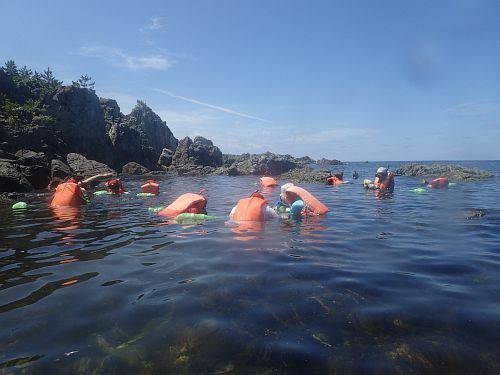 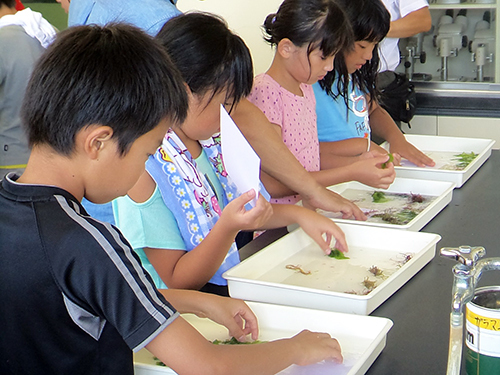 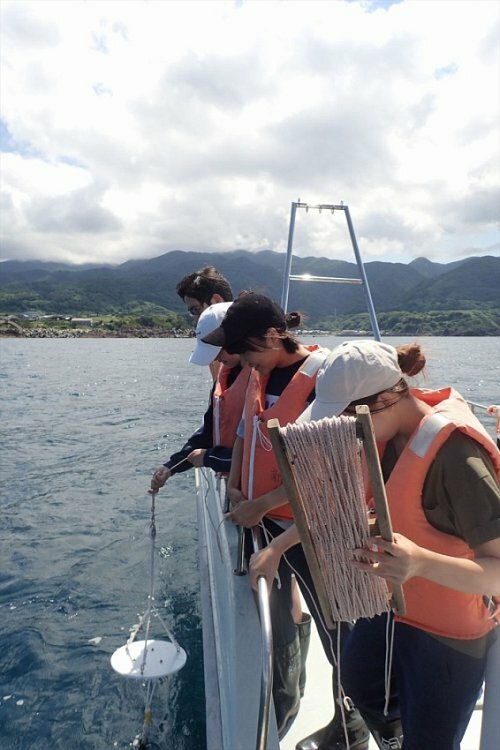 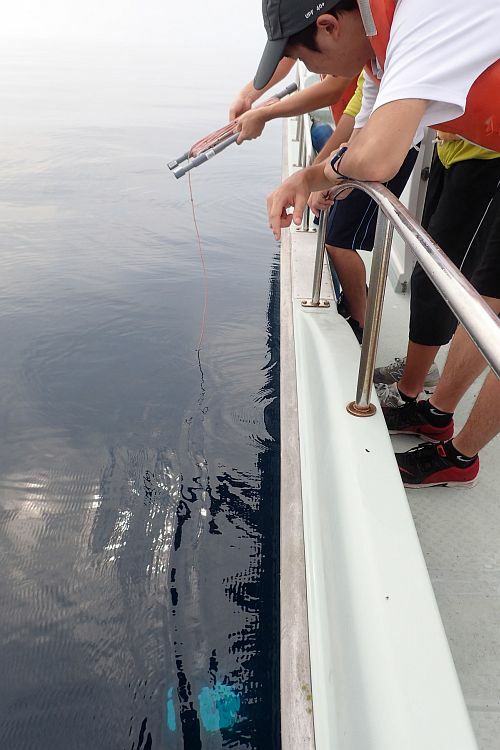 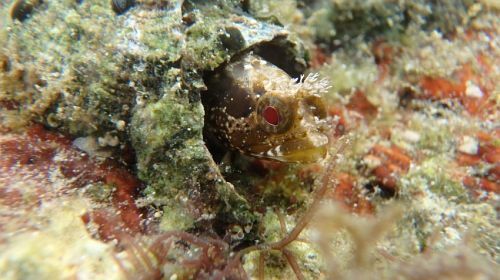 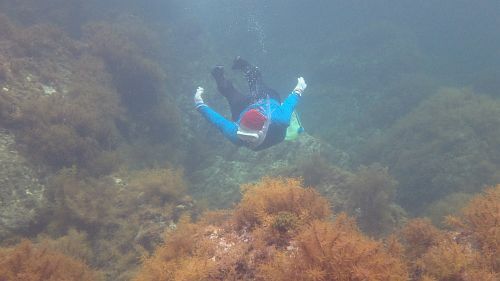 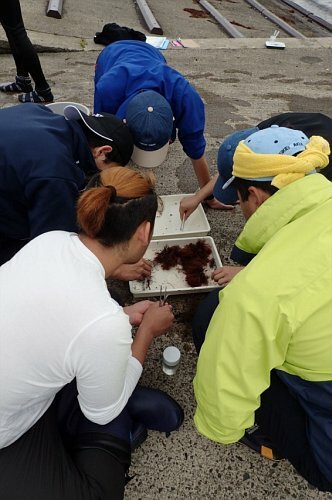 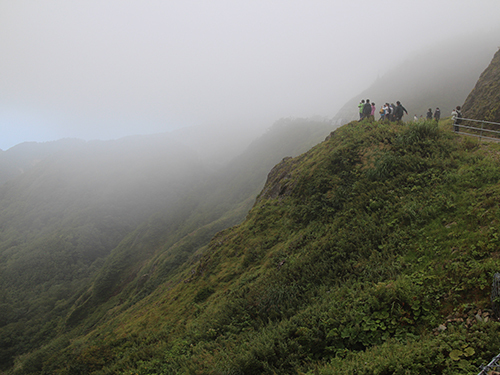 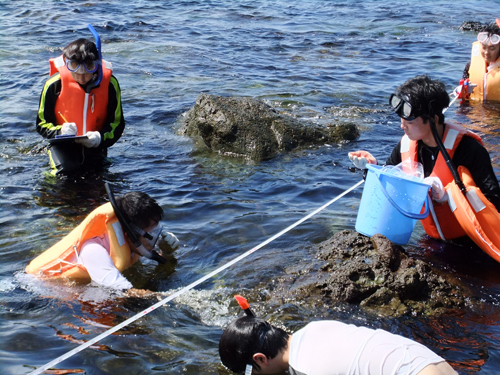 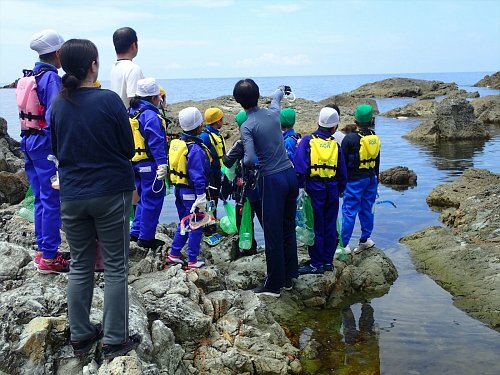 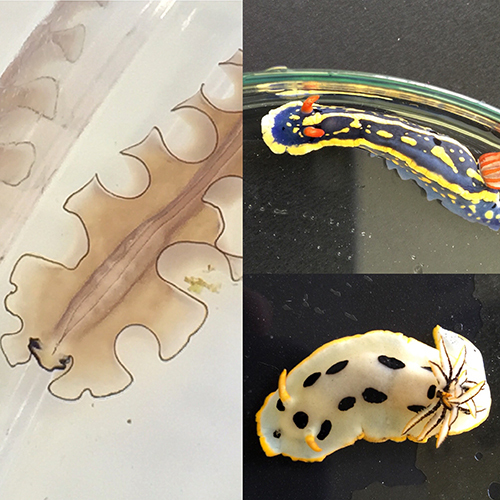 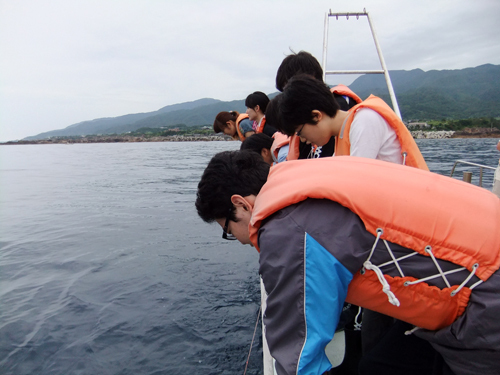 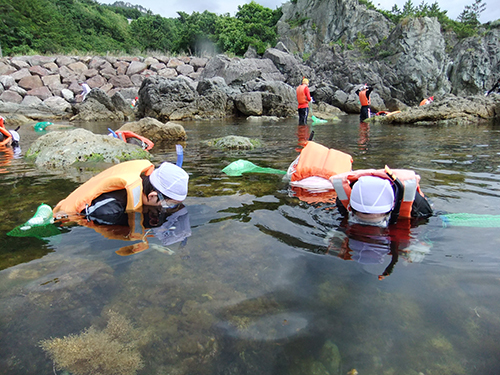 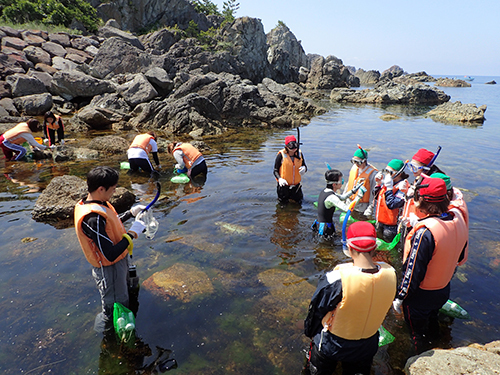 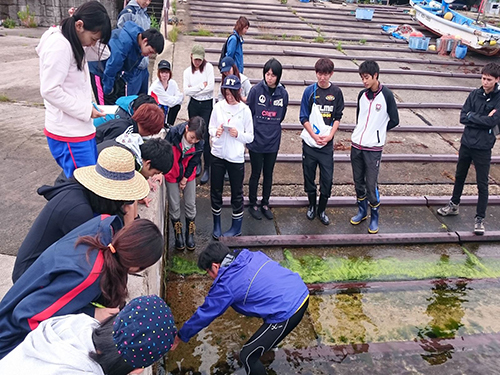 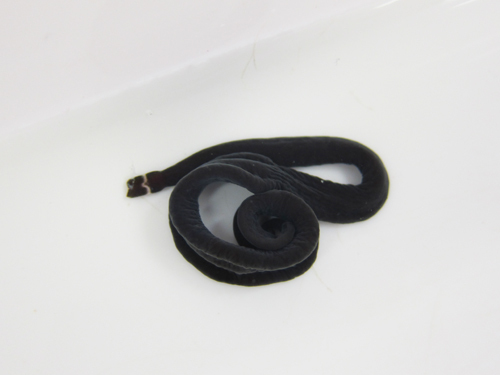 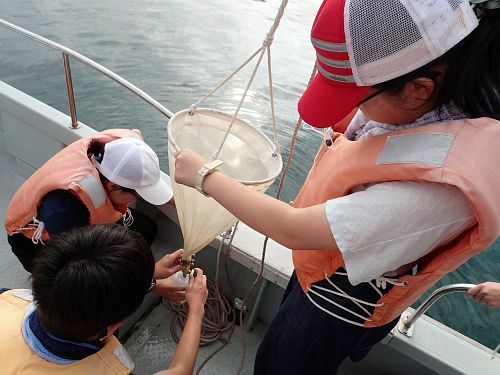 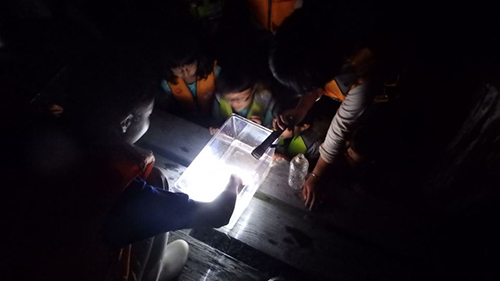 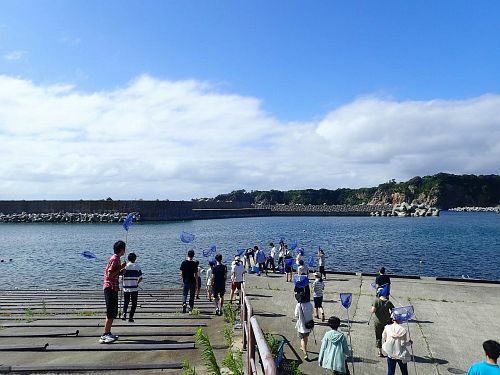 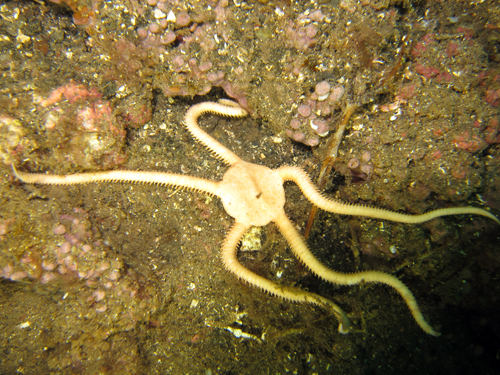 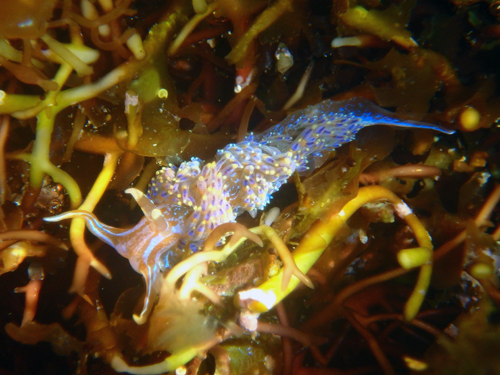 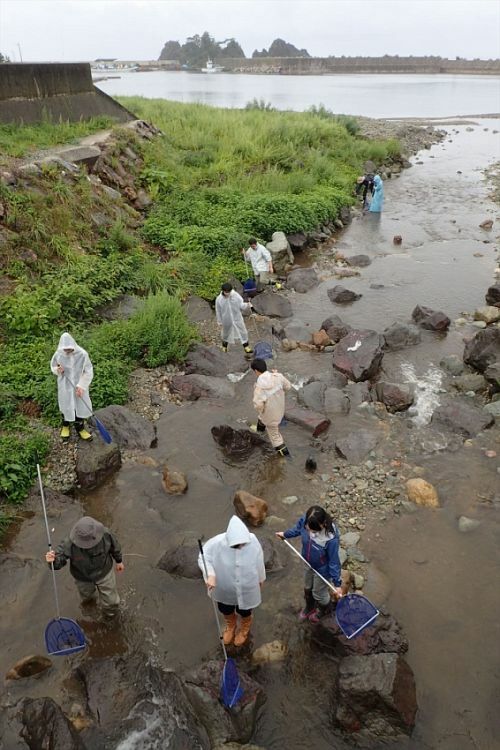 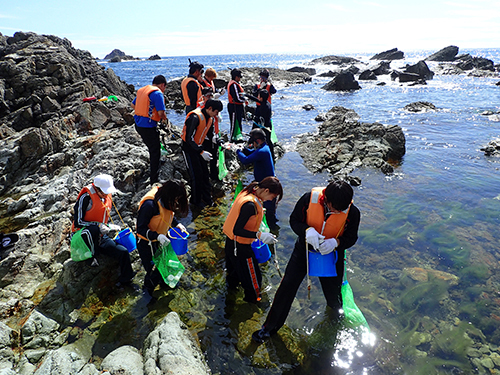 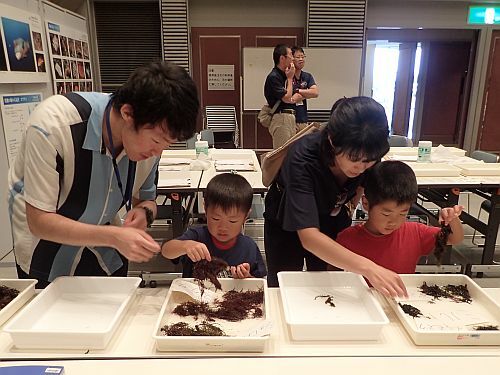 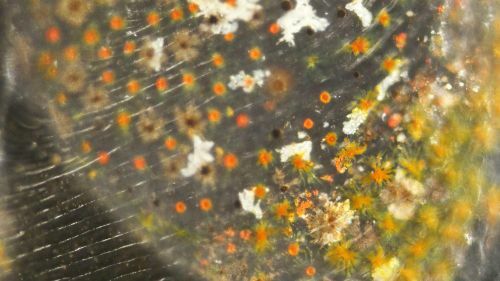 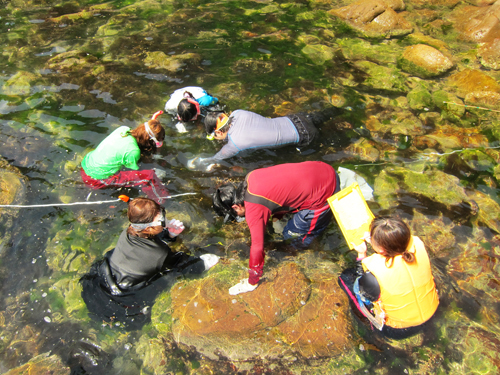 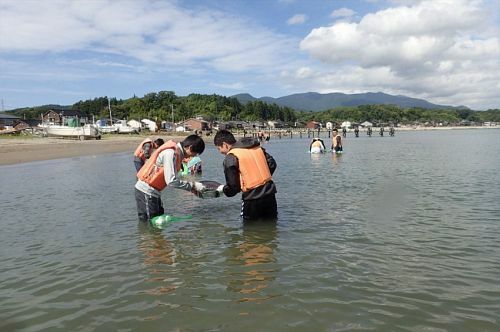 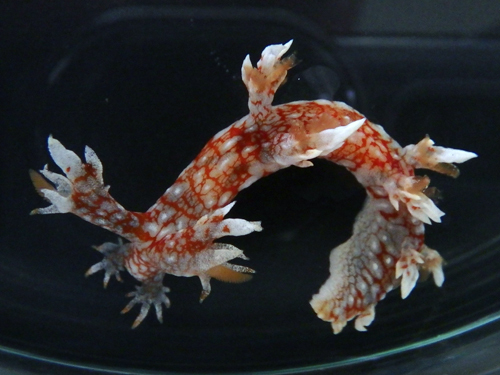 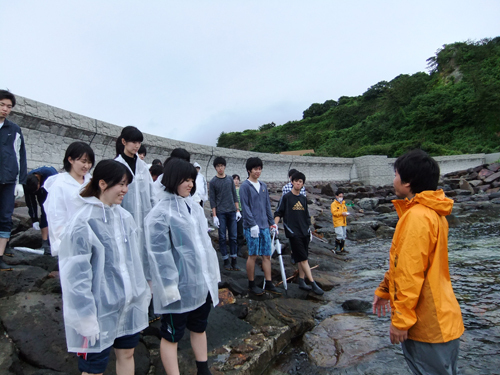 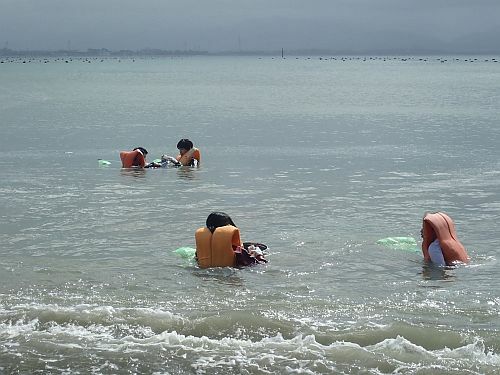 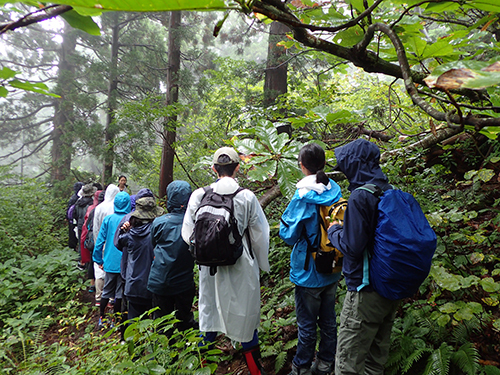 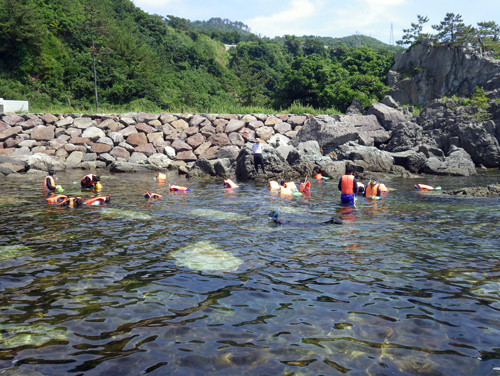 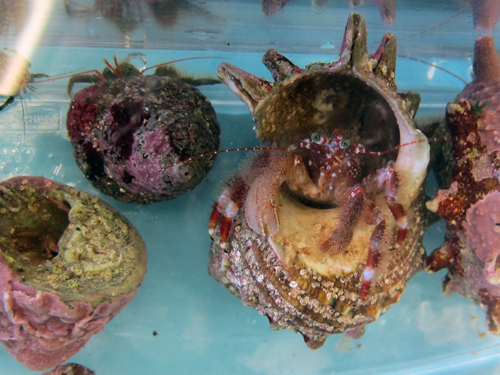 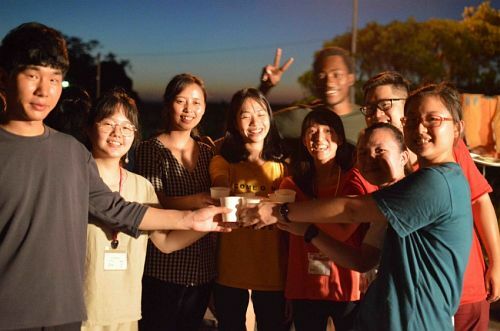 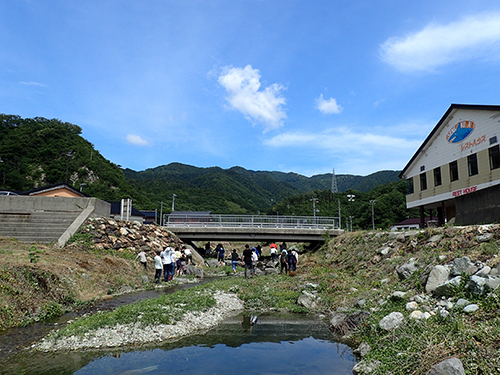 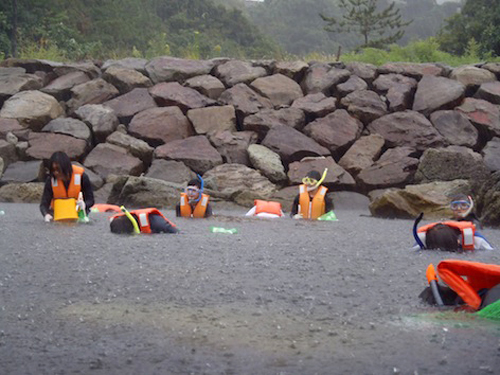 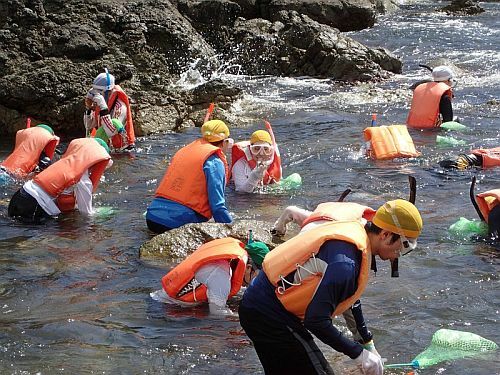 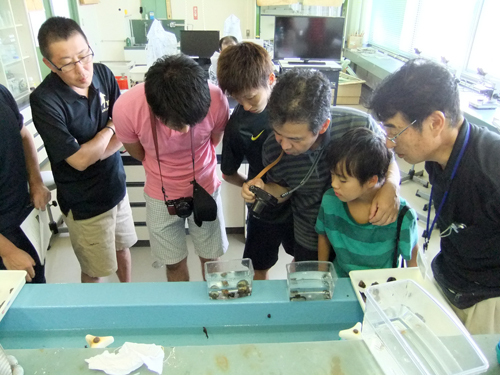 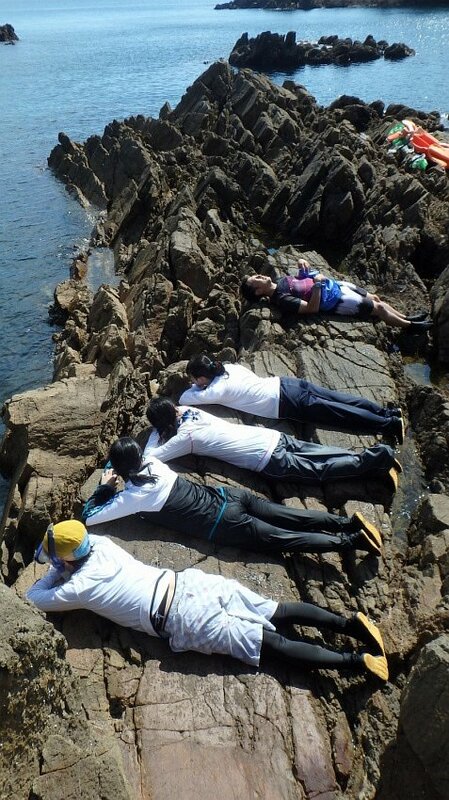 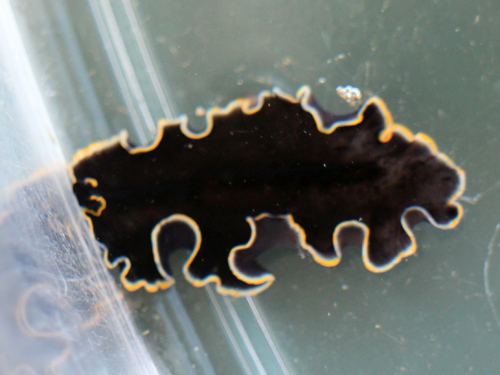 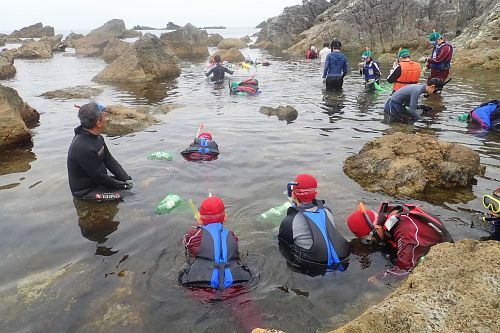 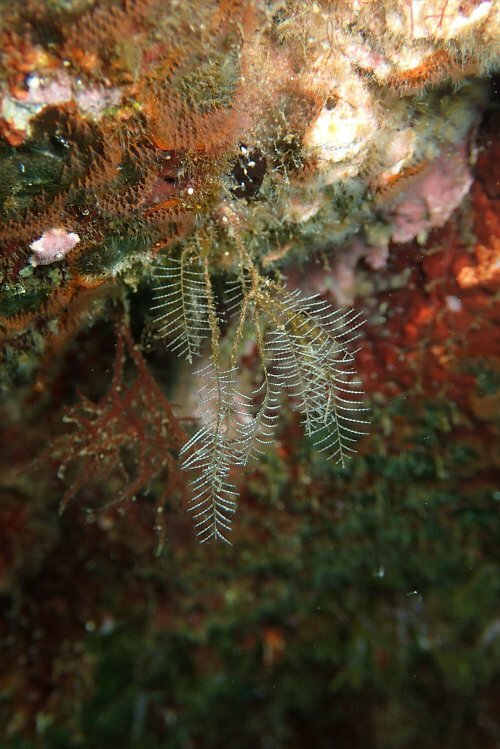 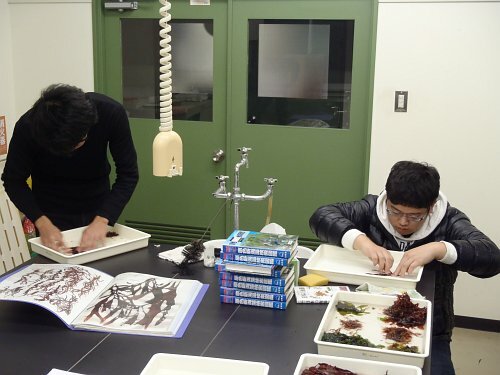 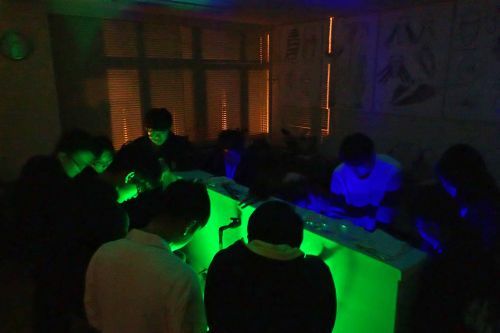 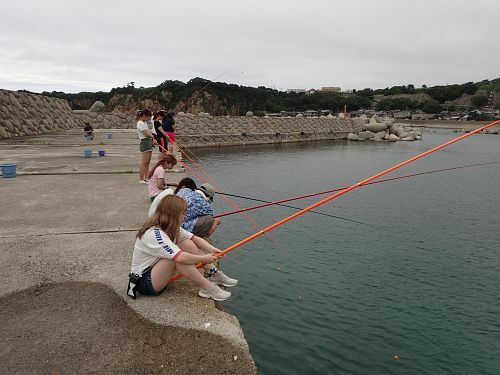 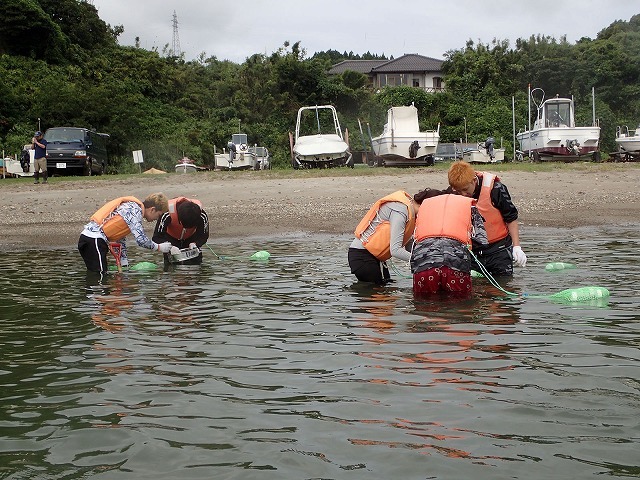 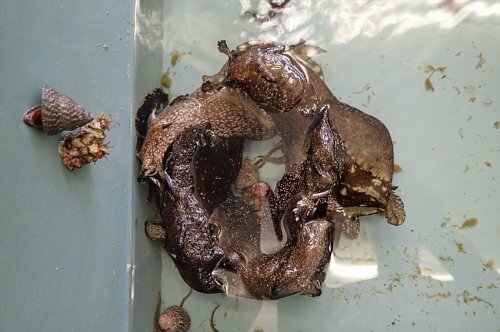 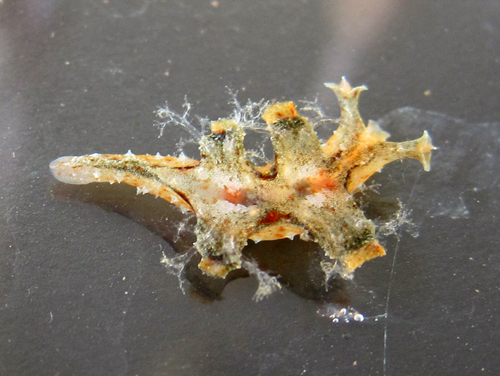 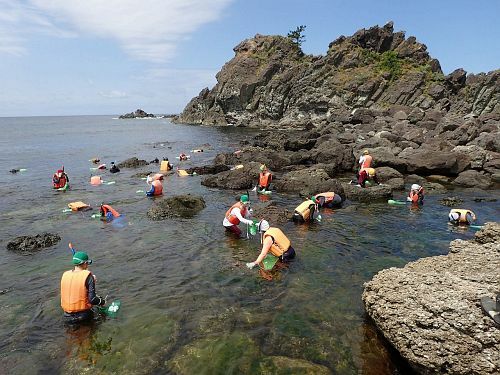 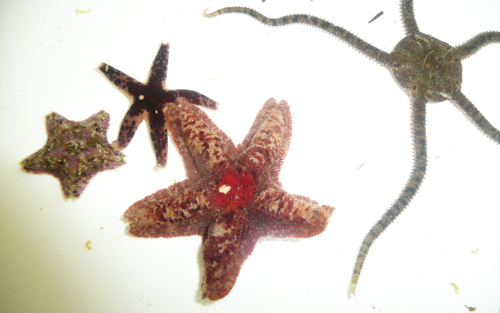 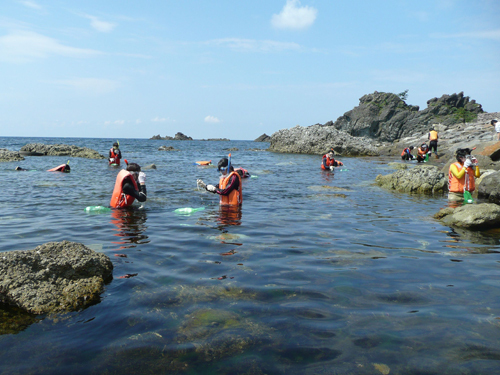 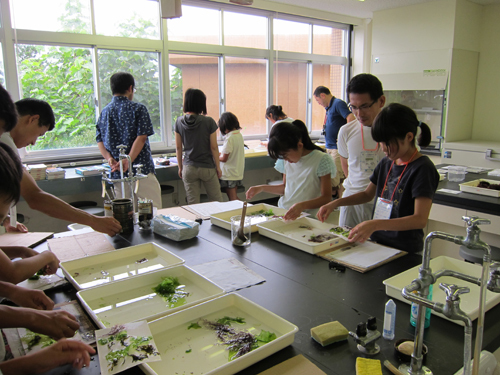 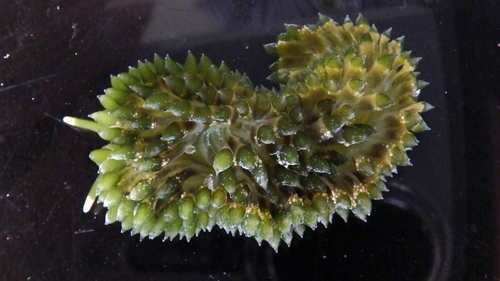 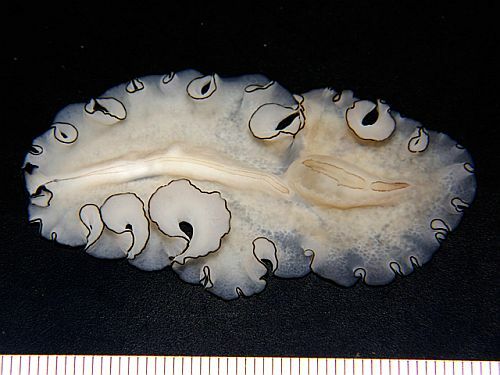 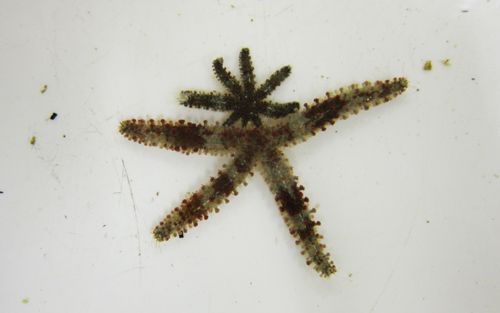 We believe that the participants realized the diversity of marine life by observing a large variety of marine animals, such as beautiful sea slugs, curious peanut worms, and brittle stars with interesting movements. 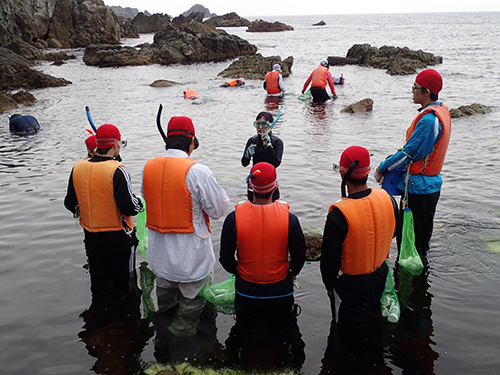 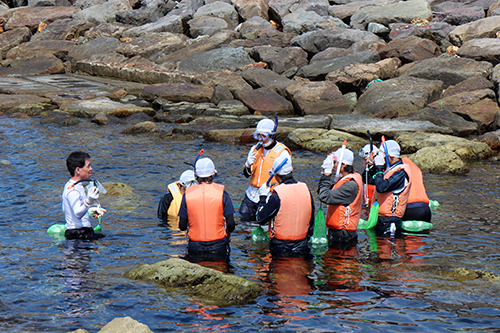 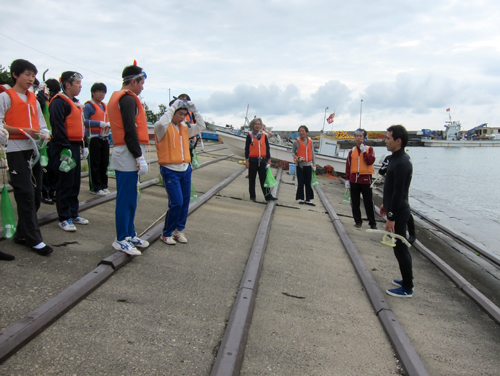 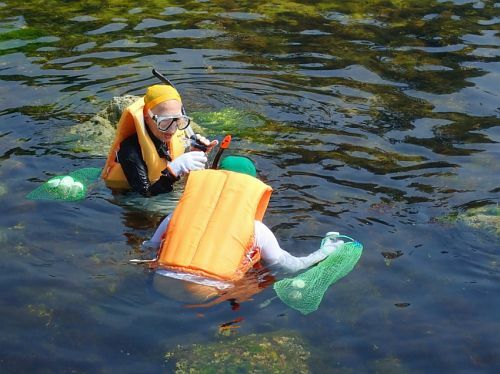 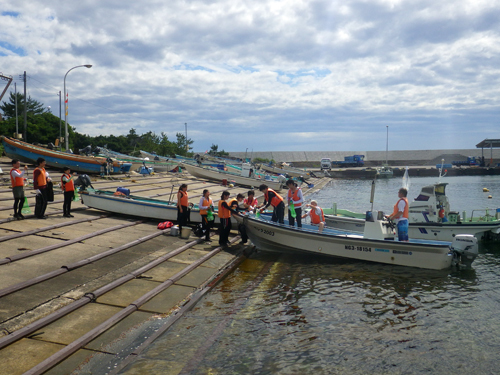 SMBS conducted a marine course in English from 3-6 September 2015. 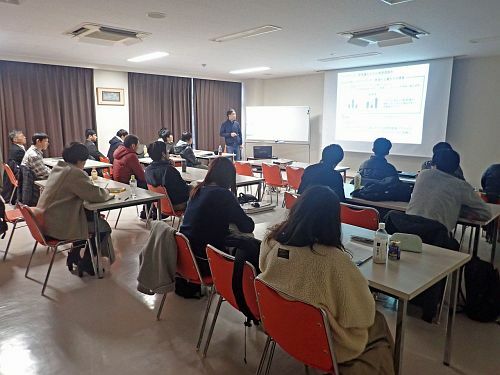 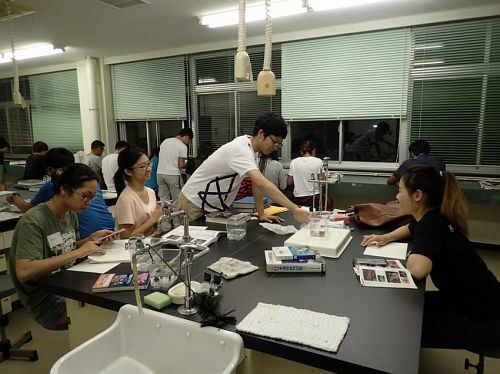 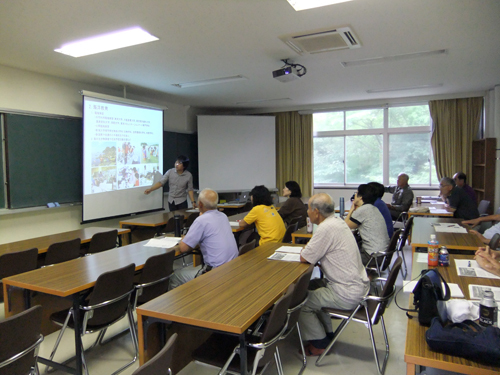 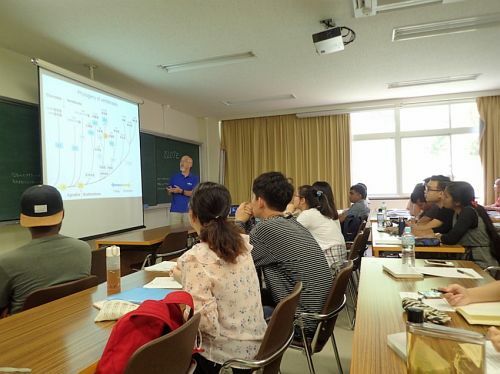 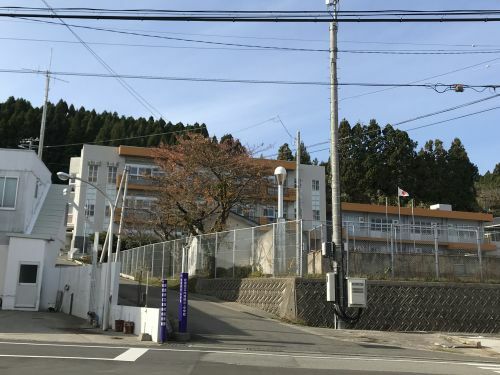 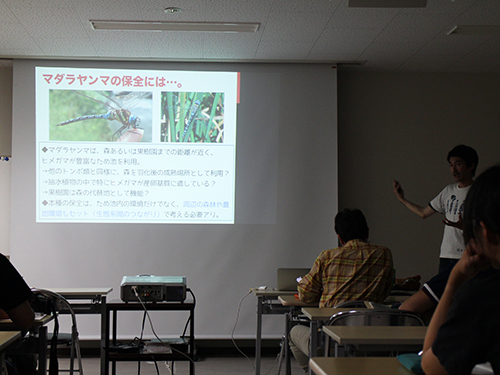 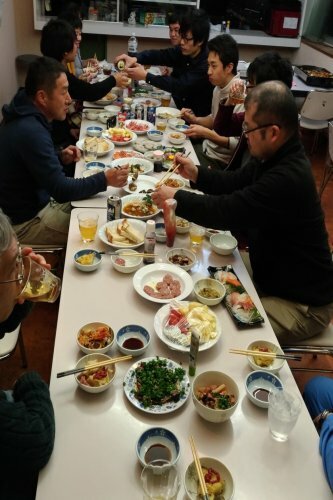 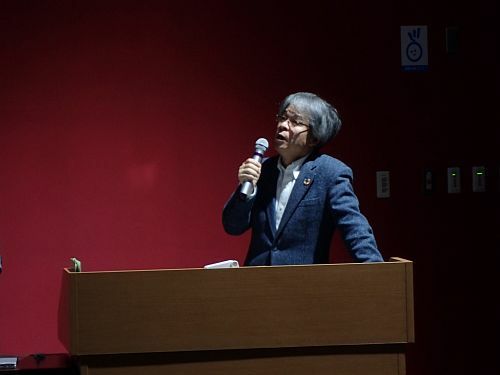 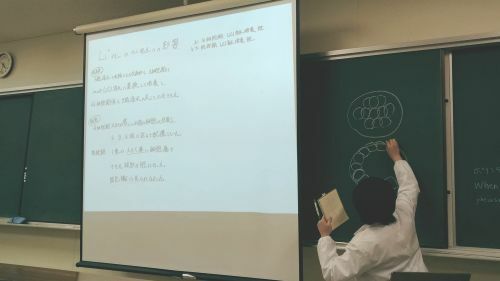 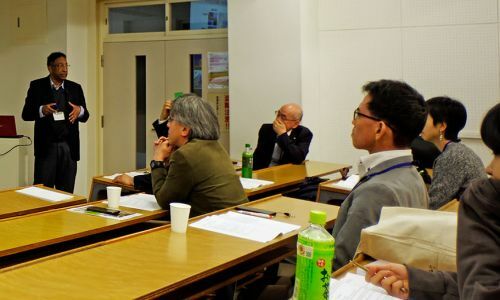 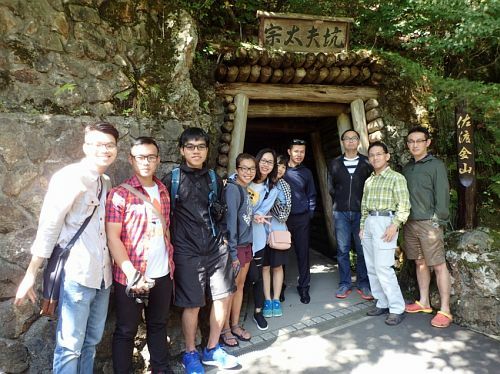 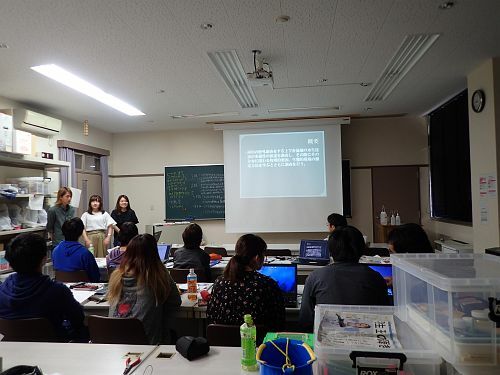 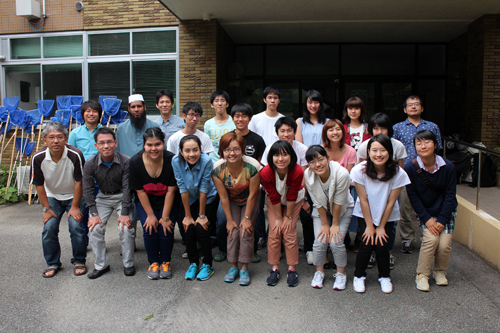 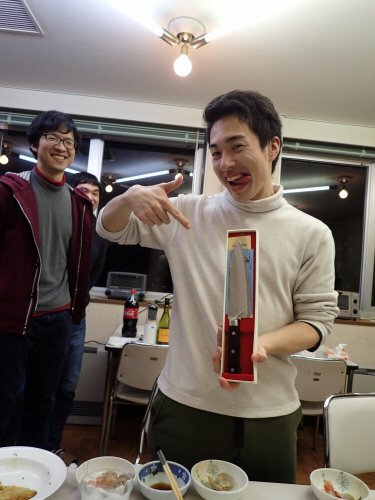 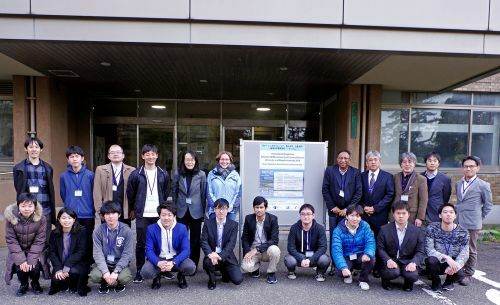 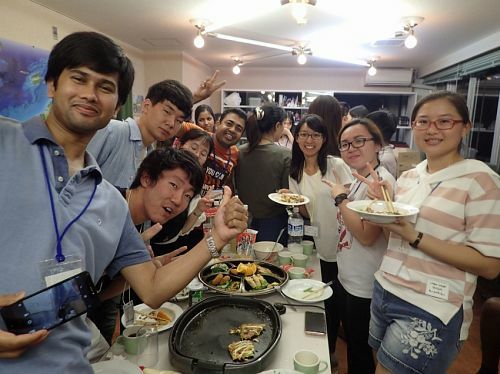 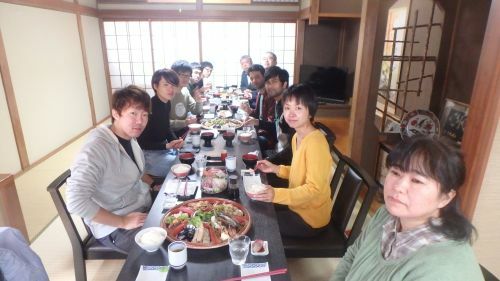 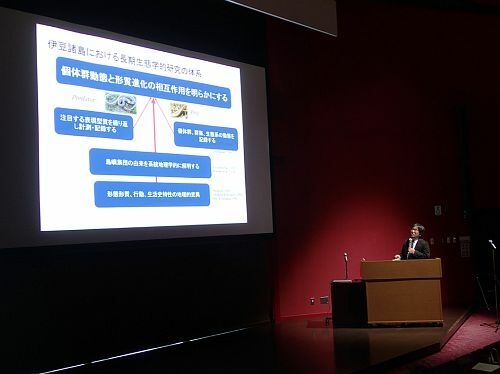 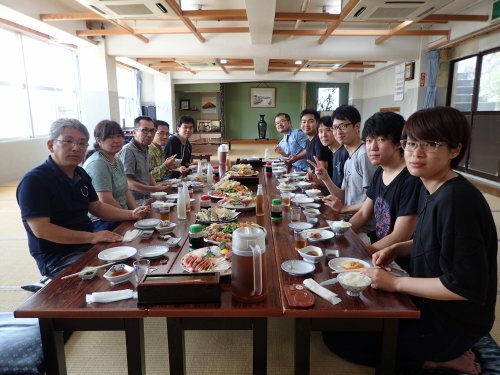 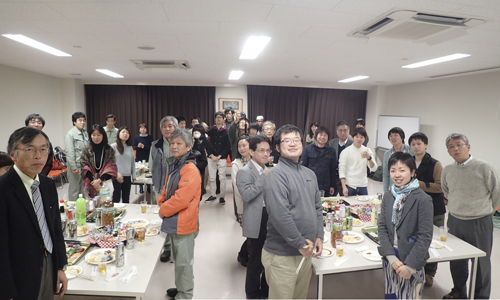 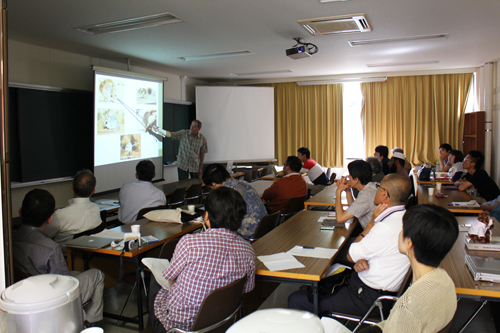 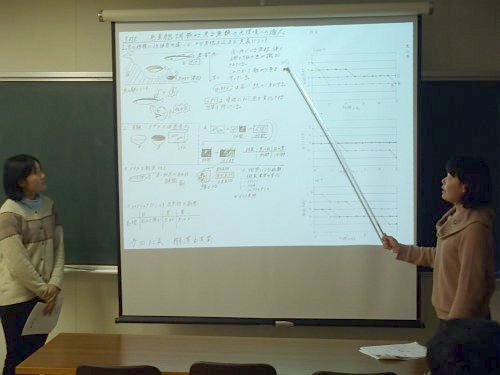 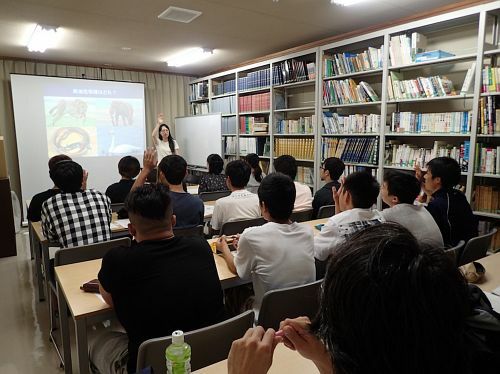 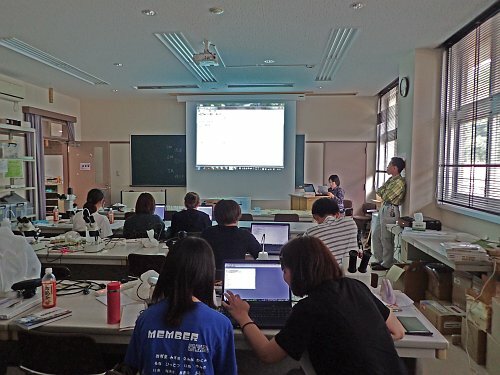 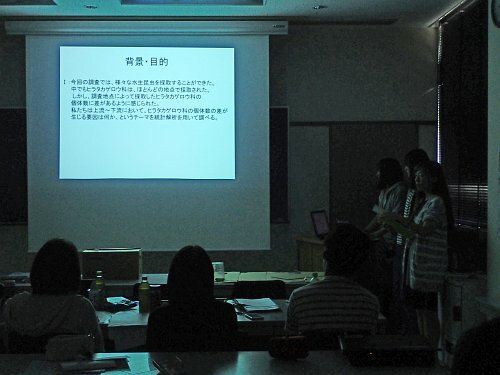 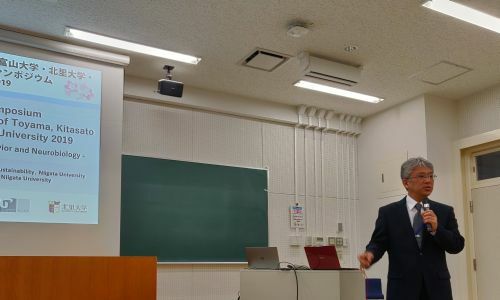 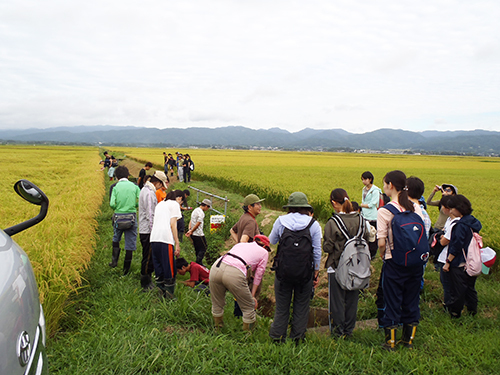 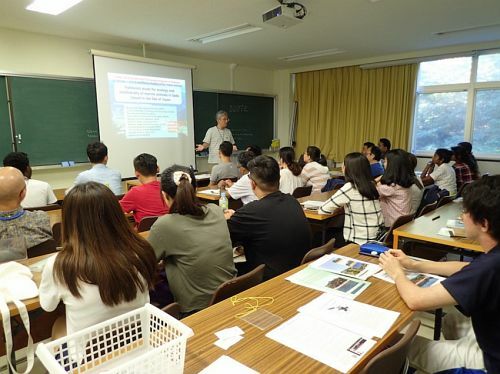 In this course, the attendees were 13 students and an assistant professor of Tokyo Medical and Dental University, Japan, and 2 students and an assistant professor of Nakhon Sawan Rajabhat University, Thailand. 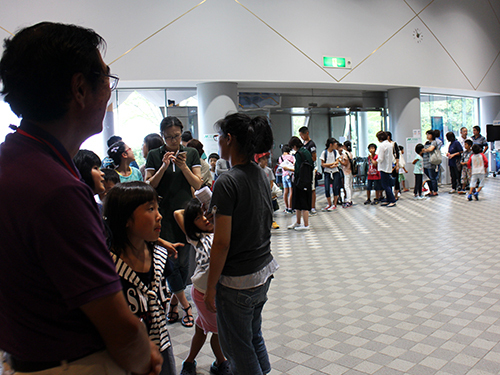 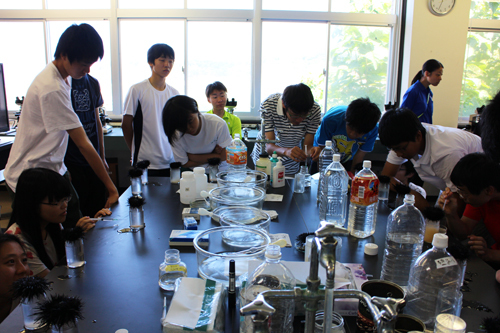 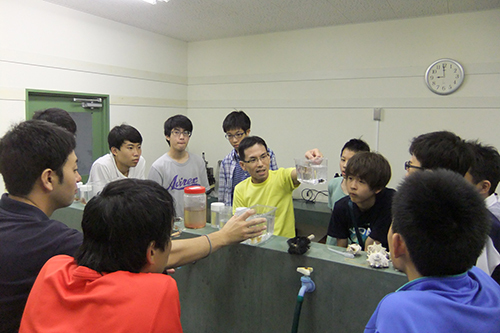 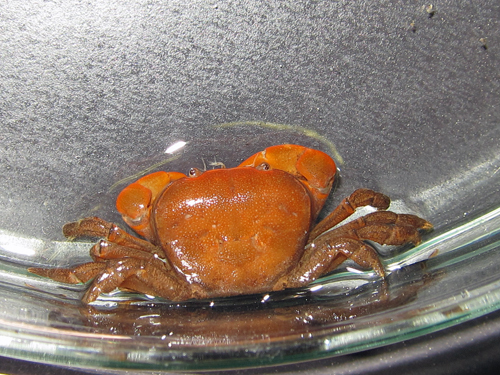 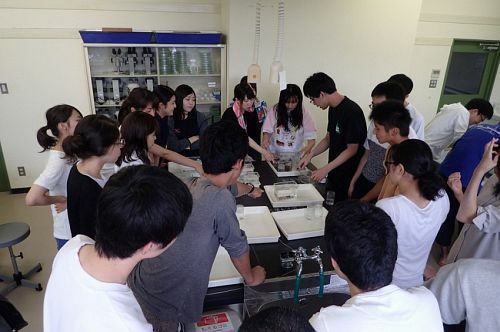 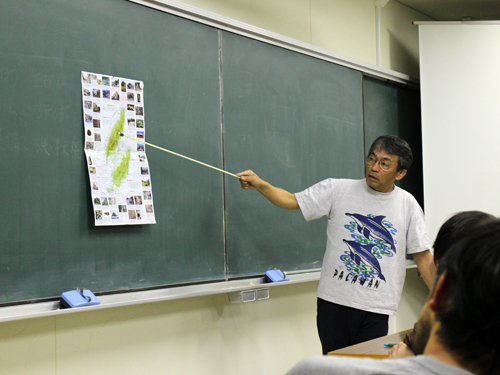 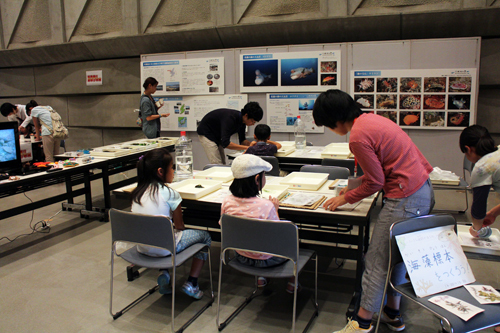 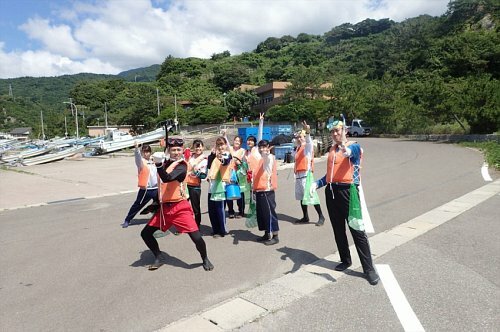 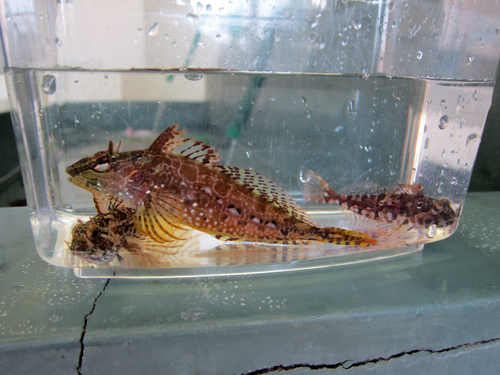 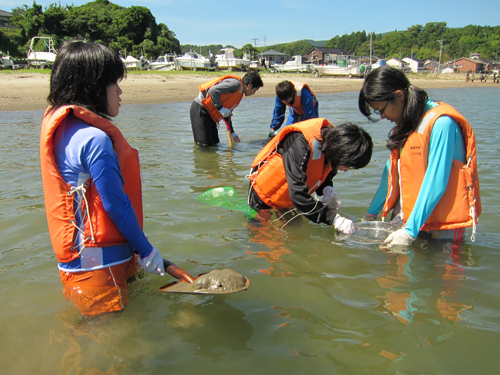 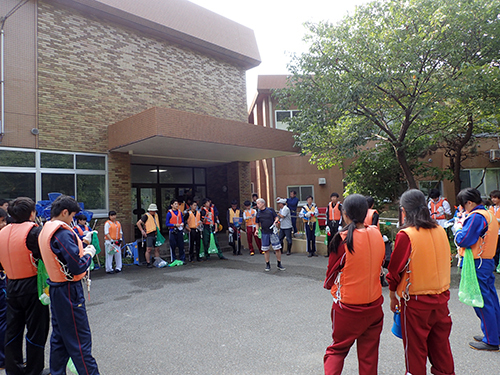 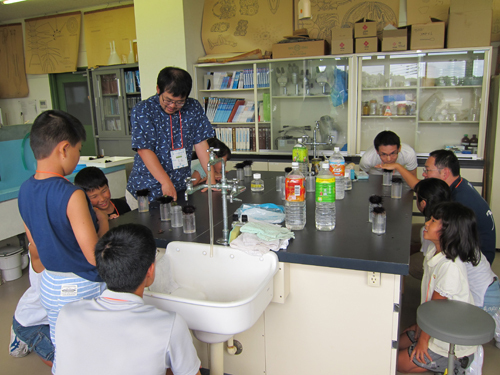 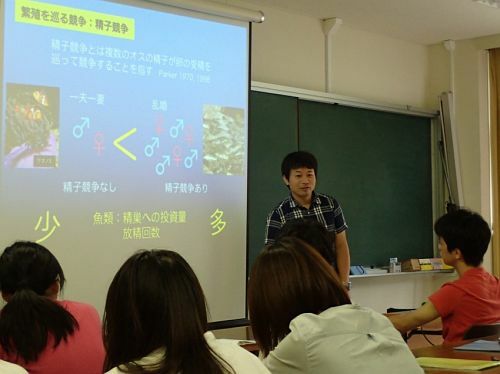 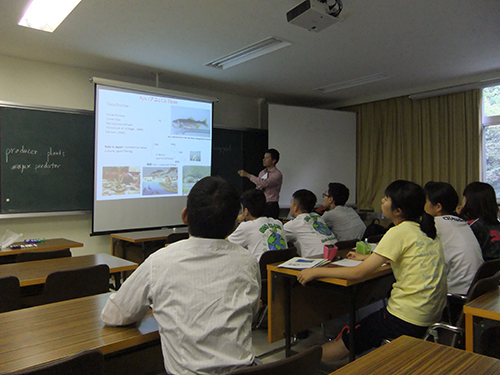 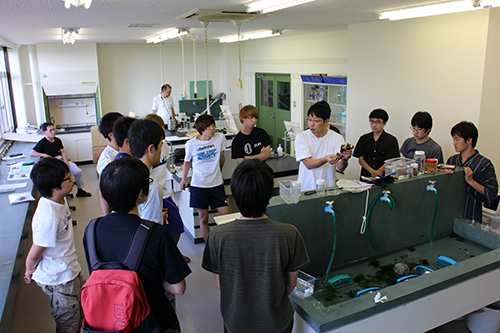 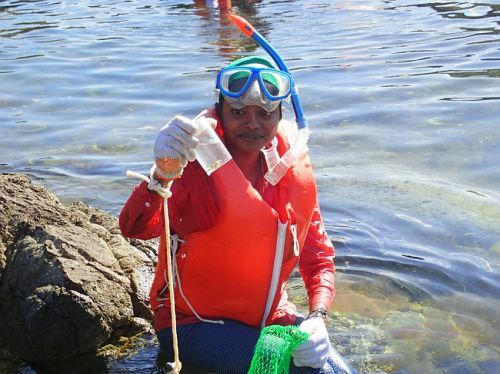 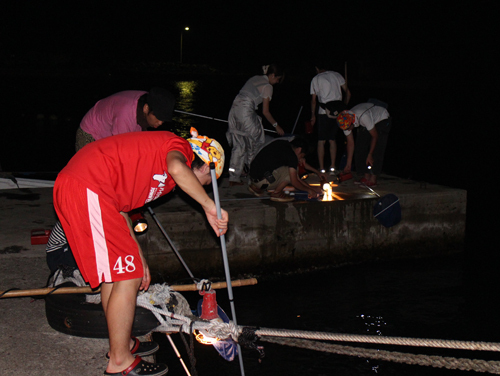 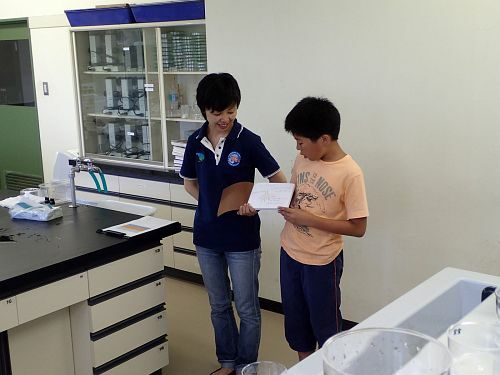 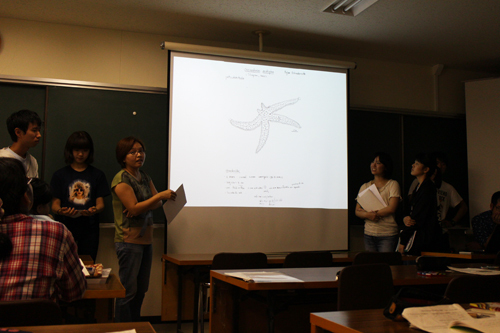 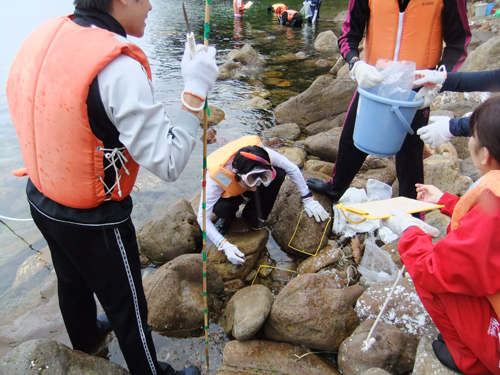 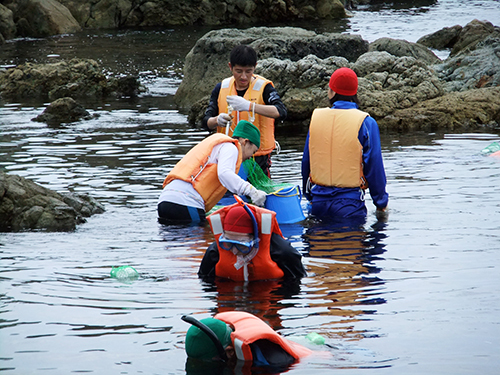 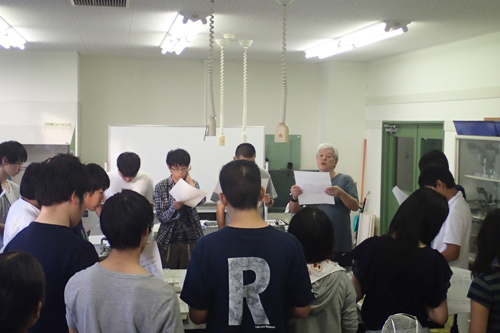 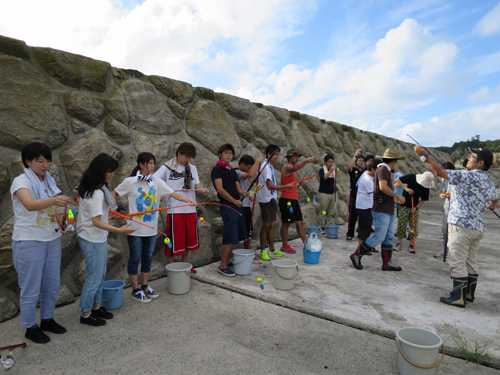 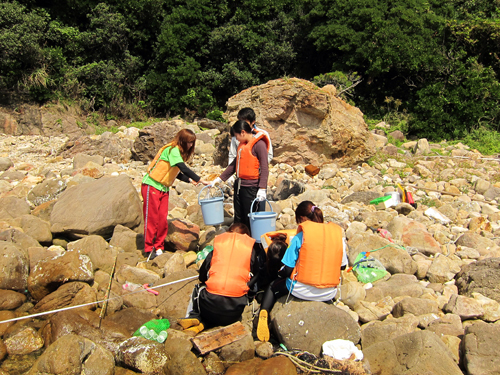 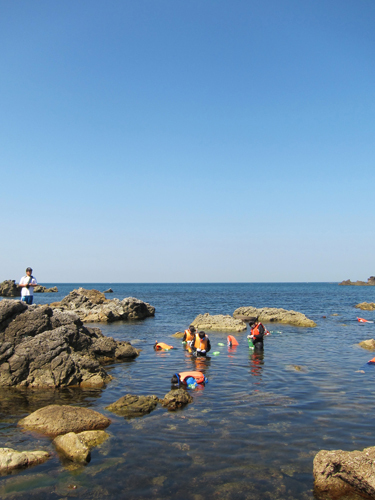 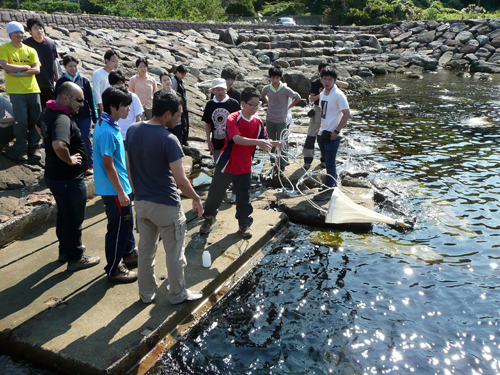 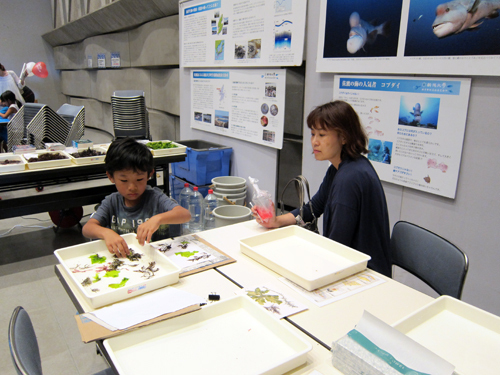 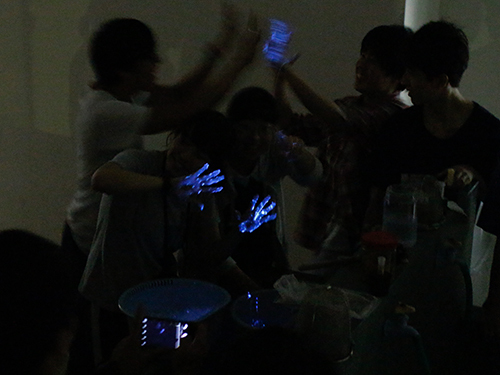 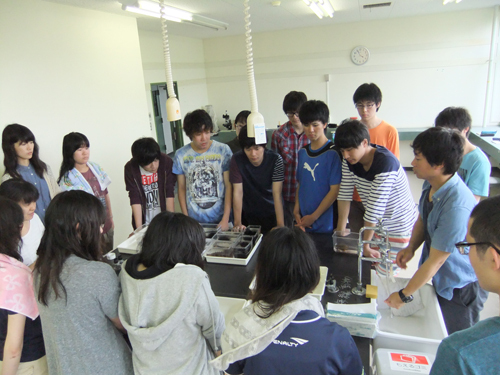 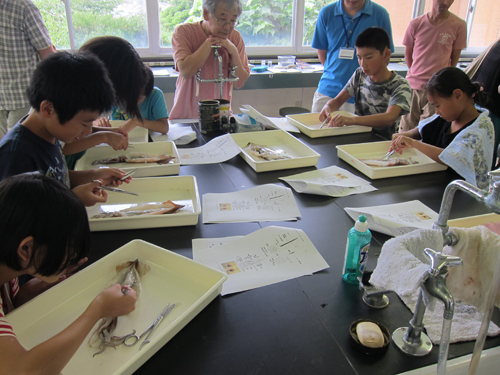 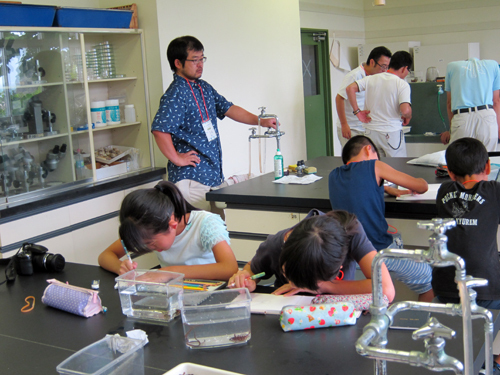 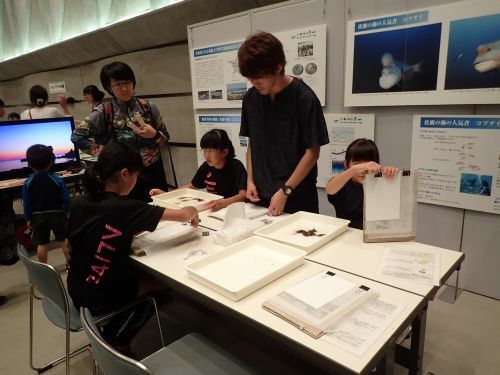 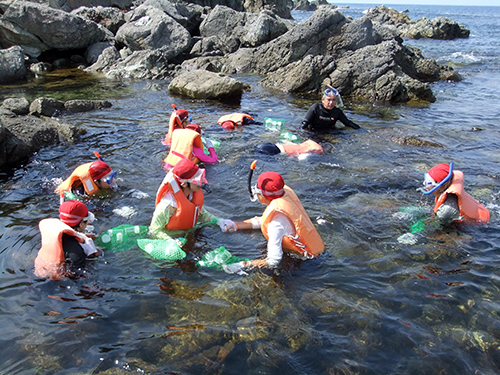 The participants learned basic biology in English focused on marine animals by doing a sort of activities. 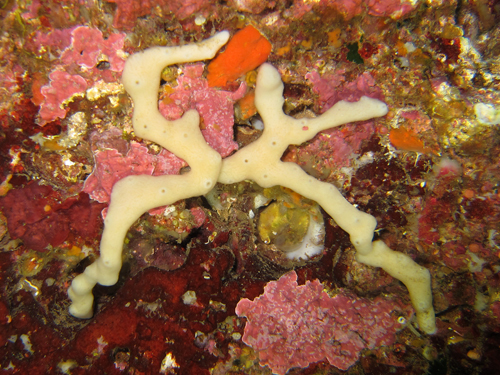 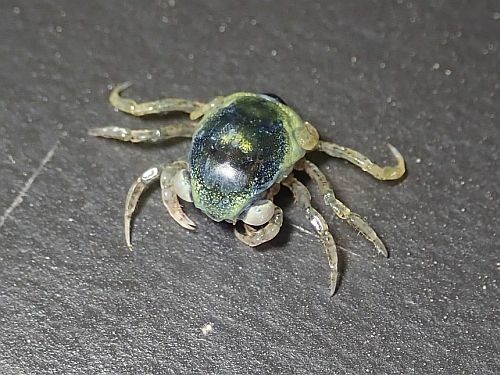 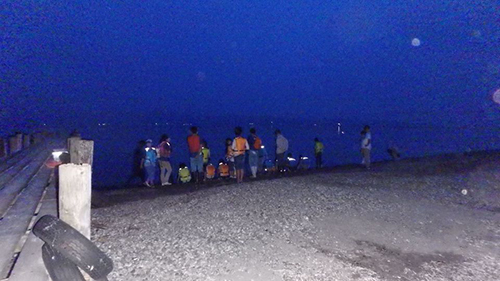 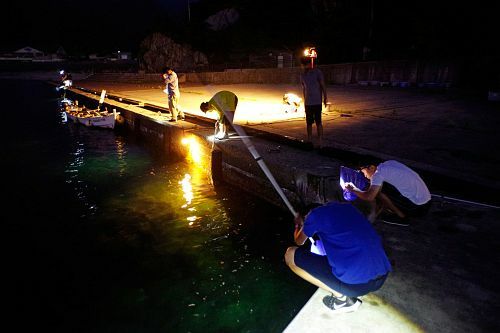 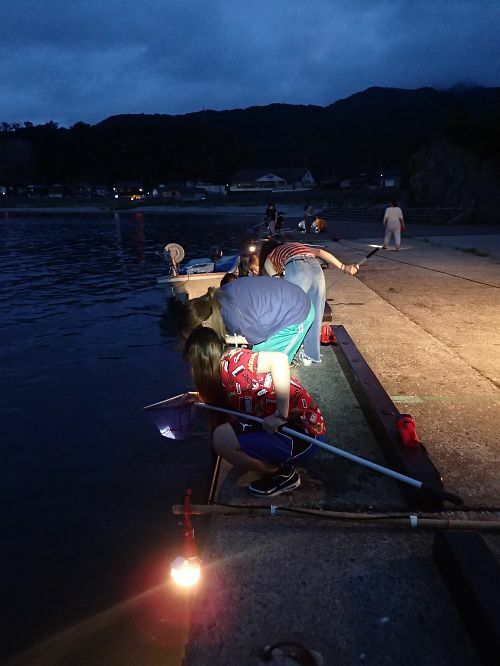 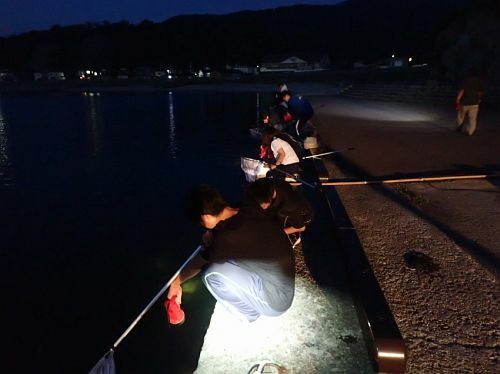 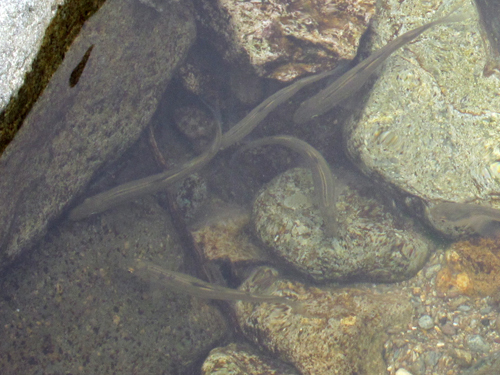 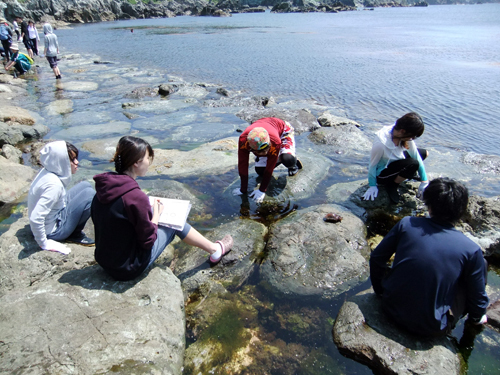 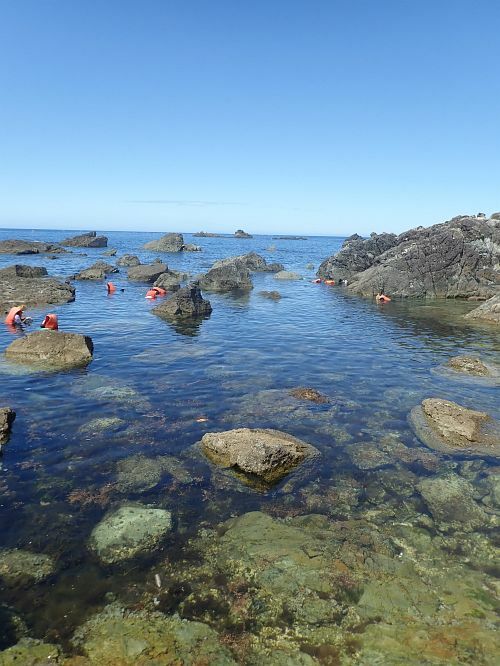 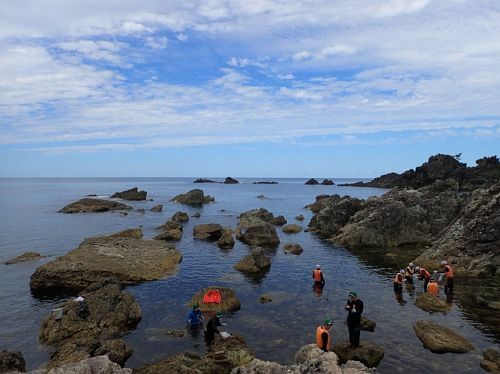 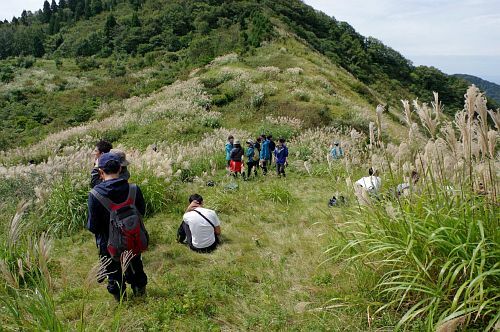 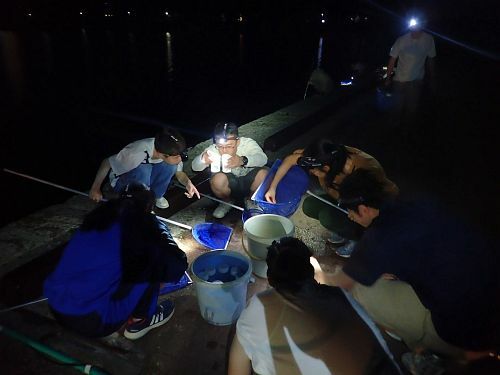 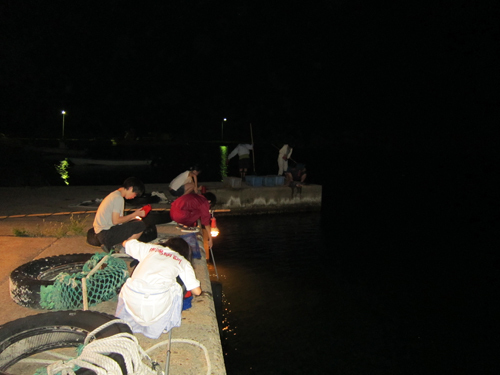 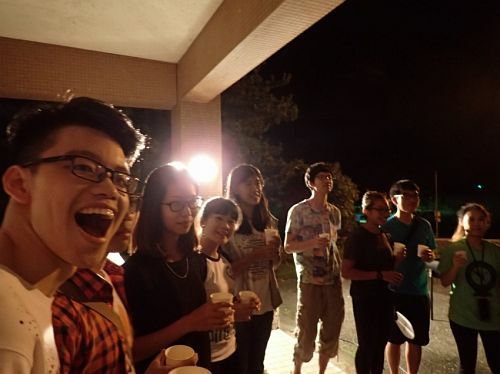 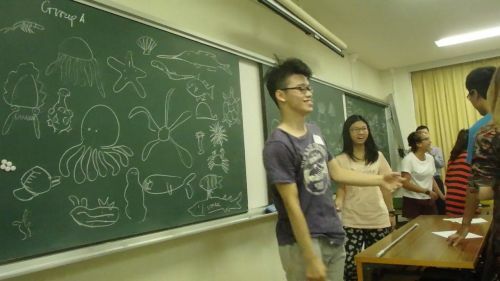 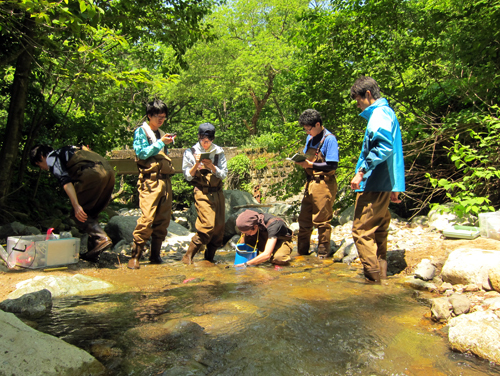 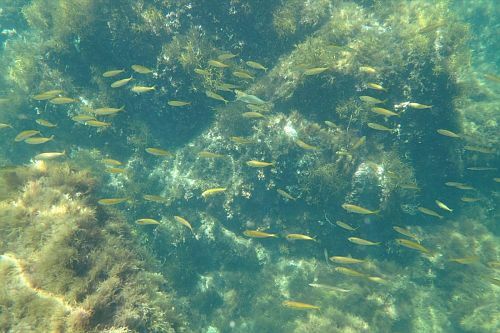 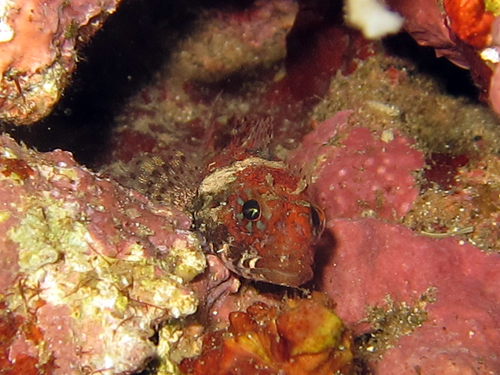 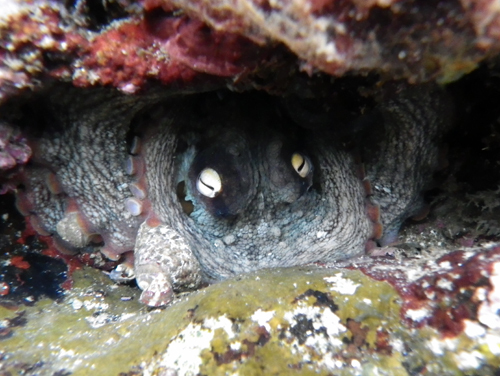 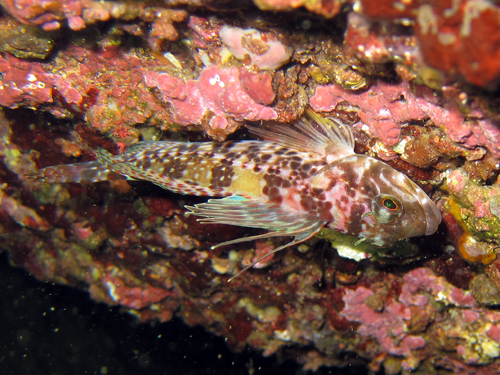 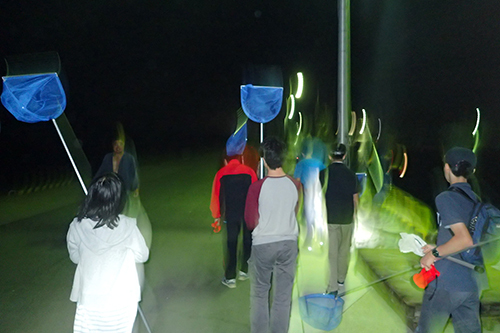 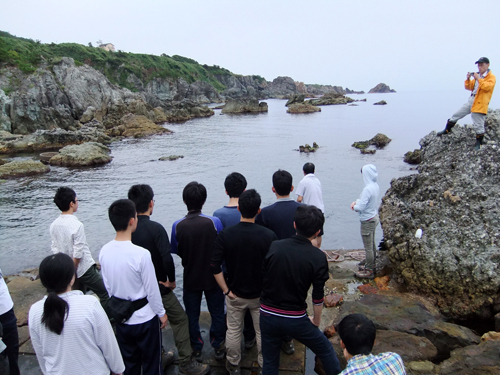 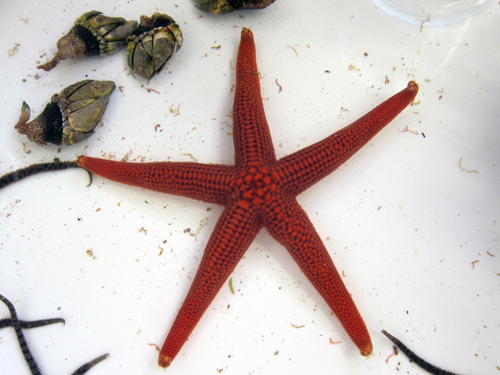 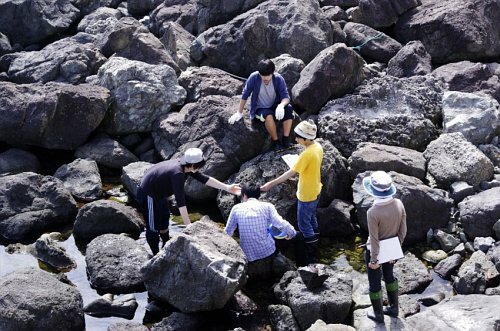 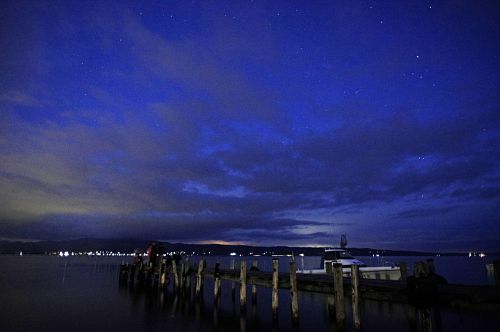 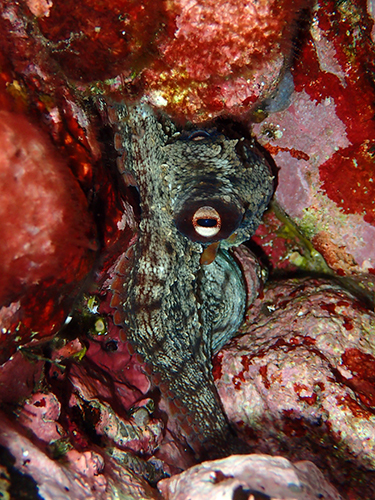 After following the lecture on classification (the diversity of organisms), they sampled animals in nocturnal and by snorkeling at a rocky shore, and observed their morphology, structure, and grouped into different animal phyla, and finally sketched. 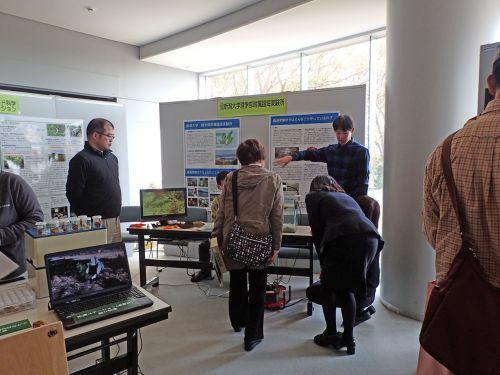 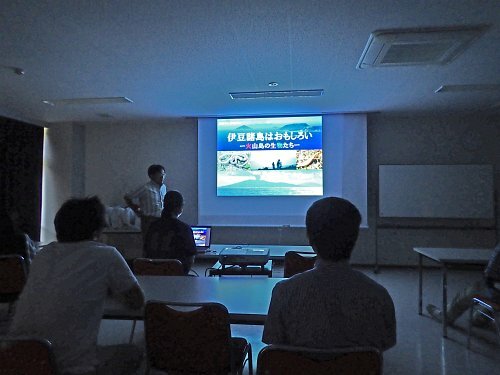 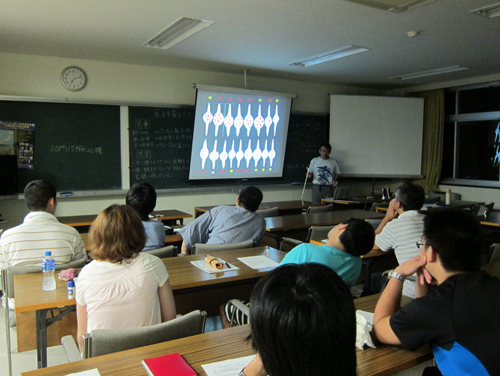 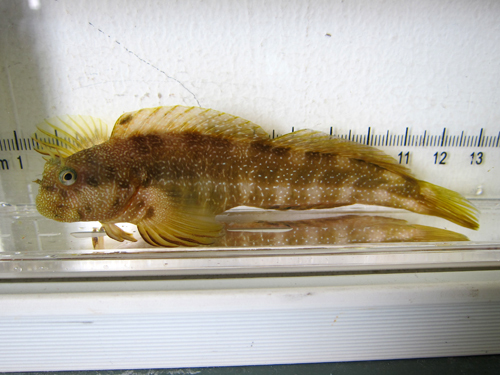 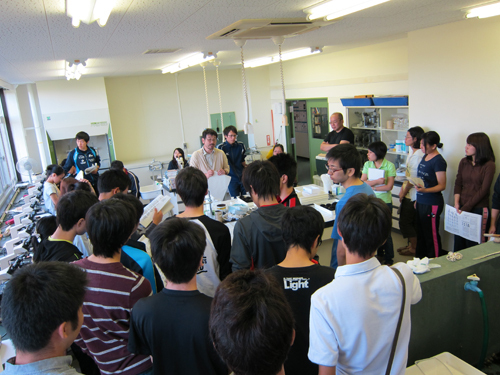 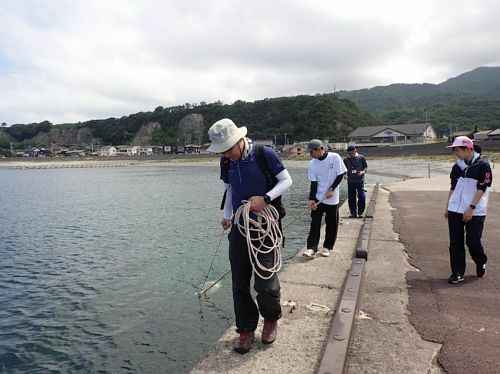 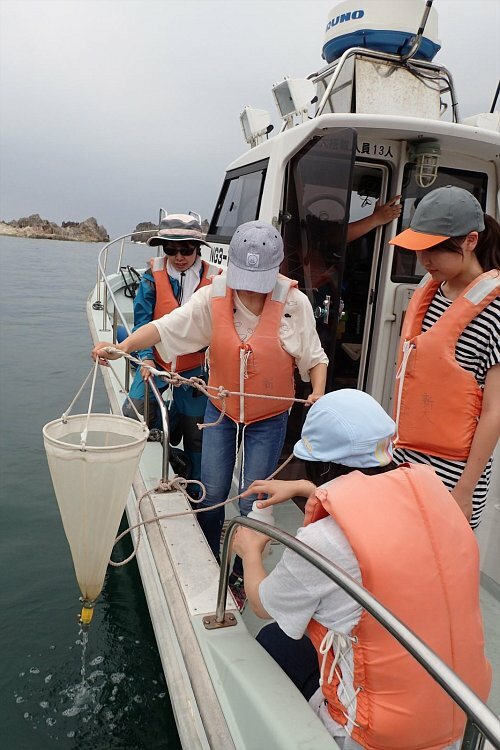 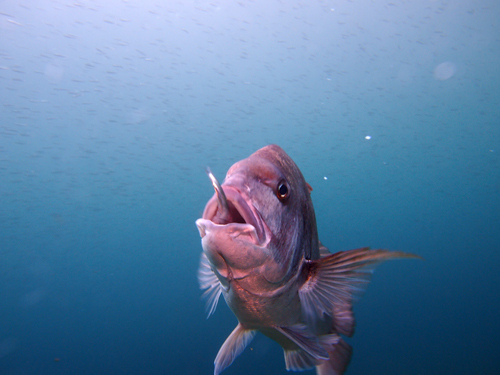 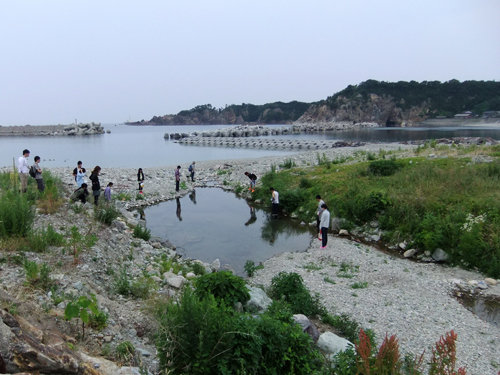 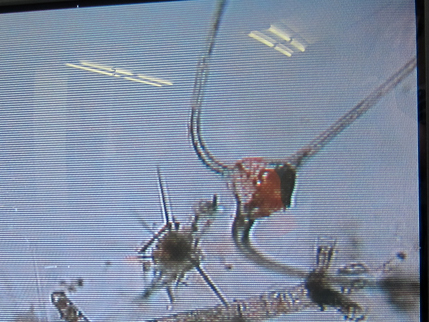 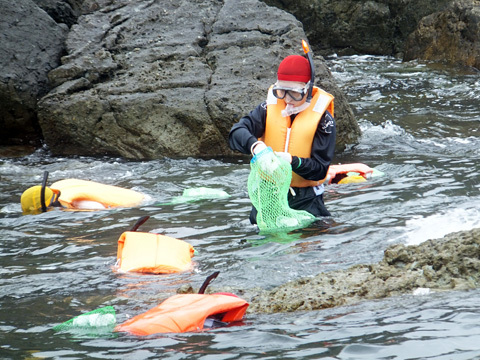 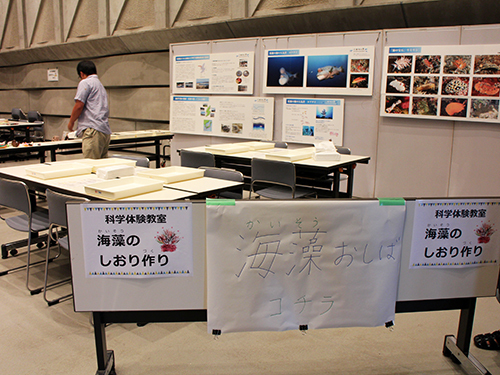 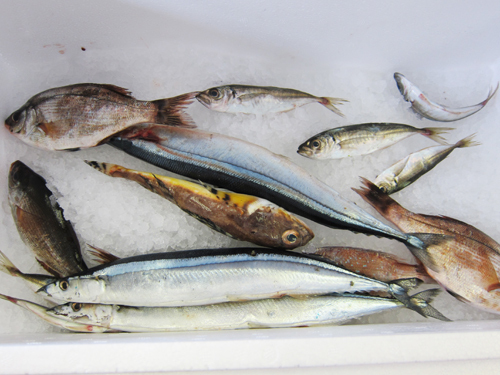 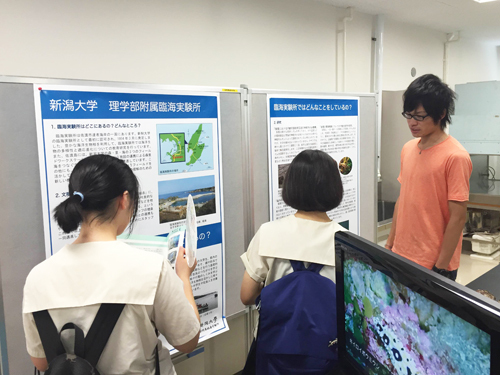 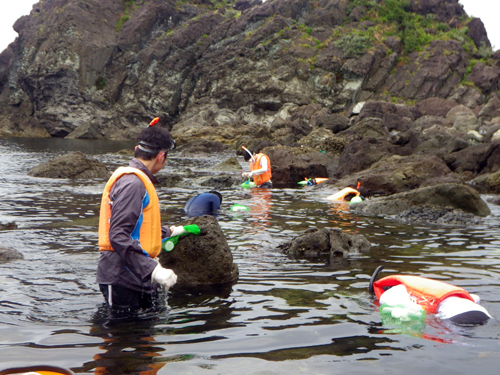 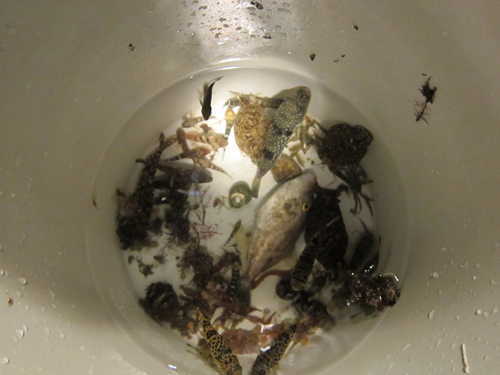 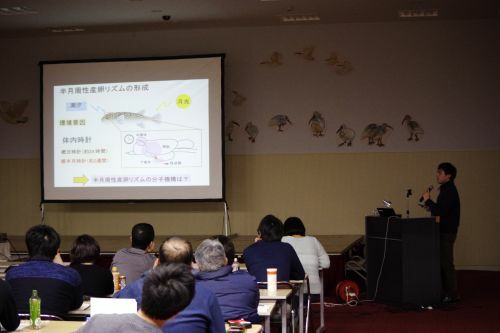 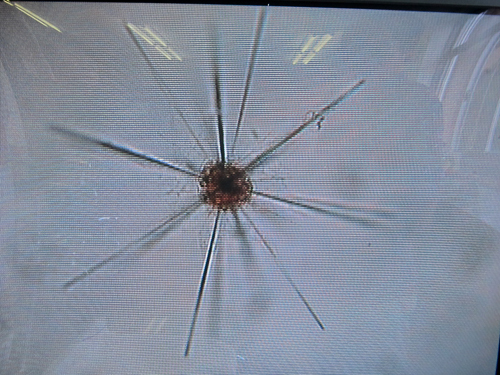 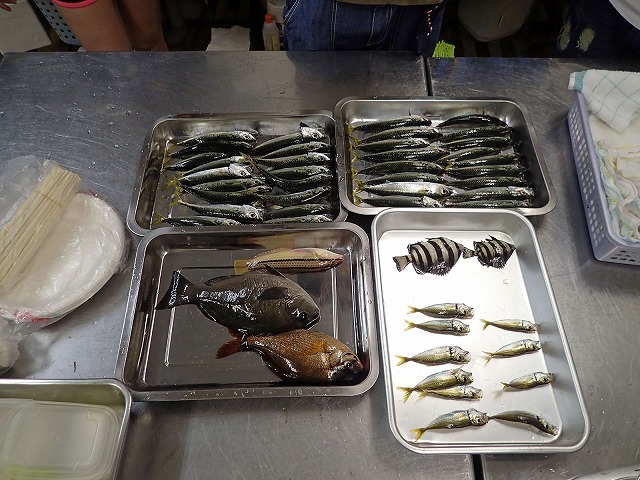 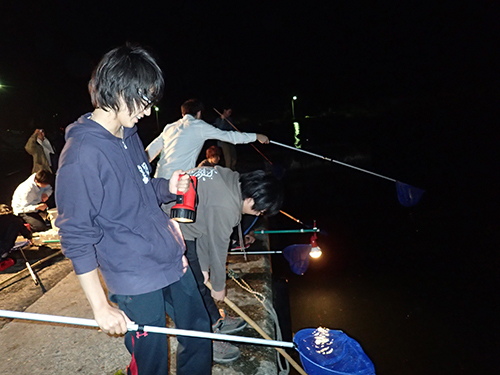 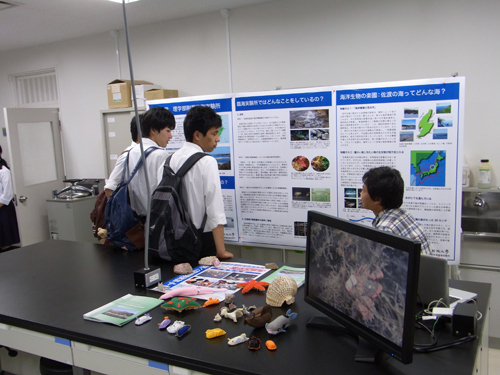 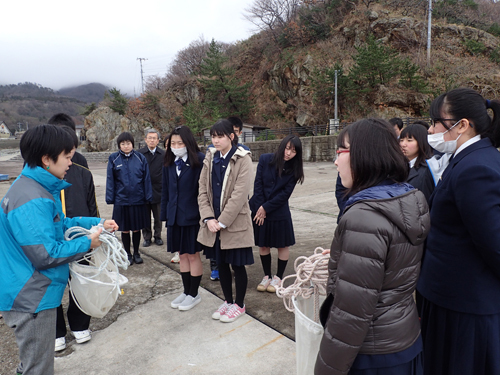 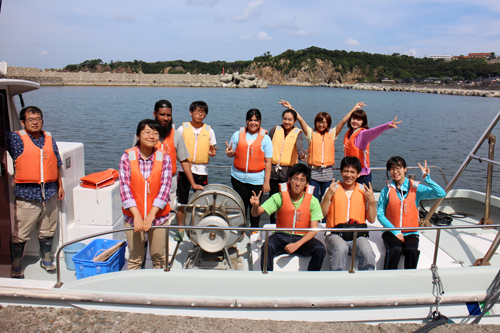 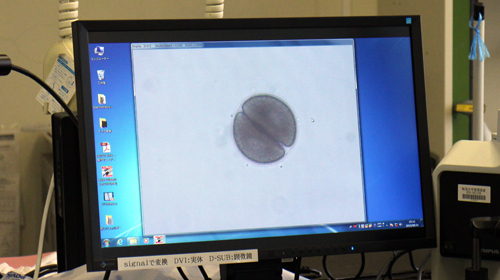 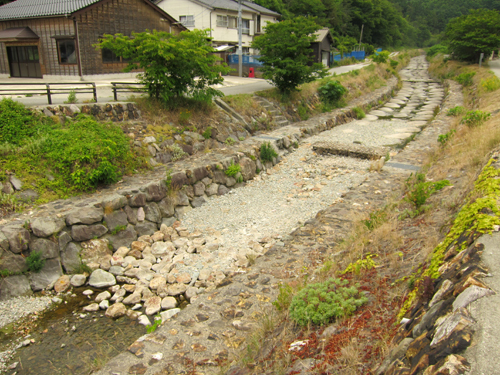 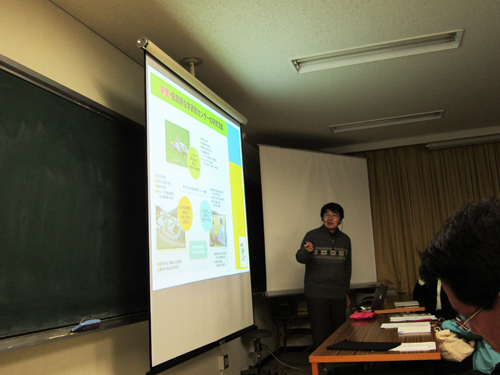 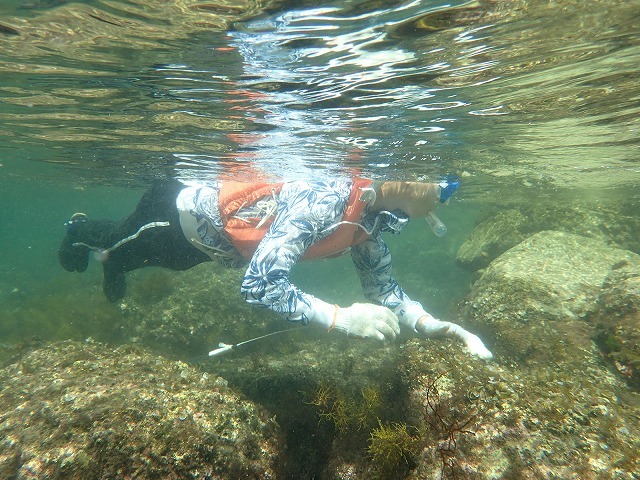 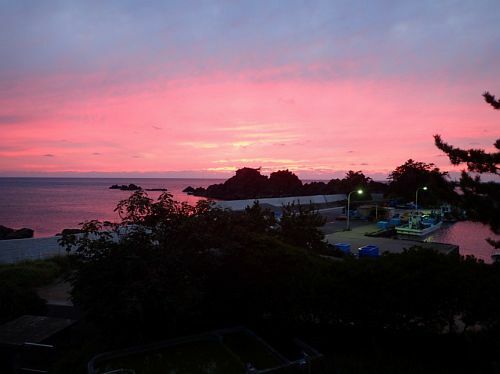 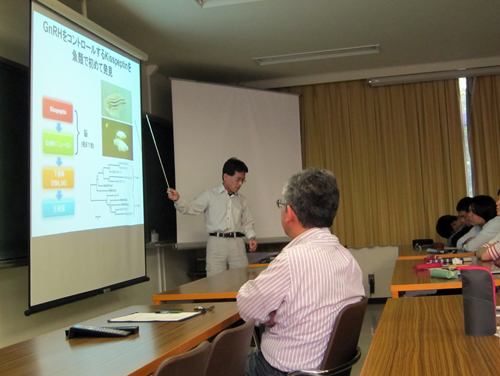 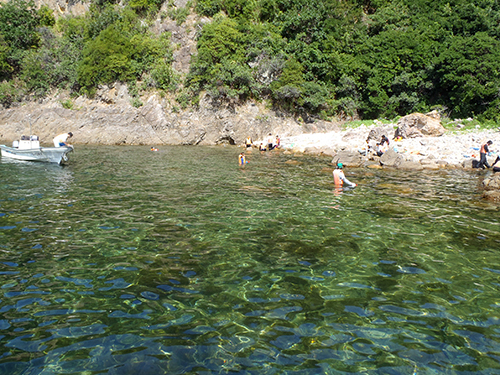 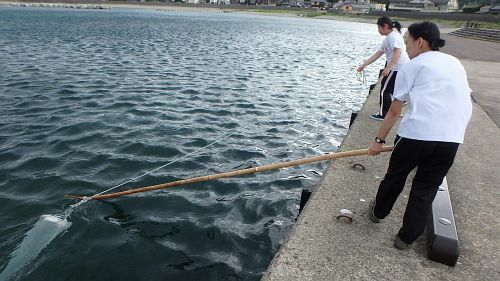 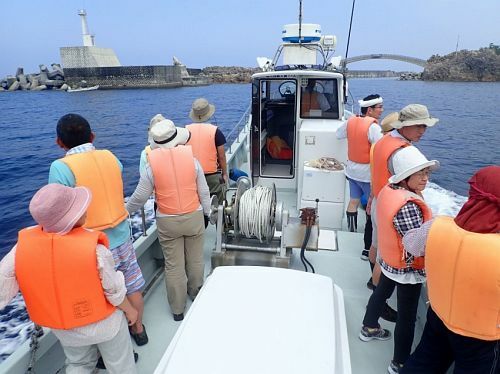 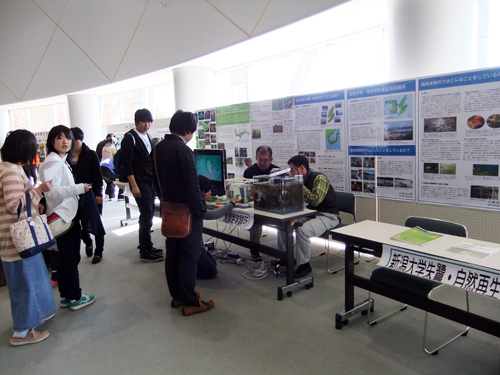 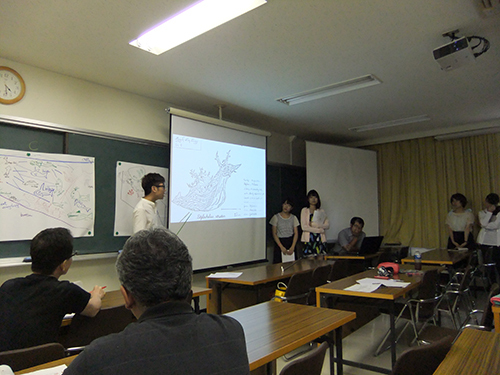 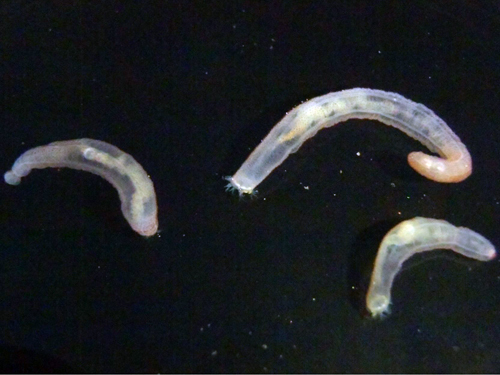 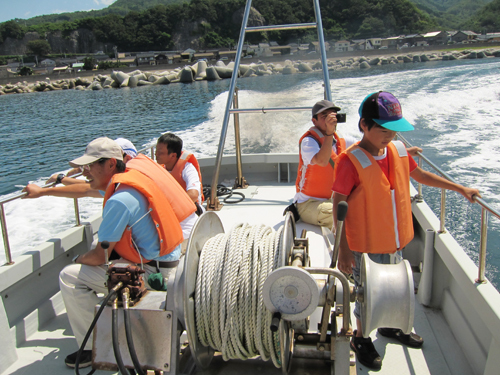 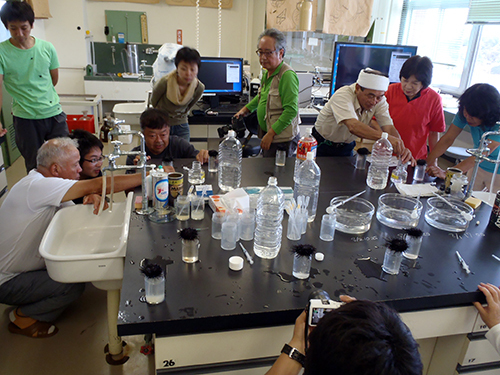 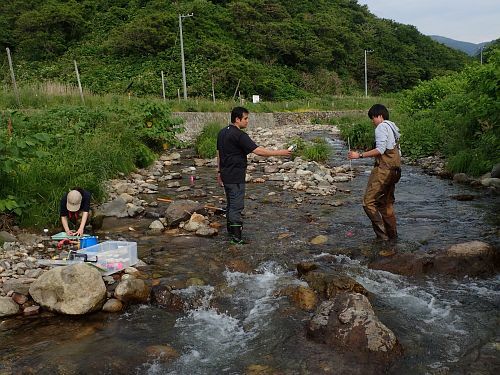 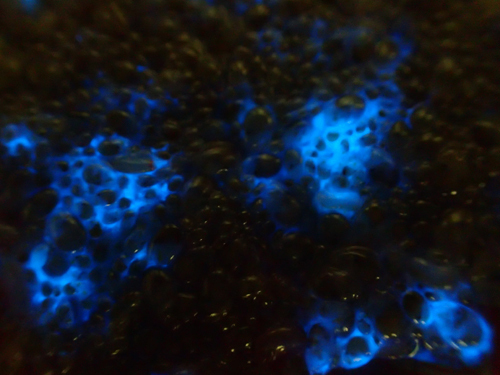 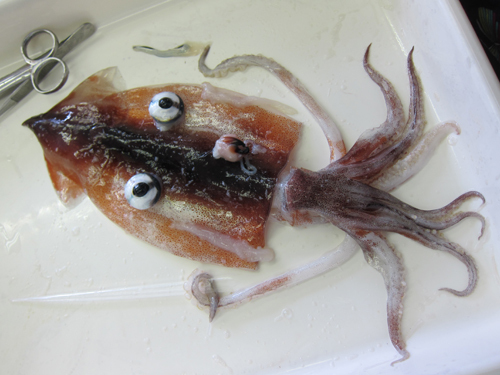 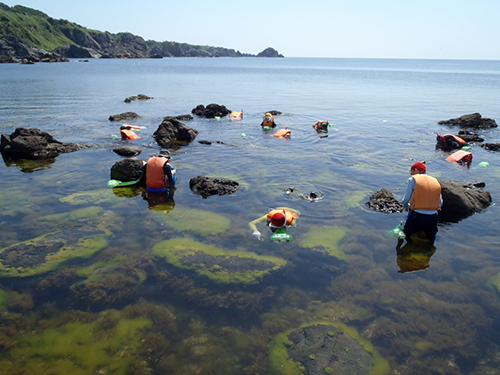 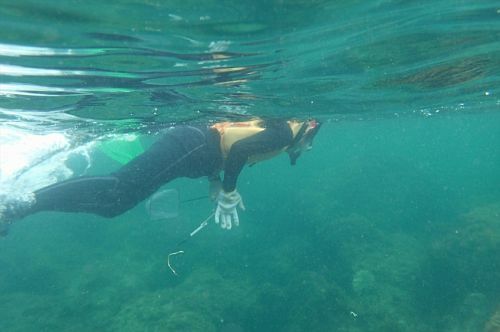 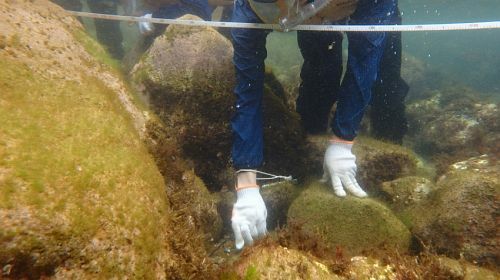 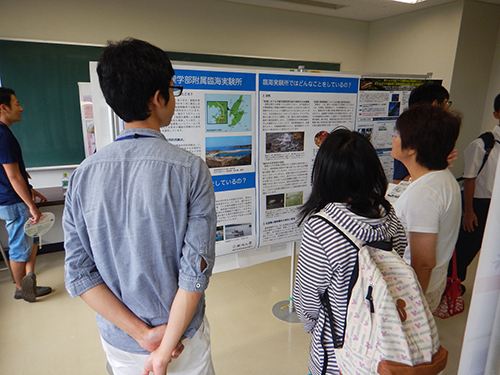 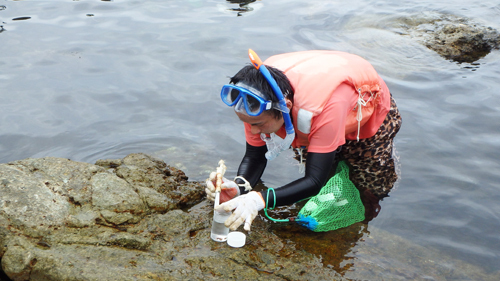 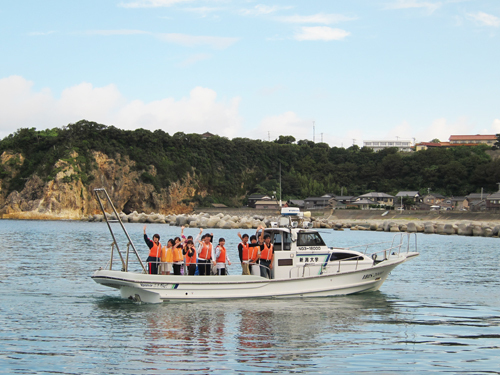 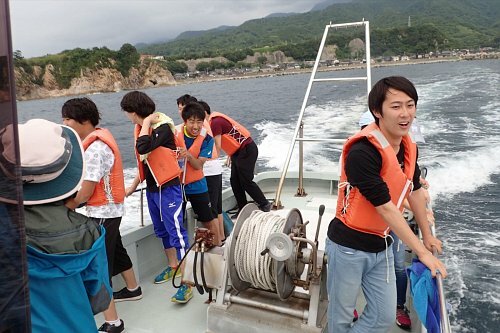 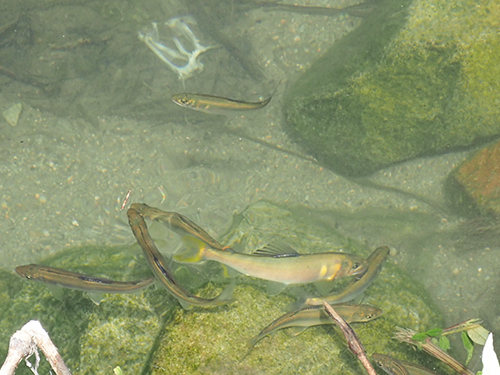 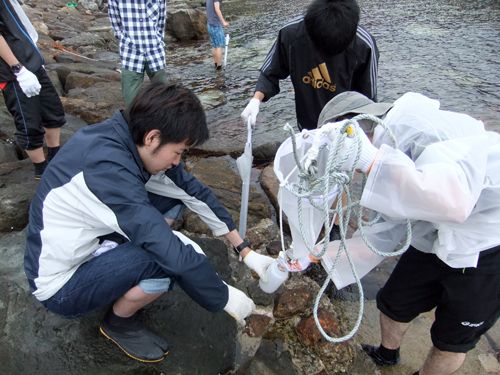 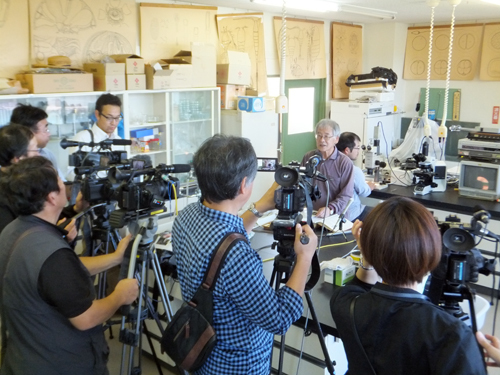 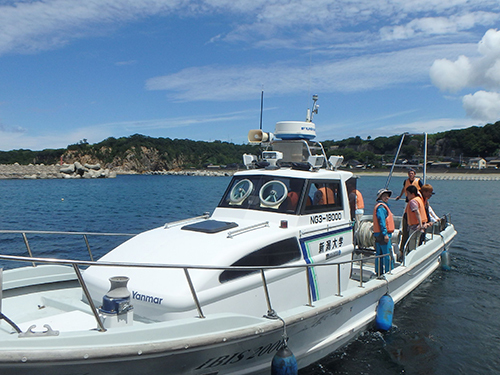 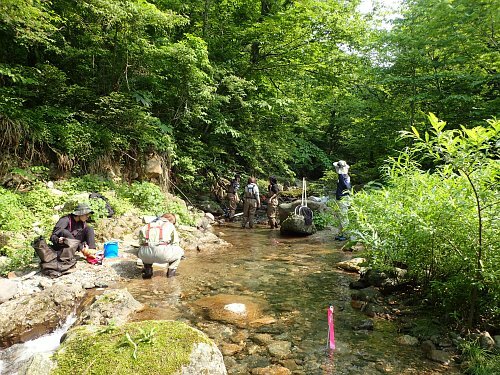 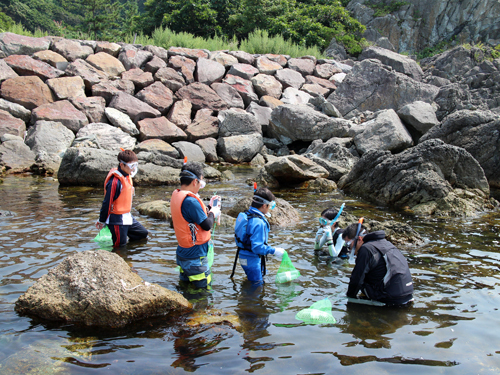 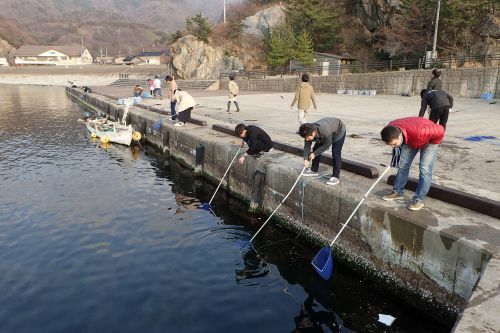 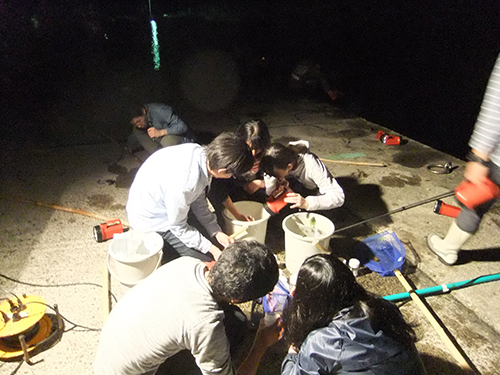 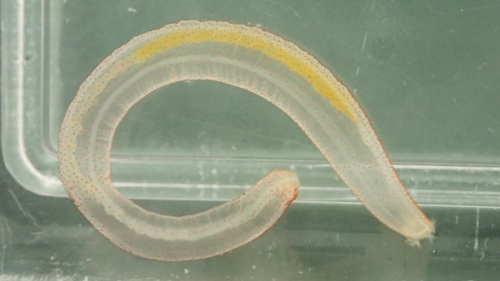 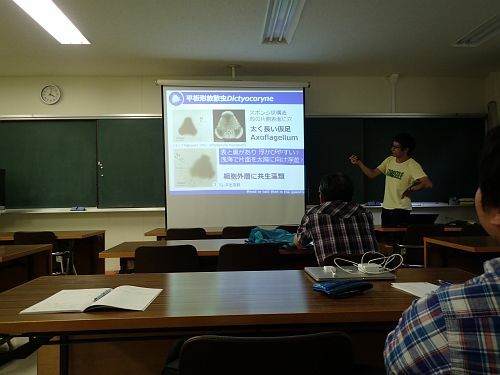 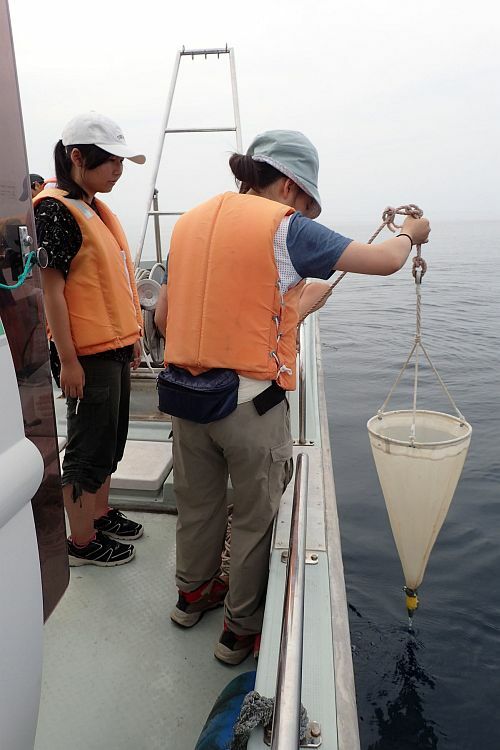 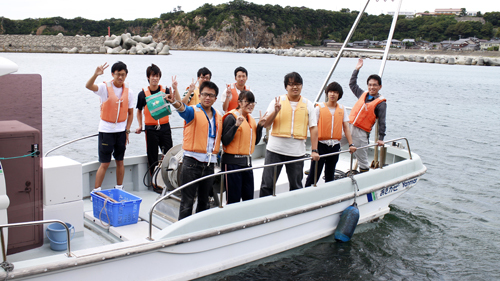 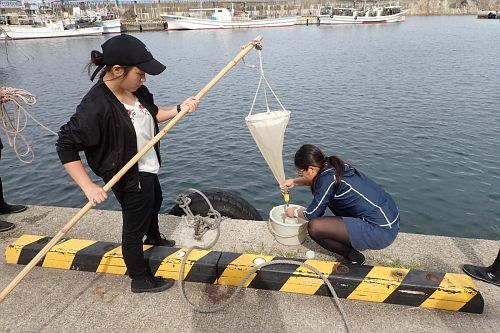 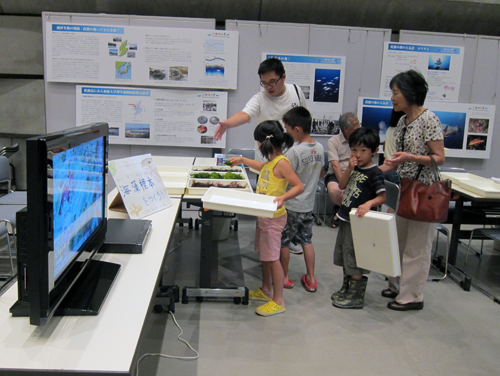 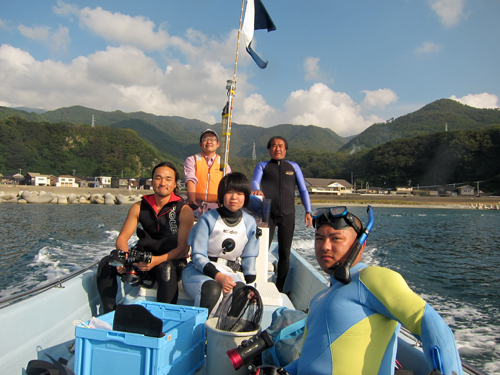 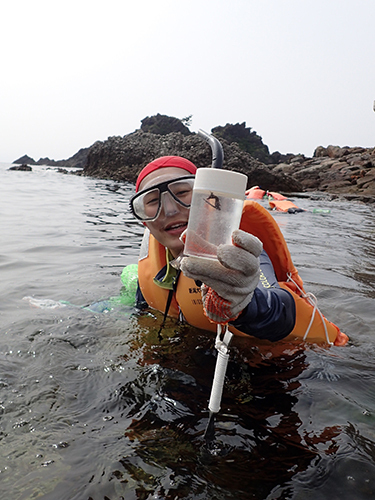 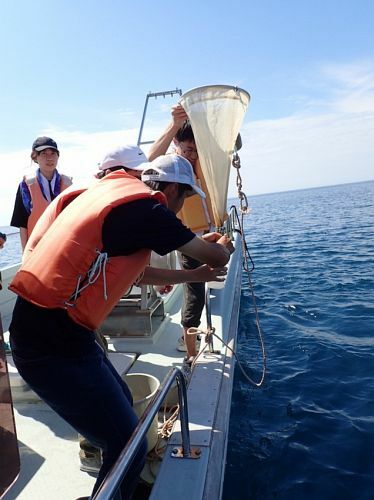 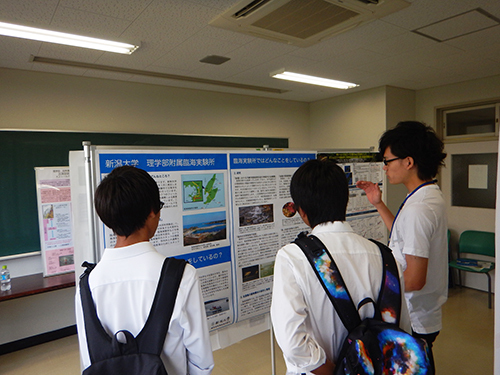 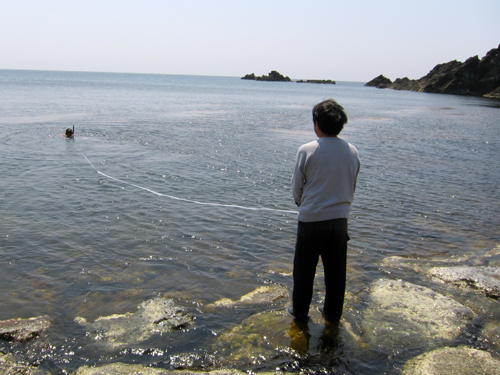 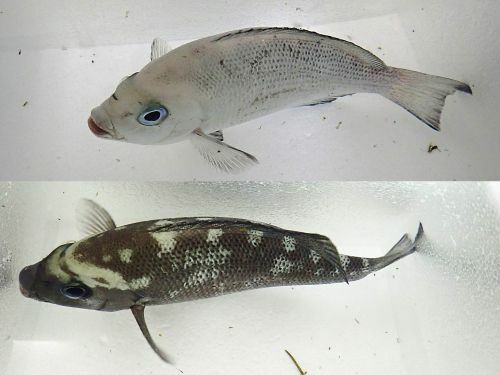 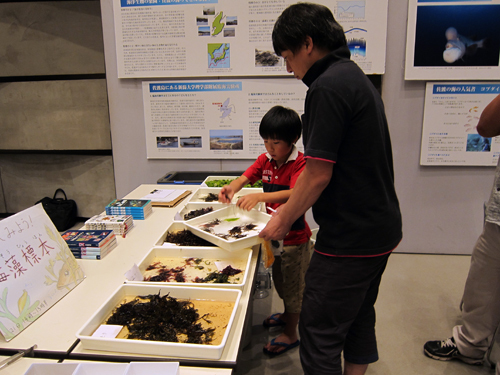 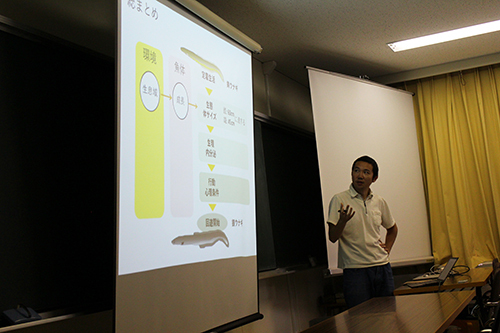 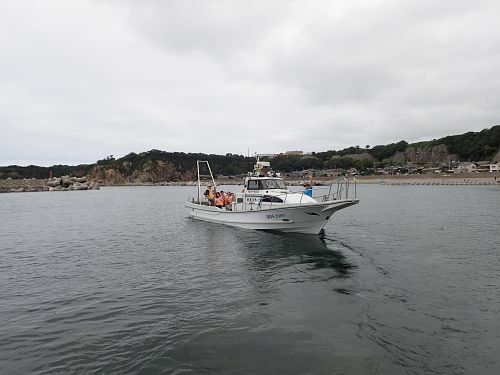 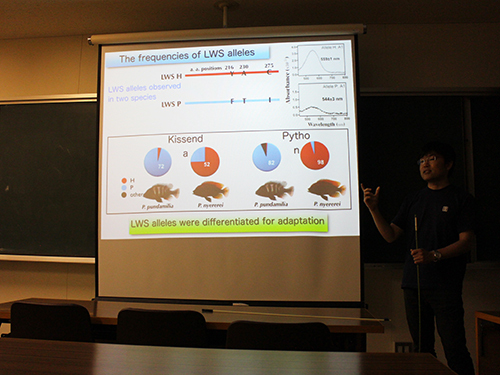 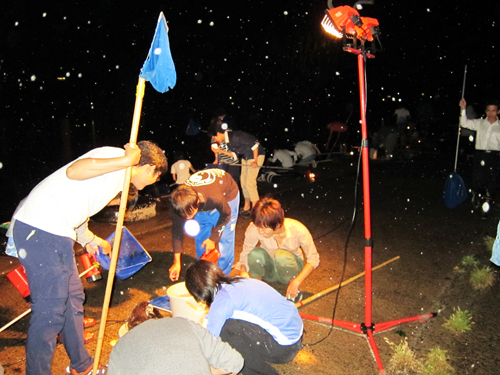 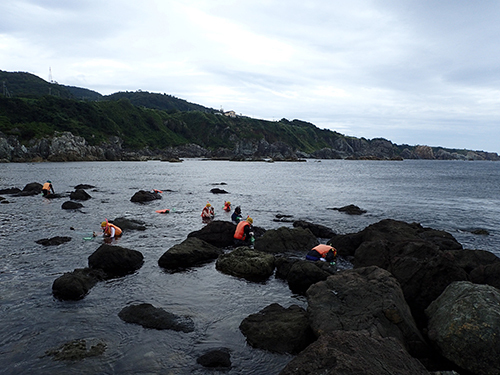 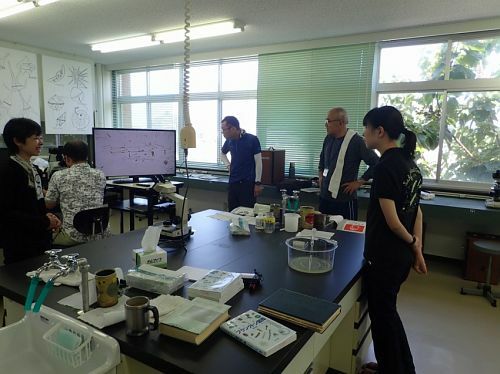 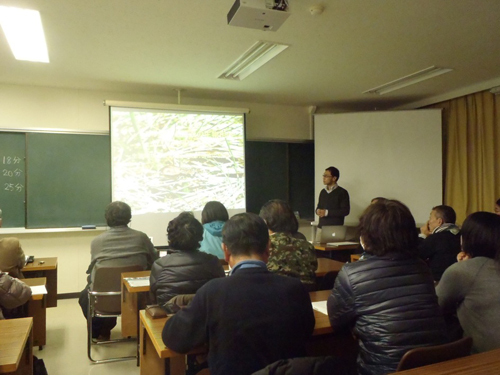 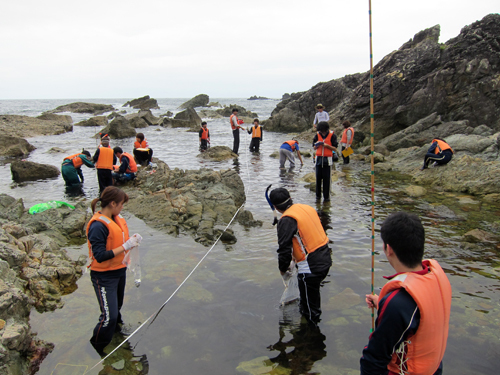 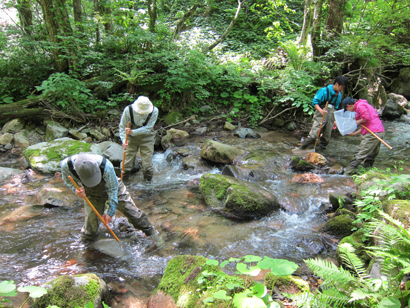 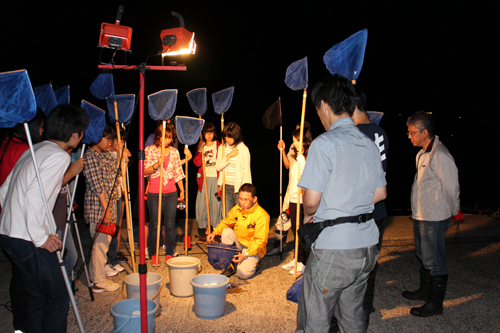 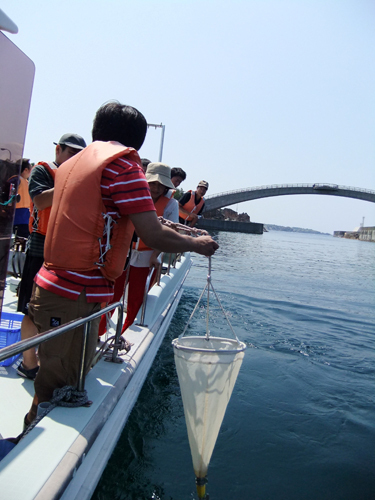 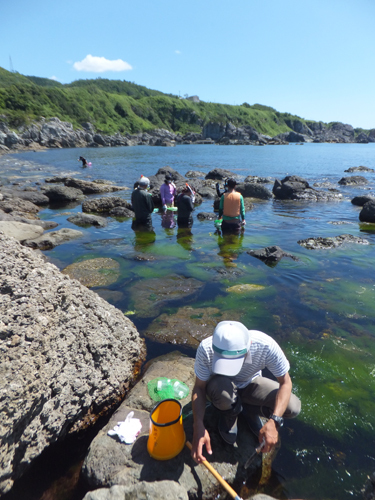 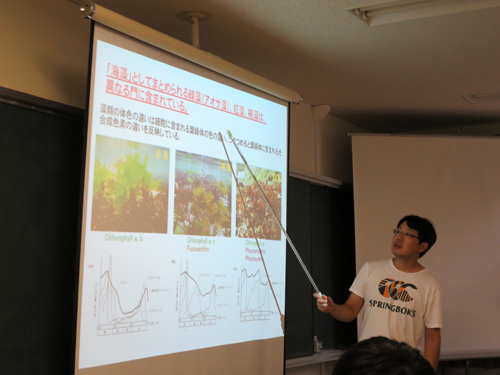 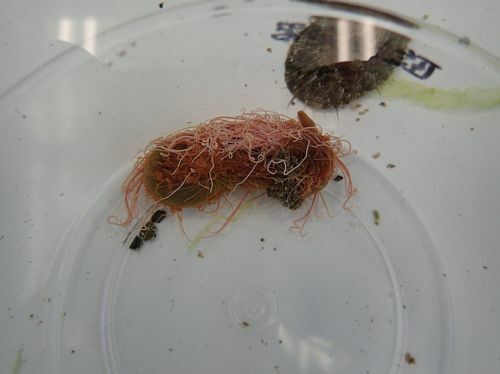 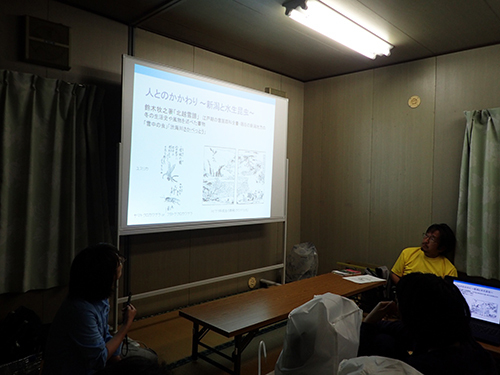 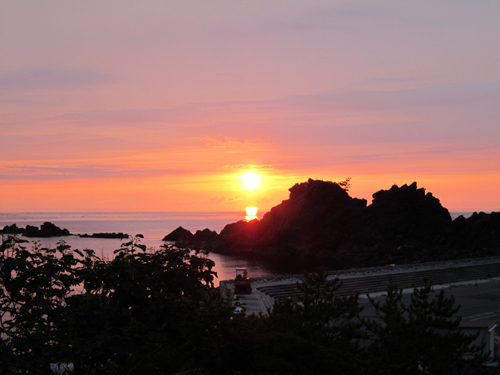 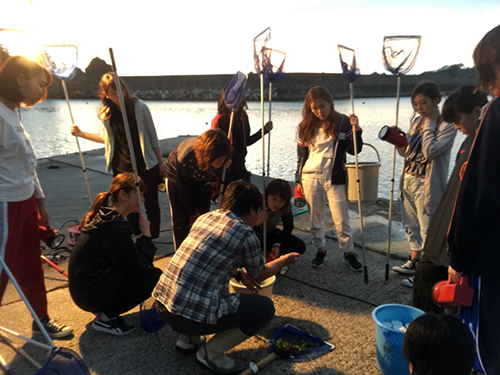 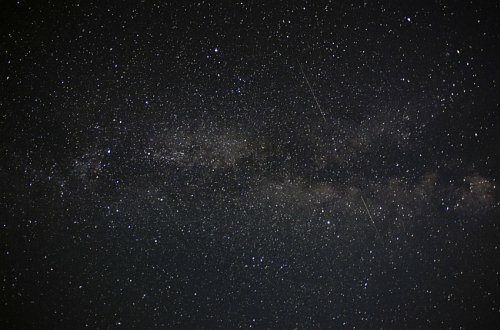 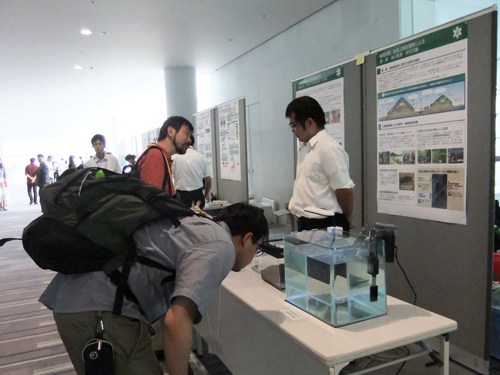 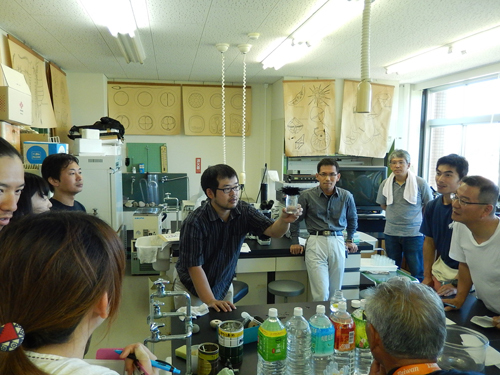 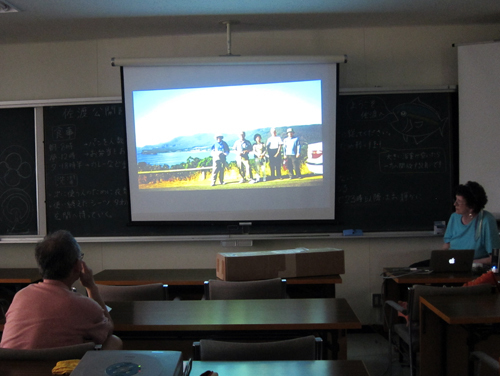 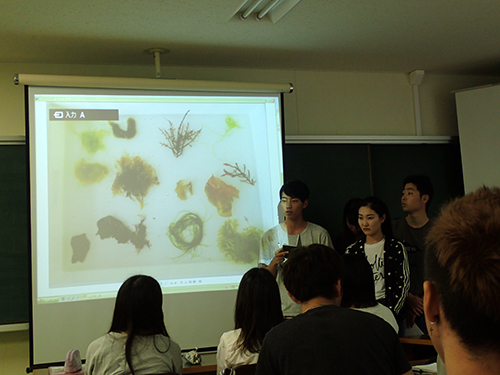 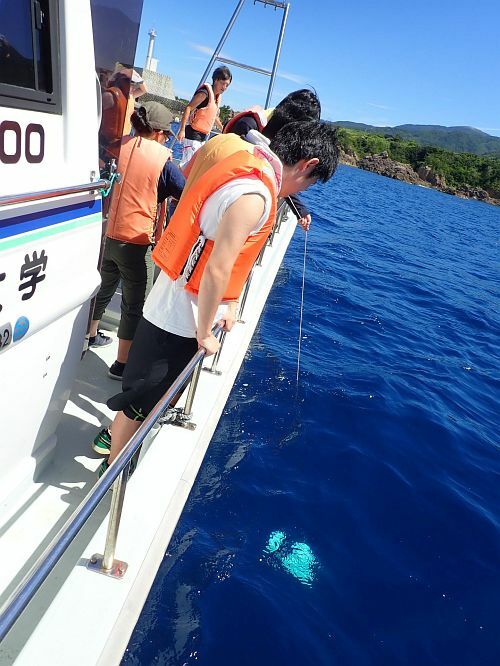 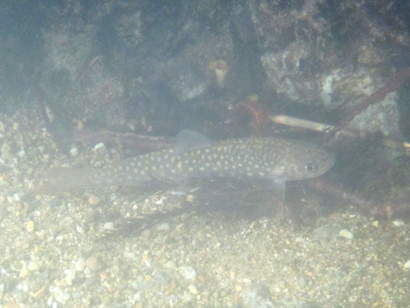 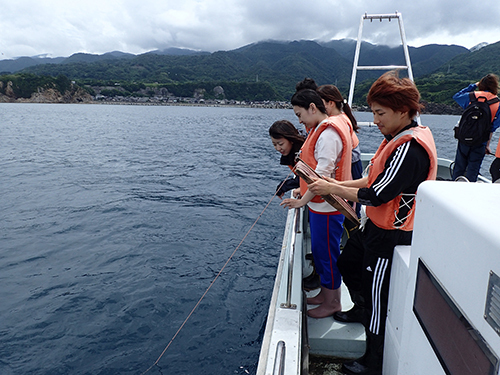 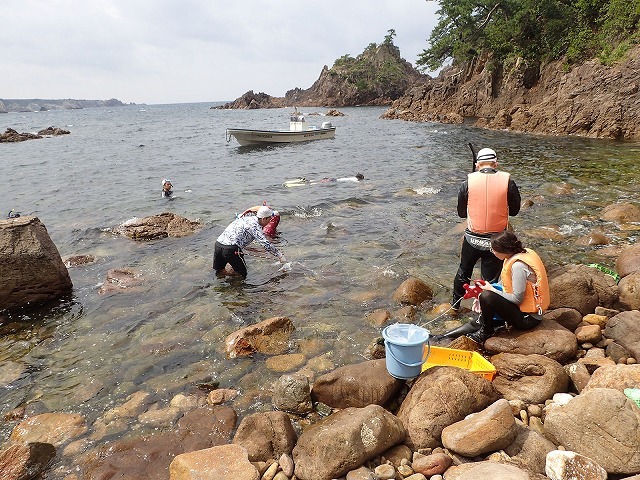 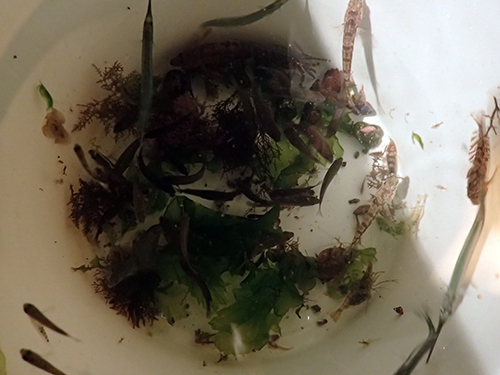 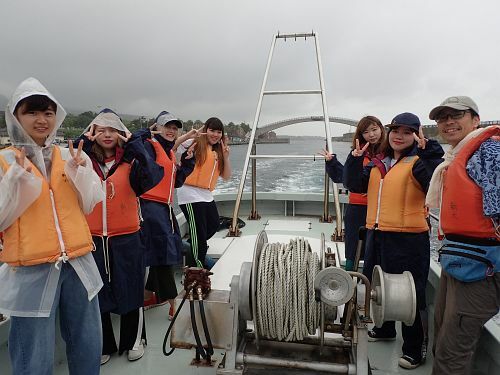 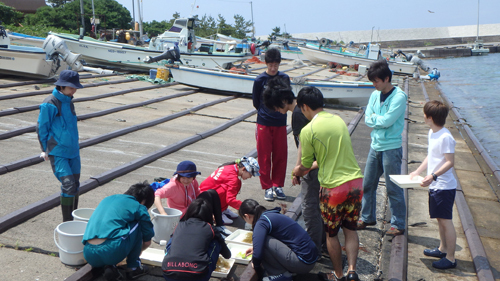 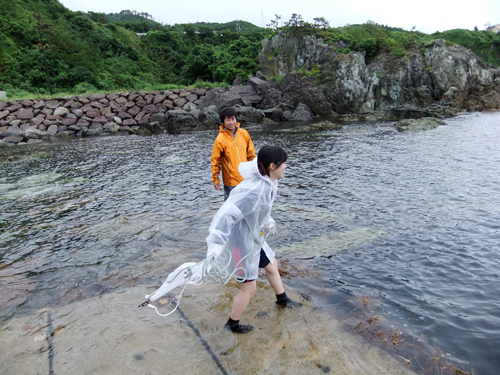 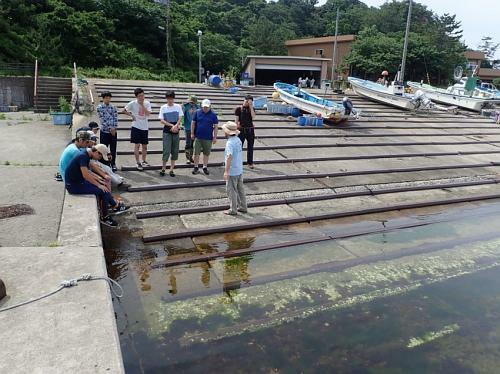 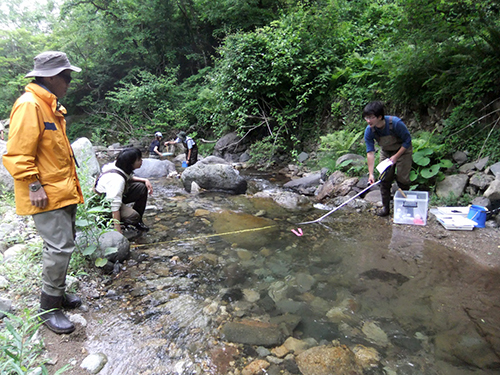 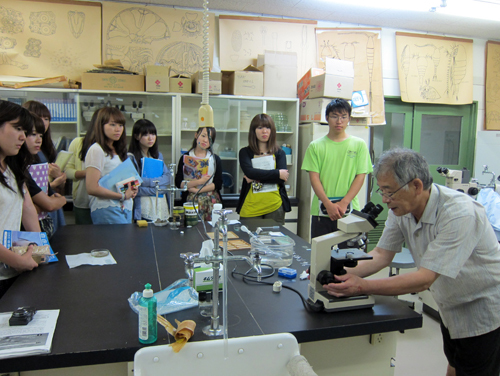 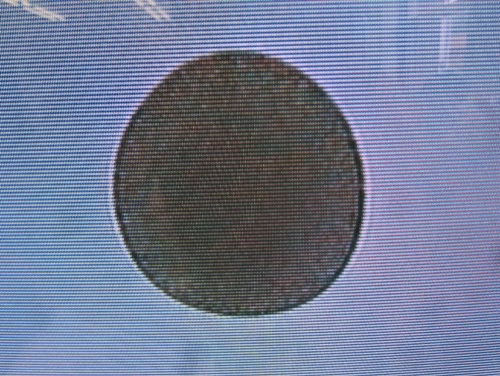 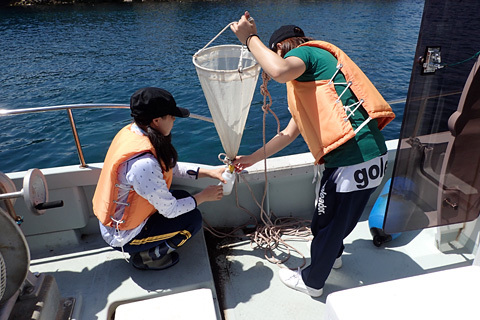 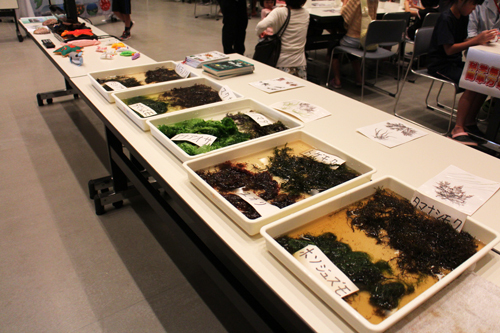 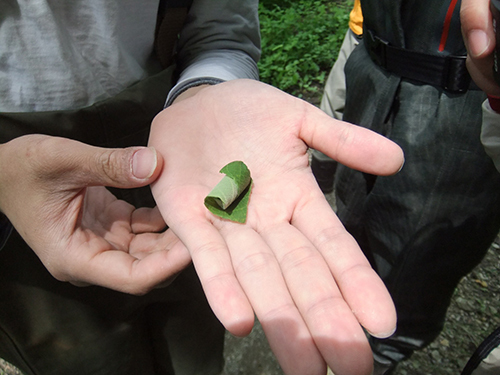 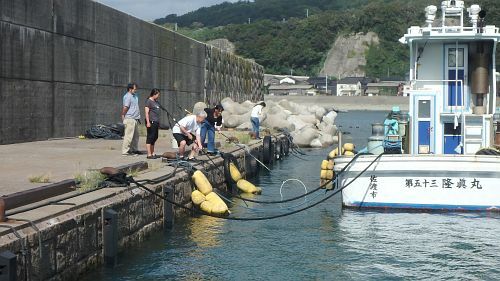 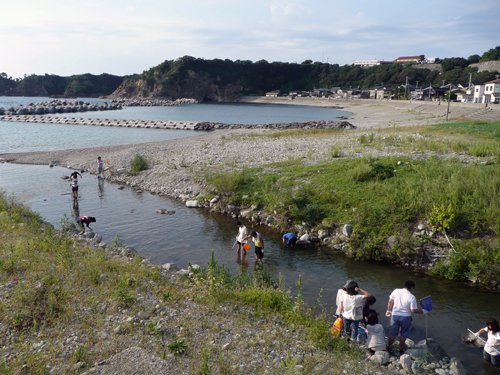 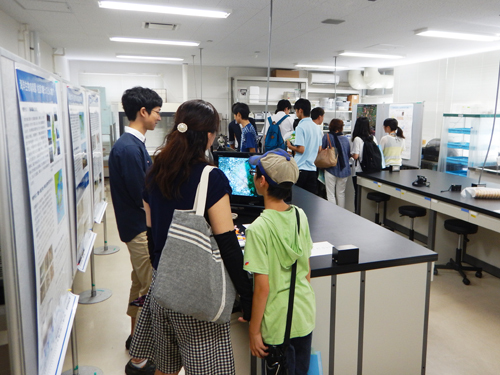 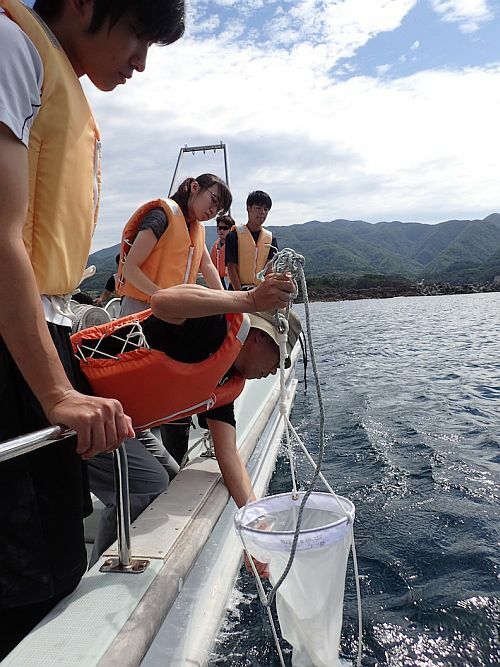 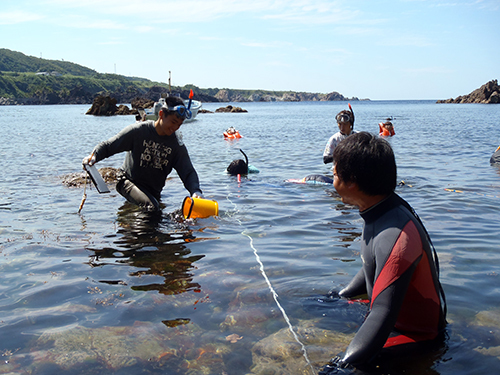 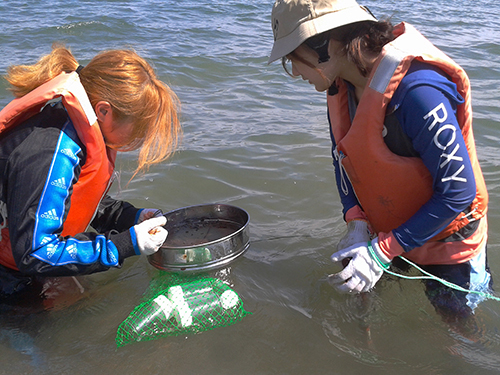 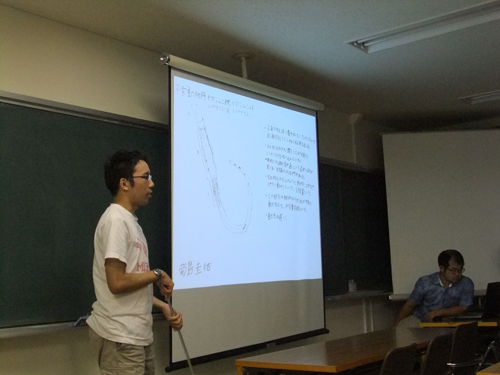 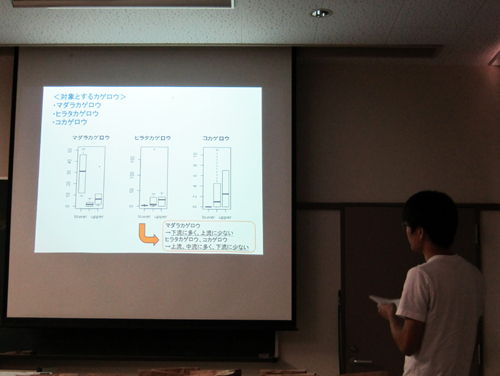 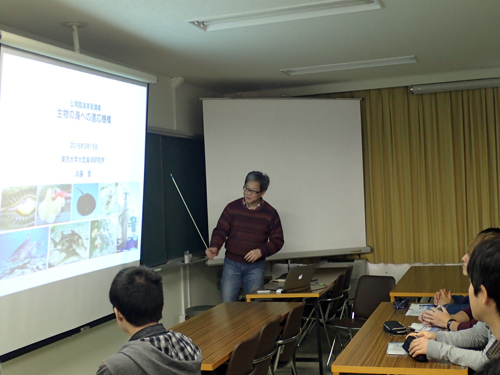 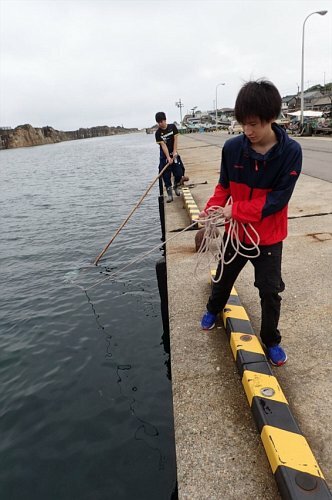 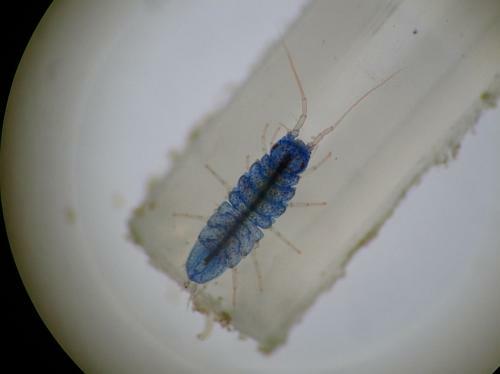 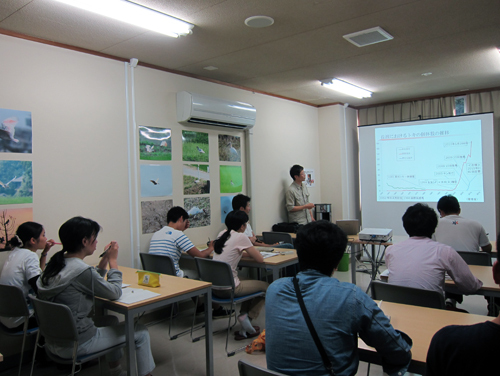 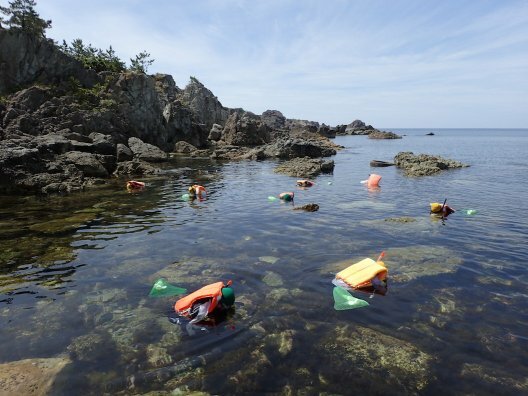 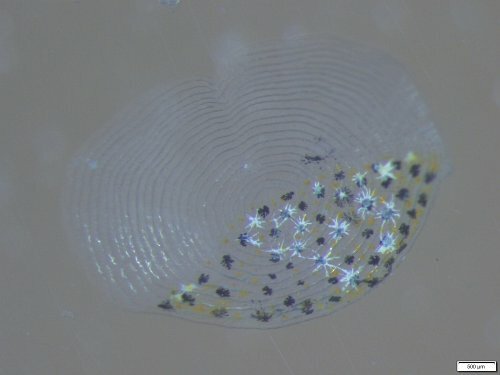 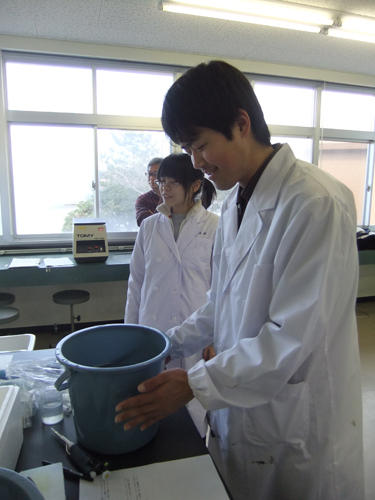 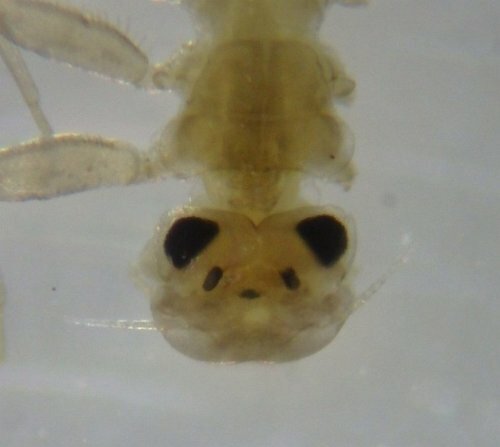 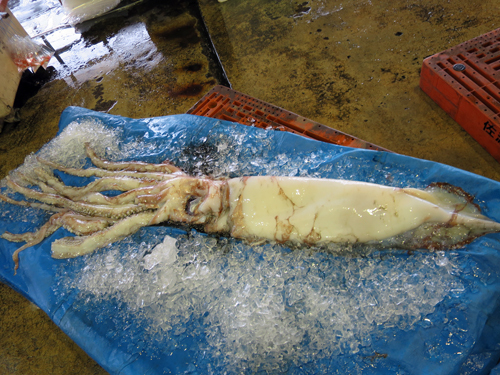 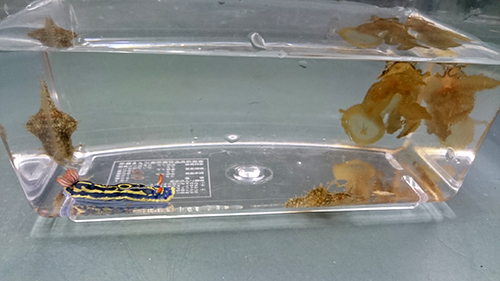 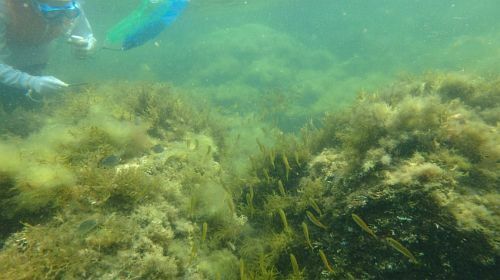 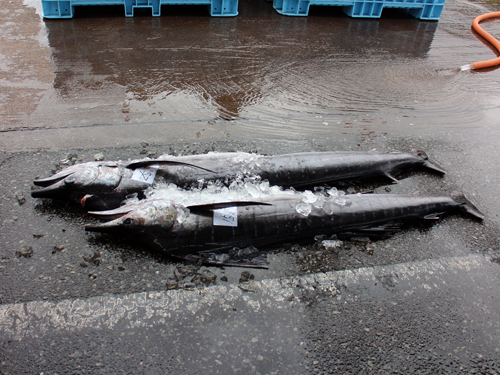 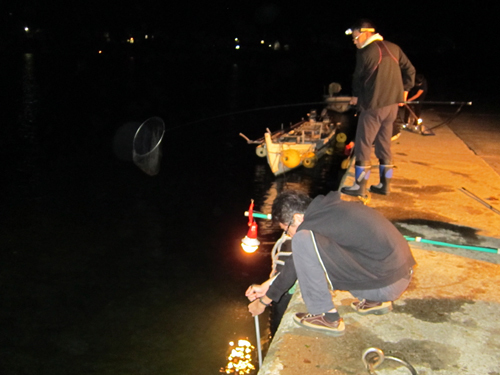 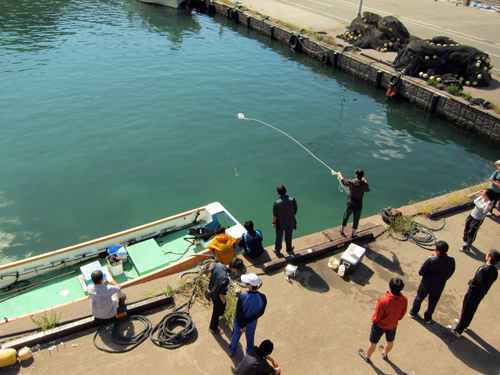 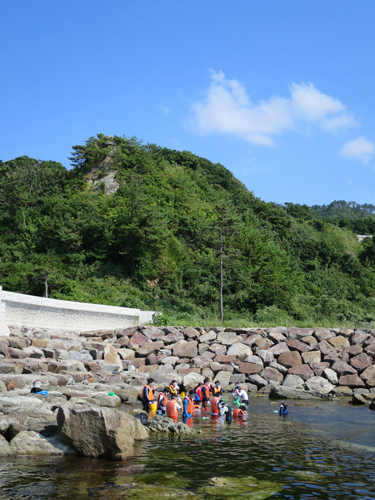 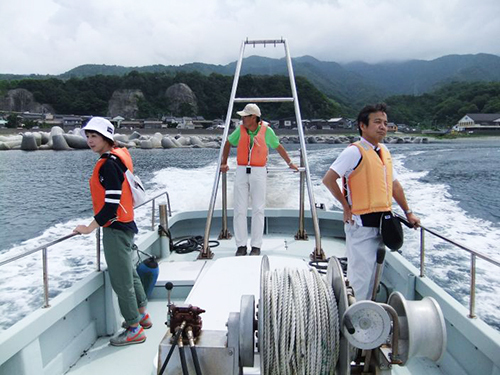 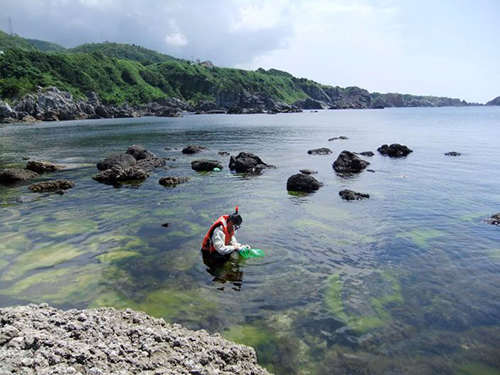 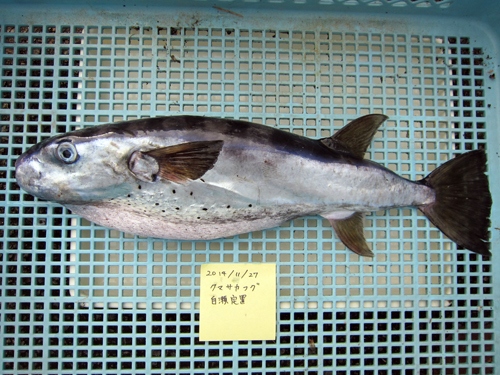 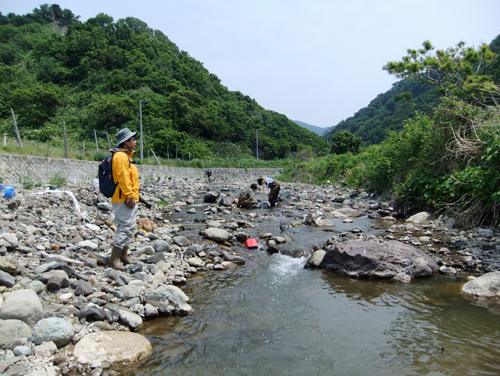 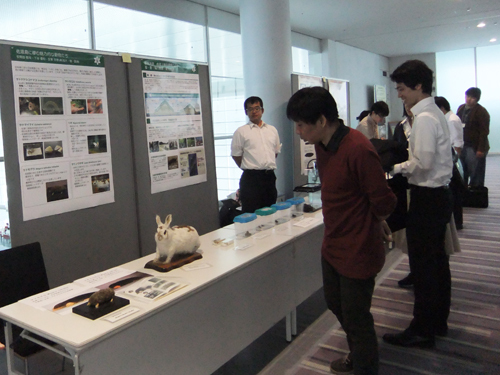 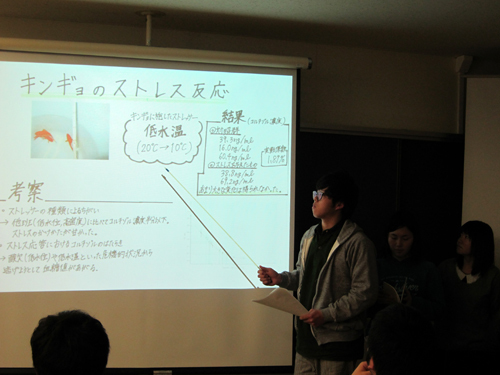 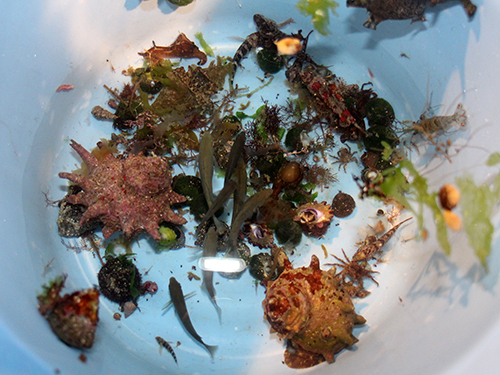 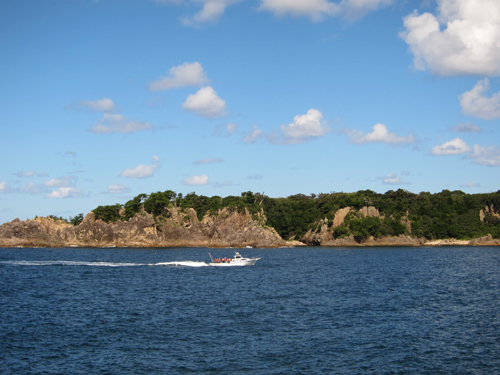 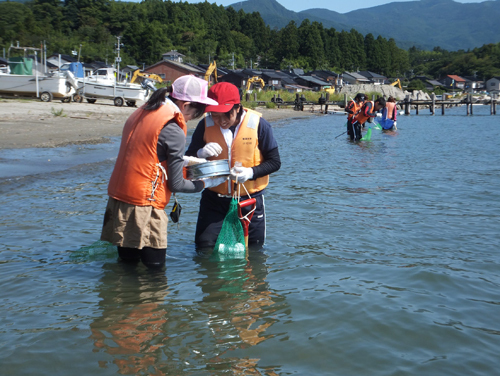 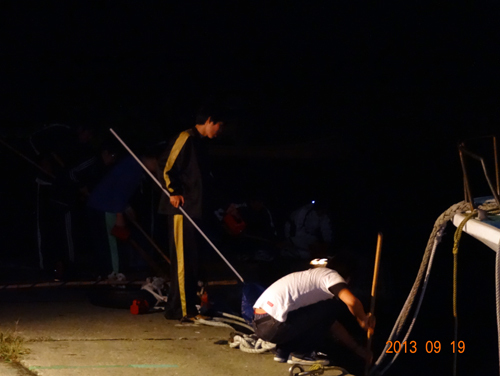 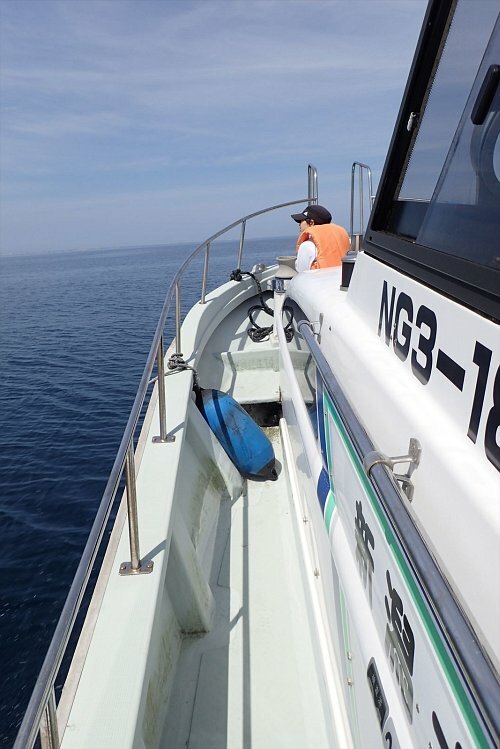 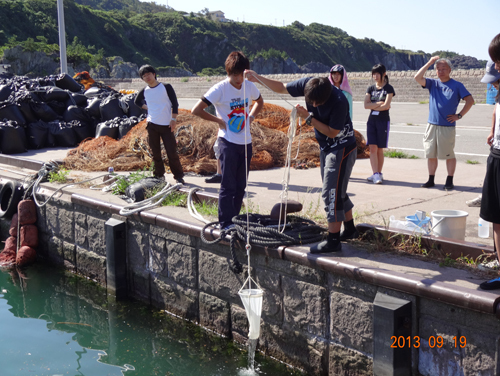 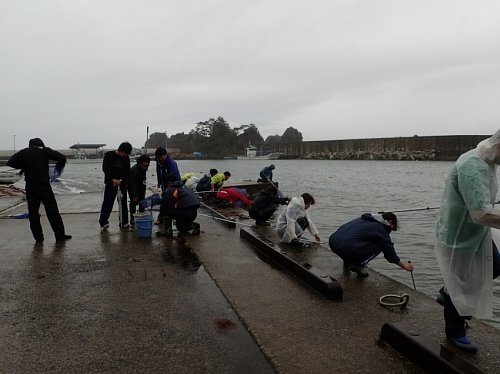 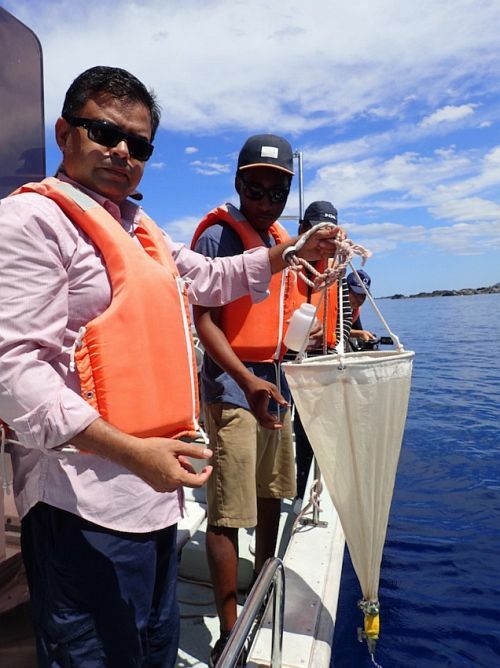 They also sampled plankton by plankton net using a boat in Senkaku Bay of Japan Sea. 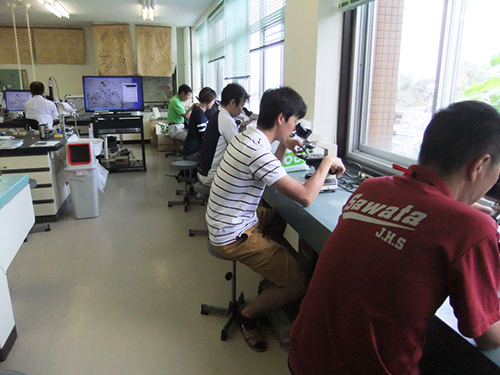 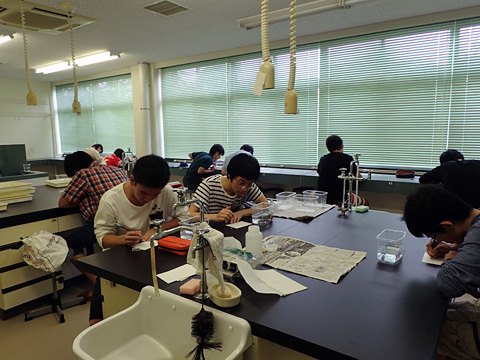 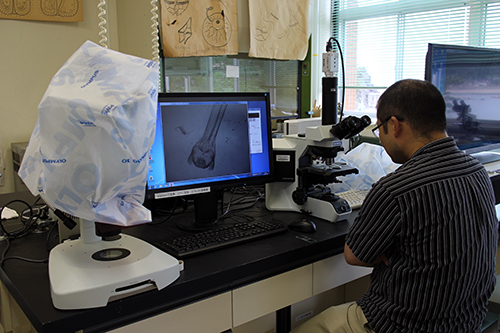 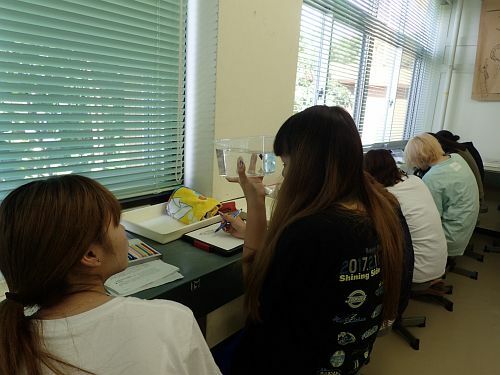 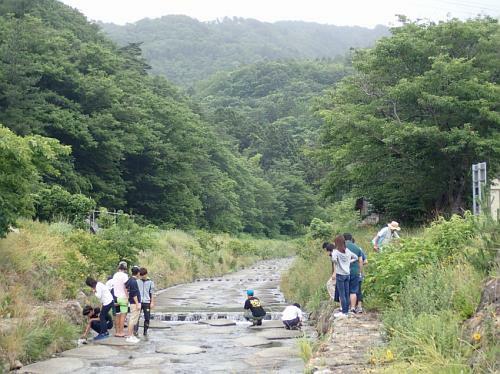 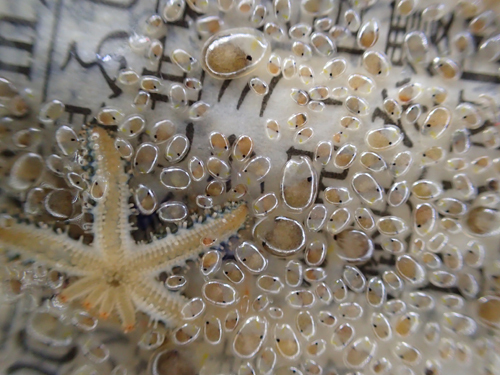 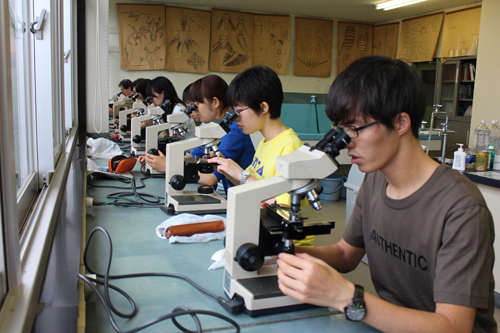 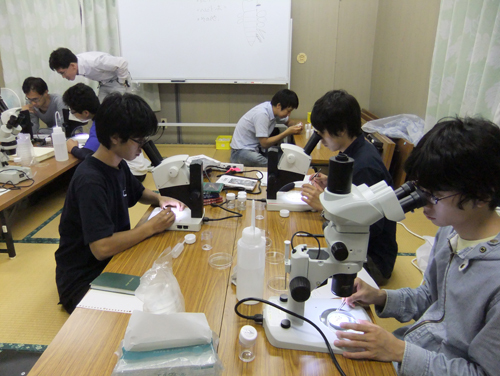 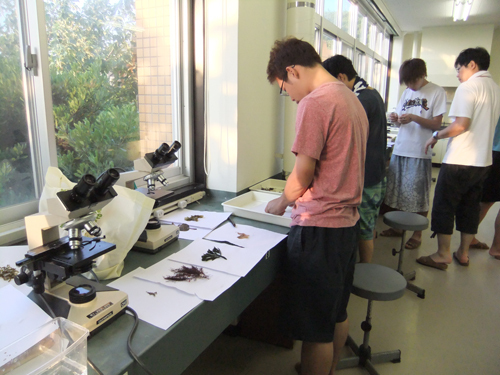 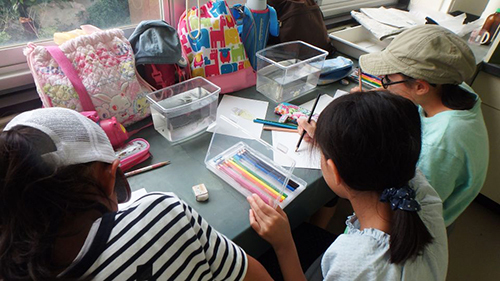 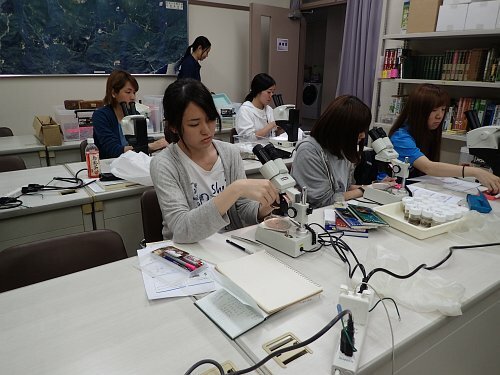 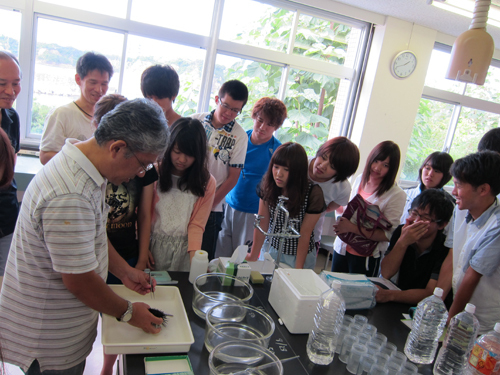 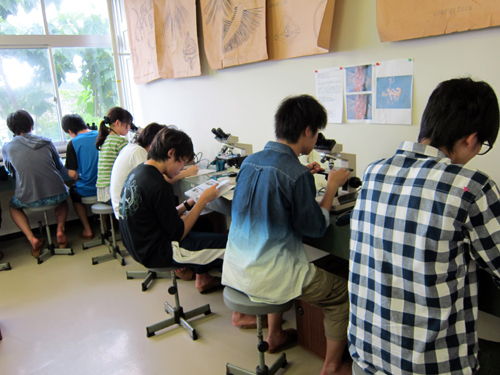 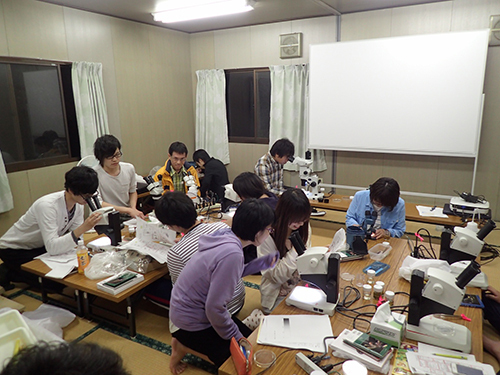 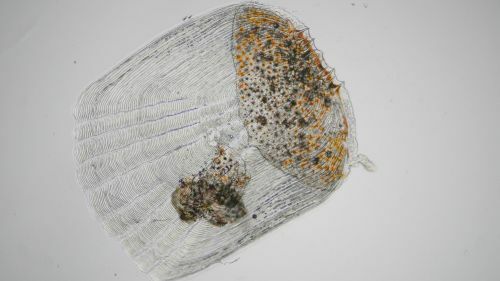 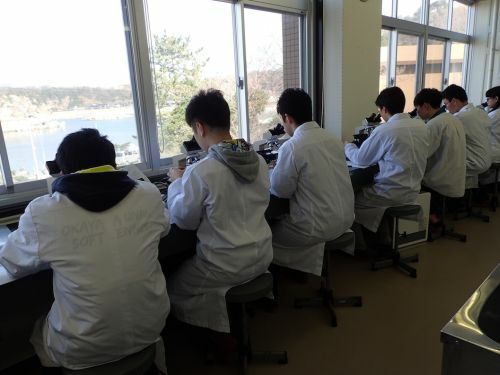 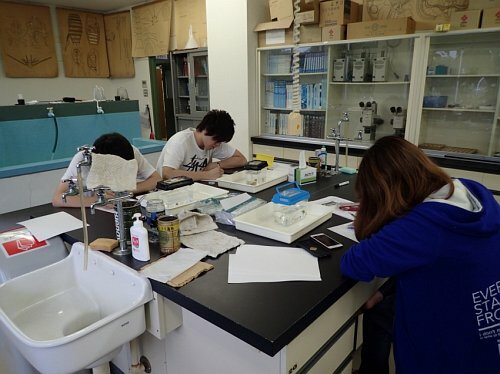 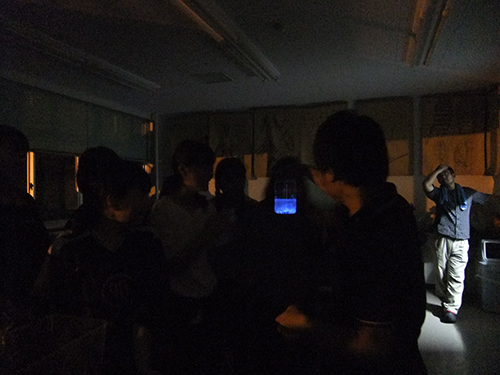 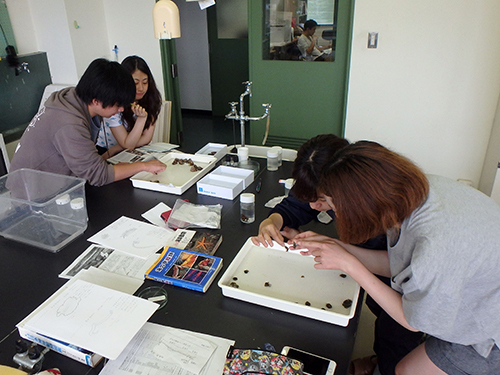 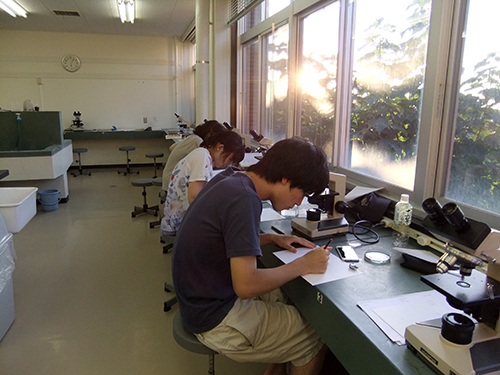 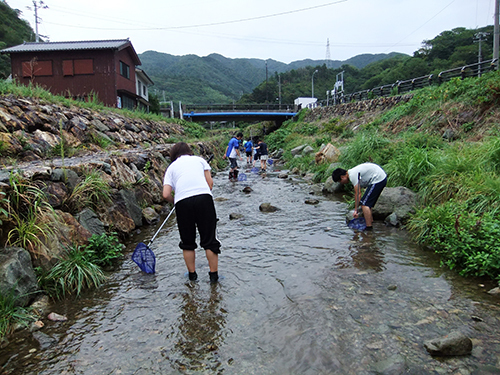 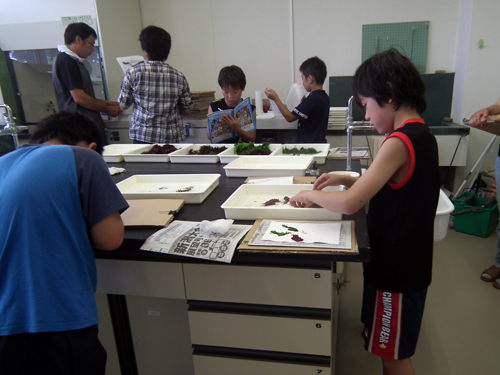 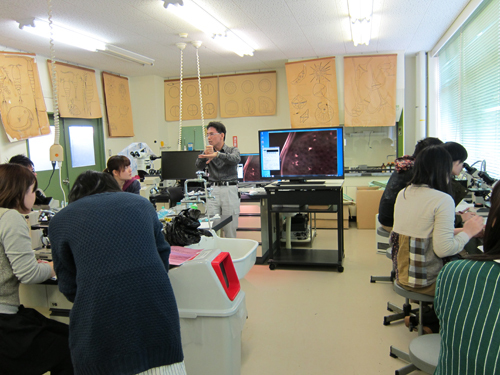 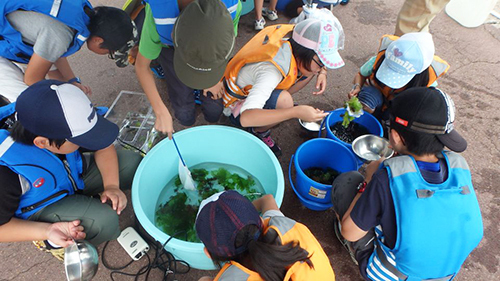 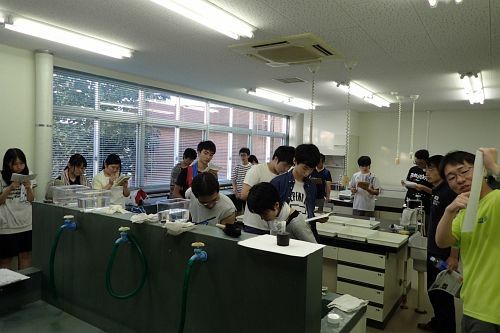 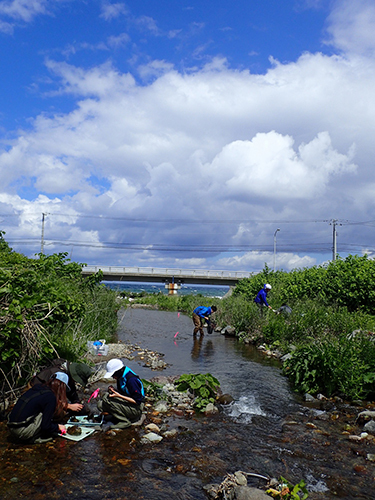 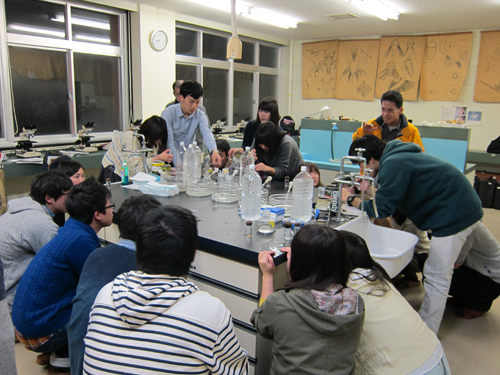 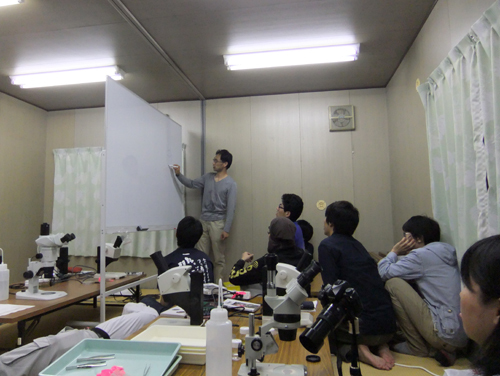 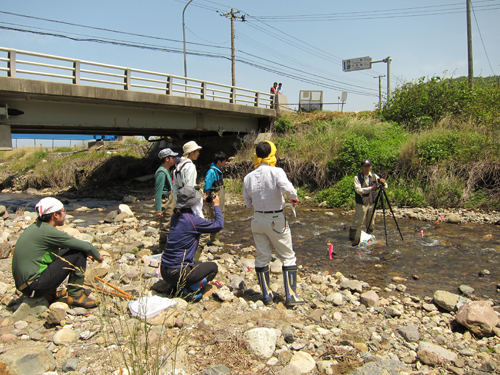 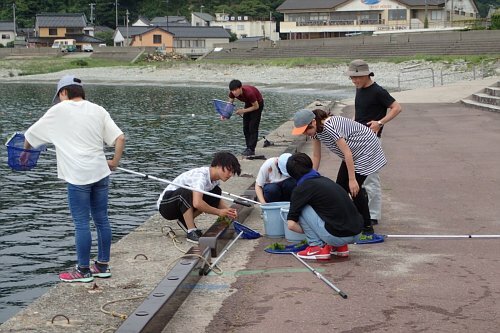 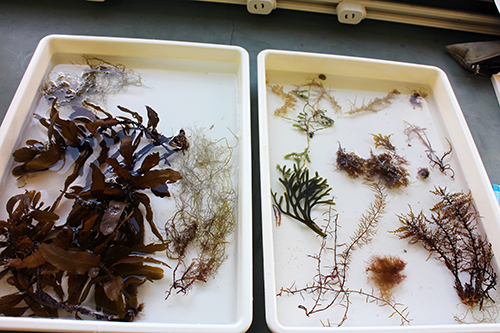 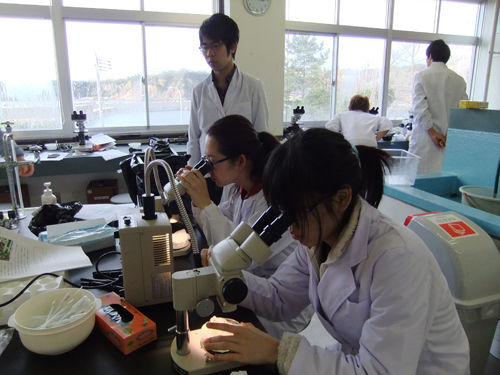 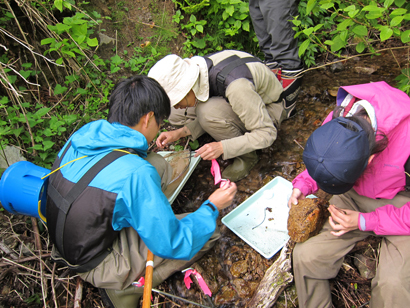 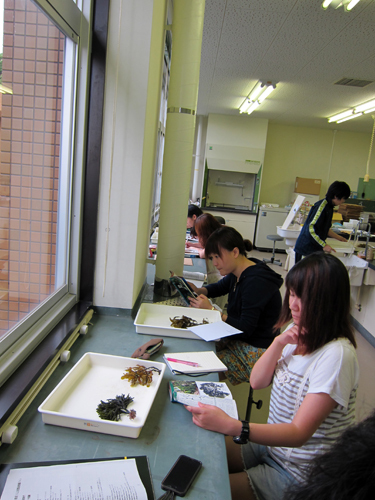 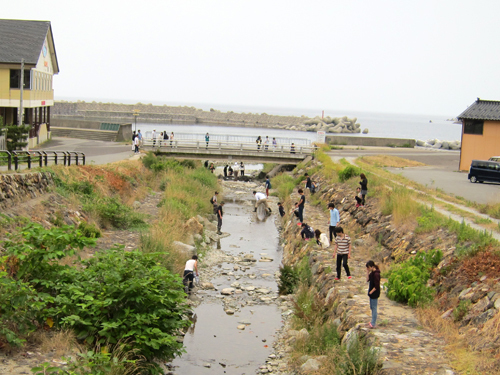 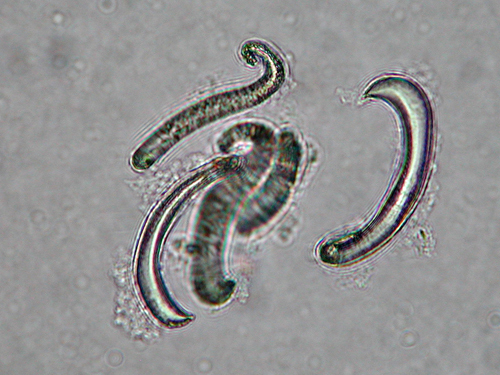 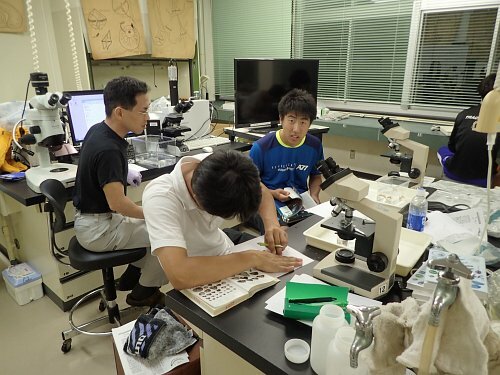 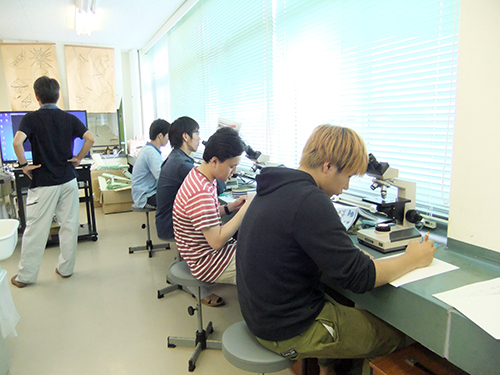 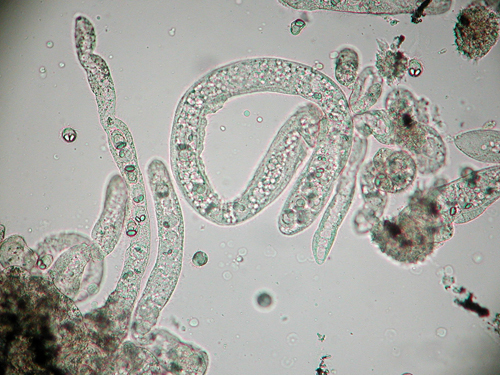 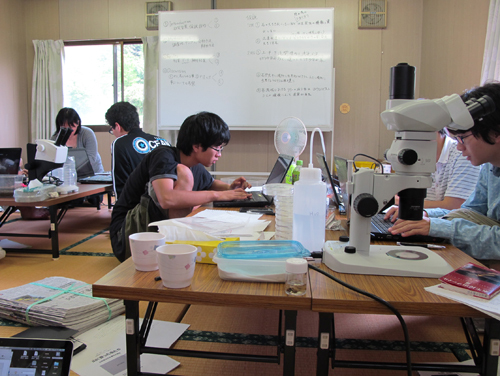 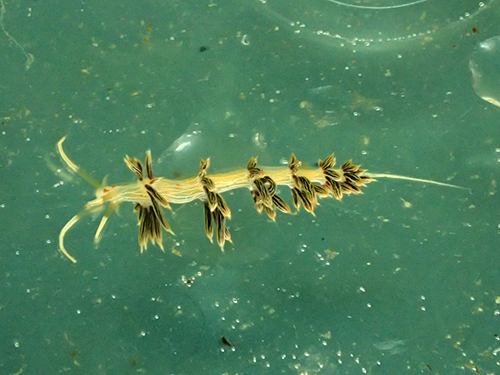 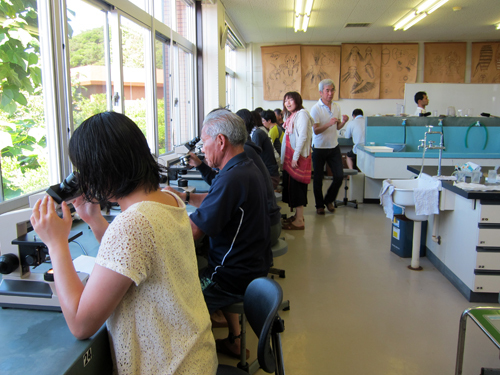 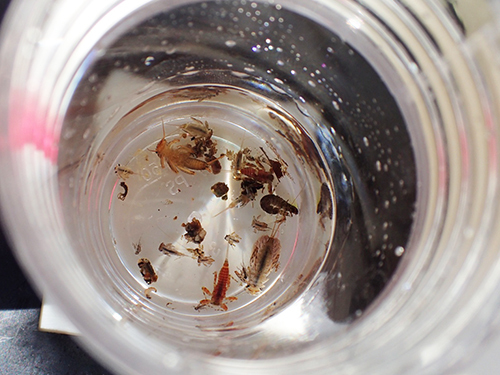 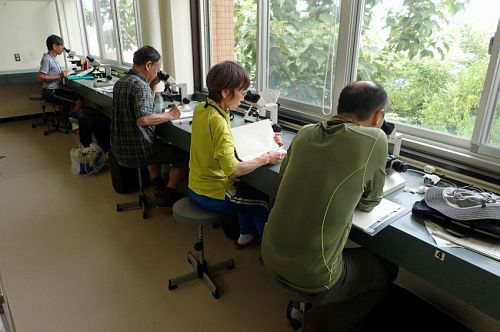 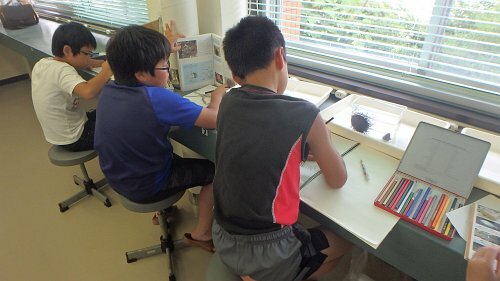 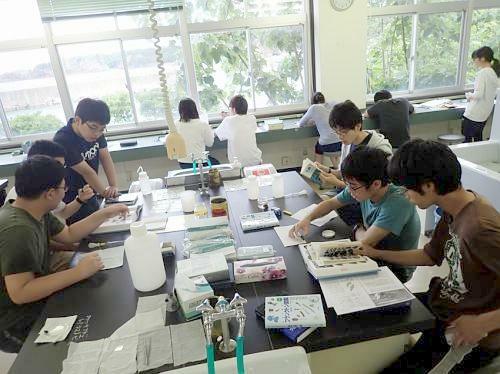 After plankton sampling, the participants were observed different types of plankton under microscope and sketched. 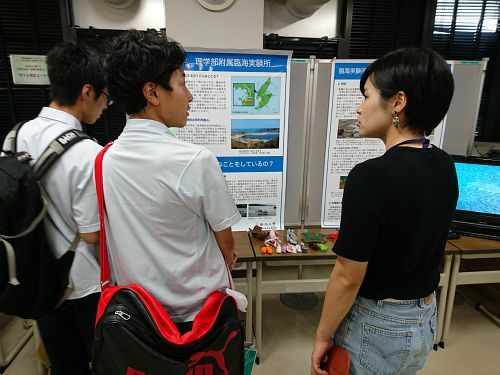 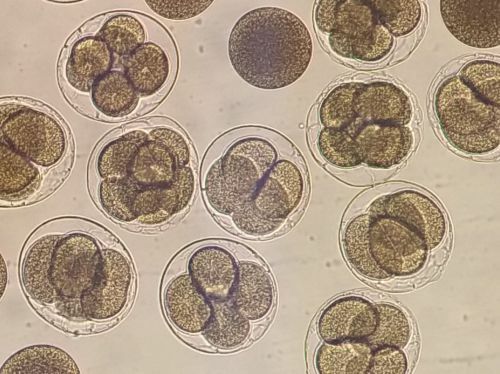 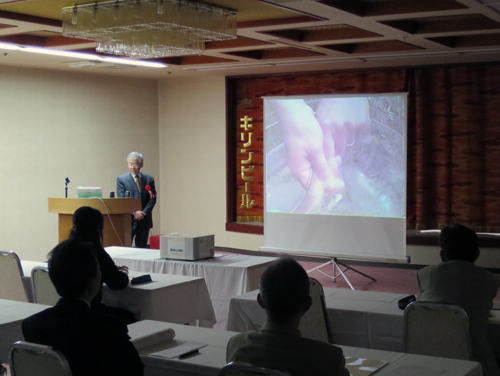 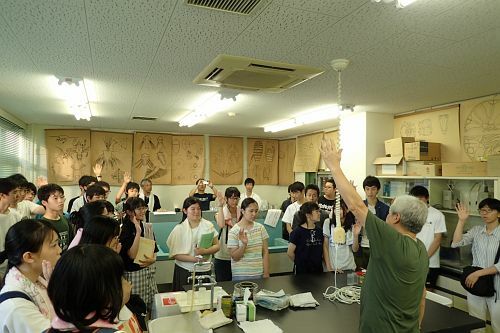 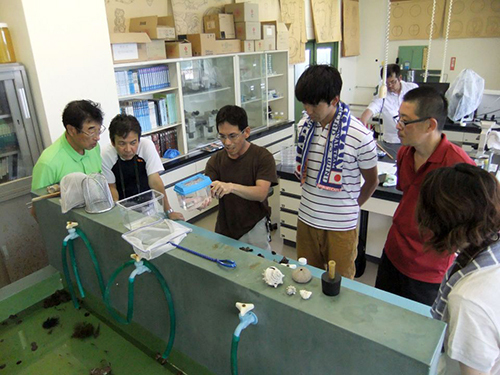 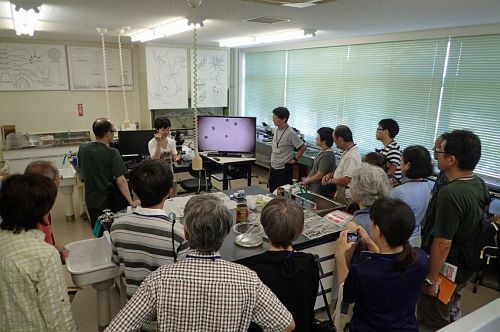 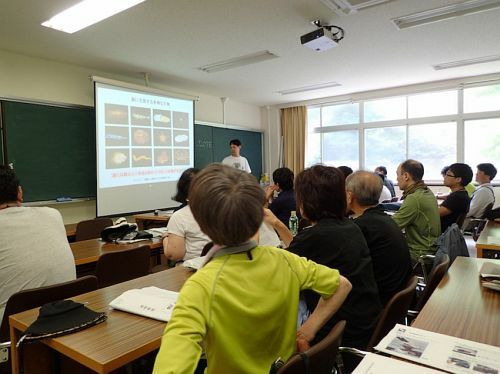 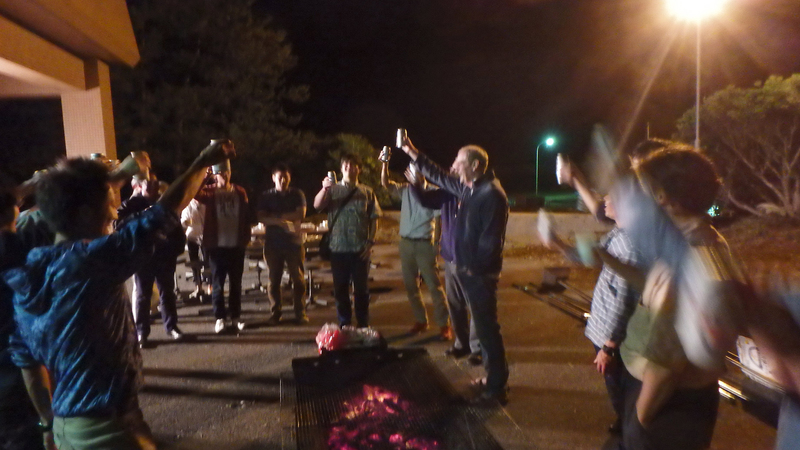 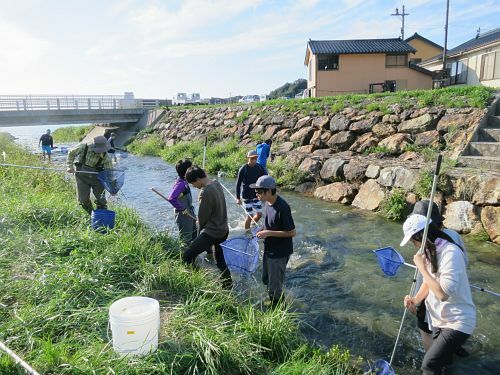 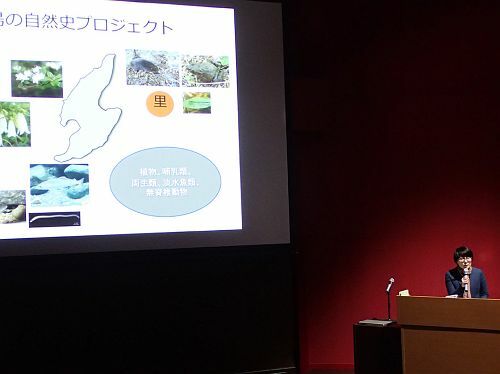 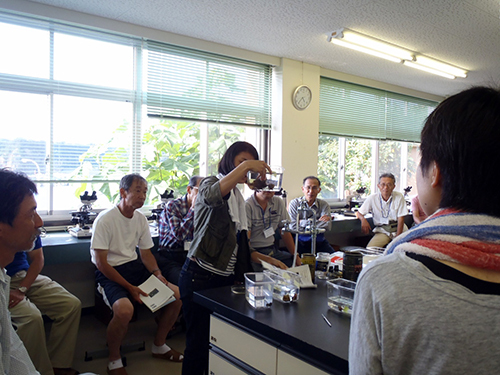 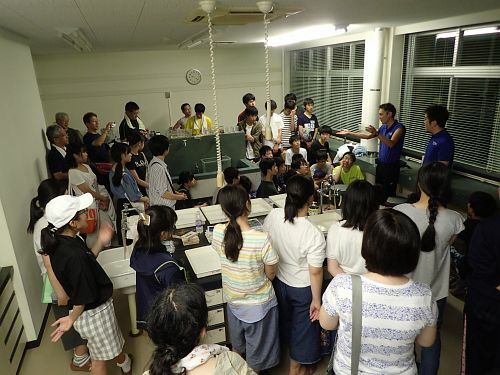 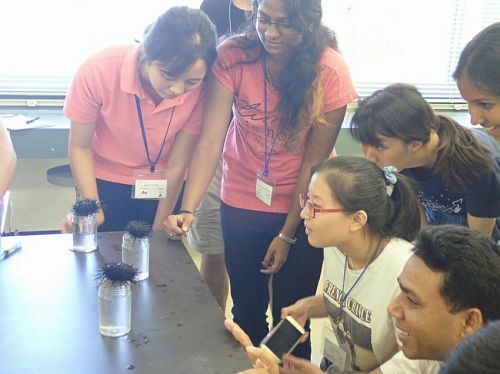 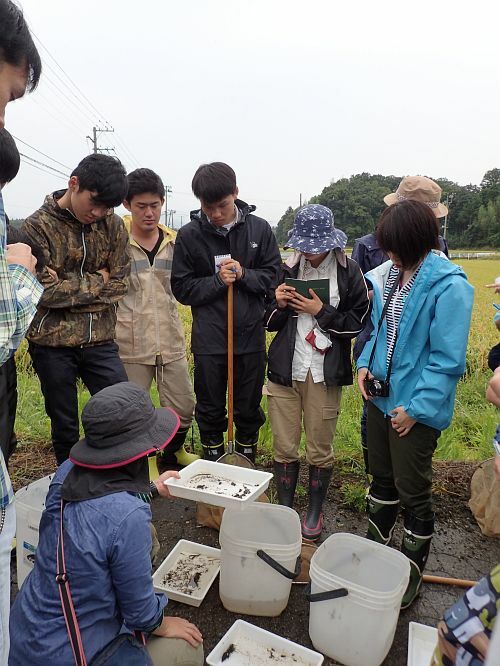 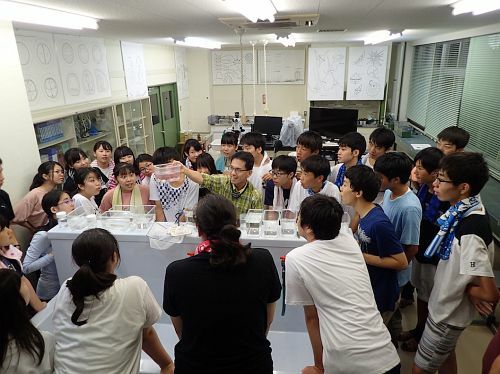 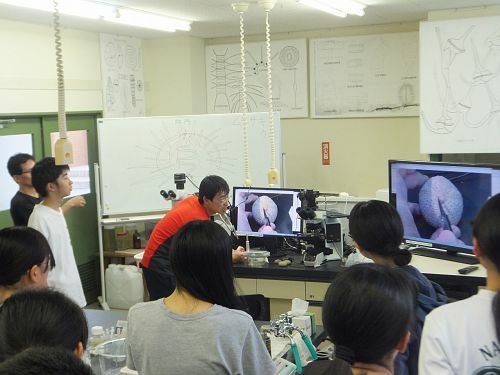 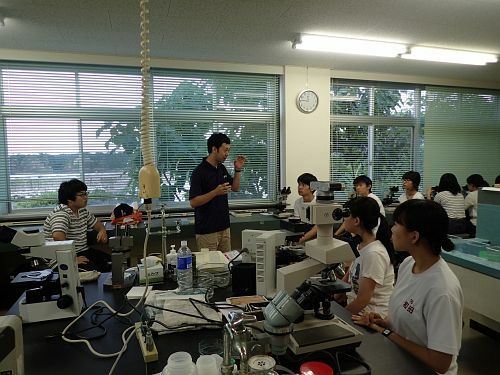 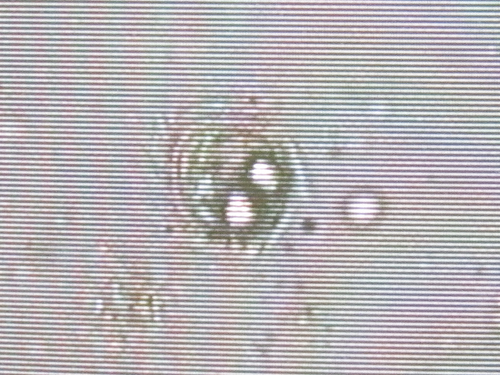 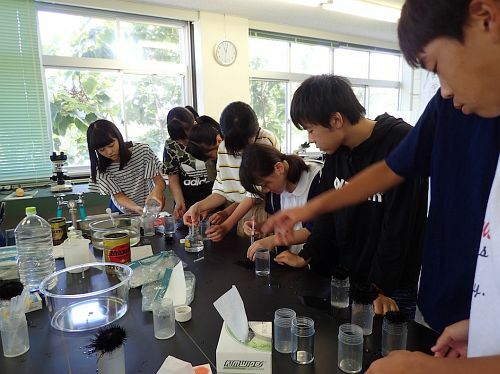 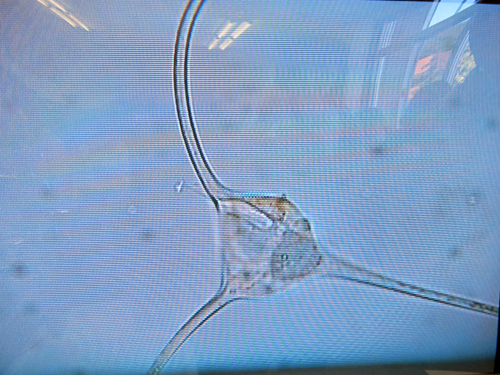 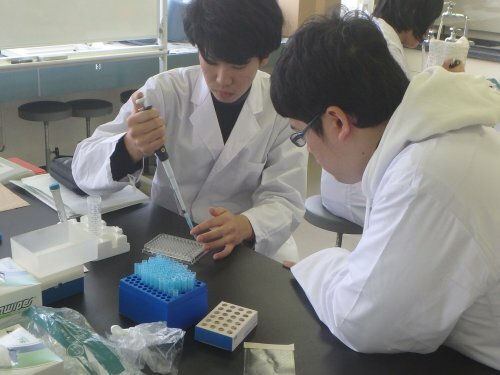 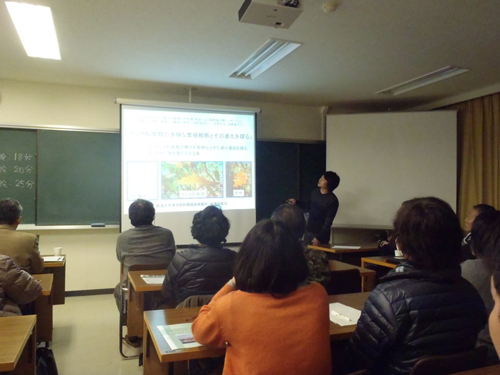 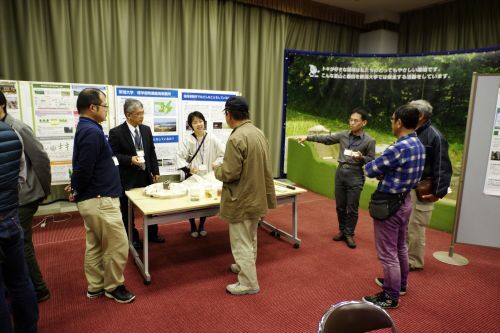 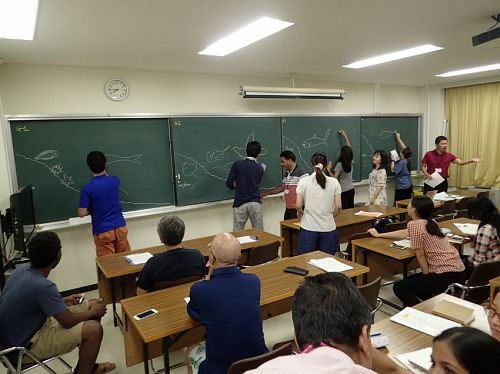 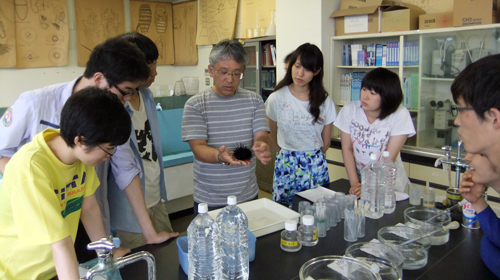 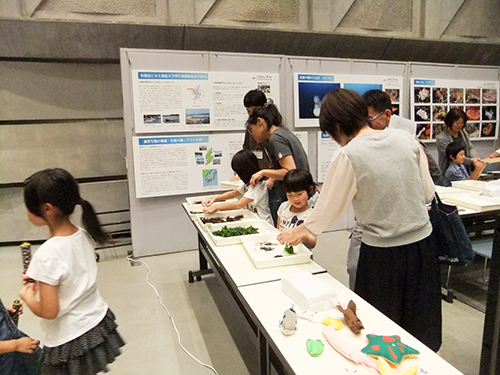 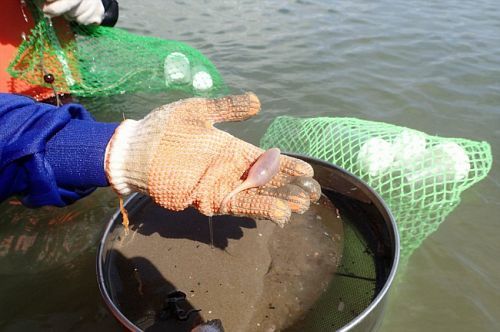 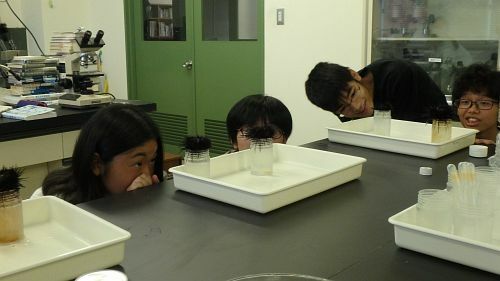 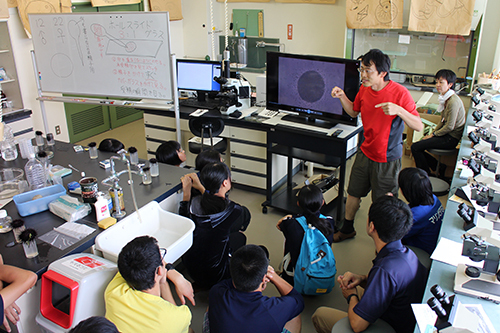 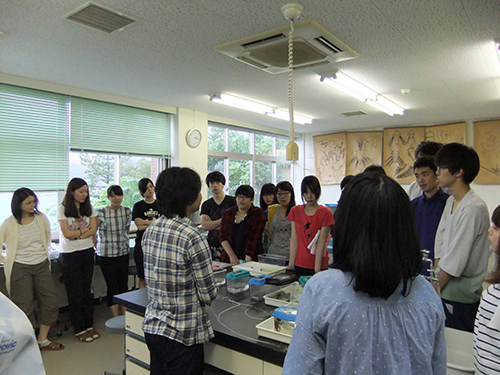 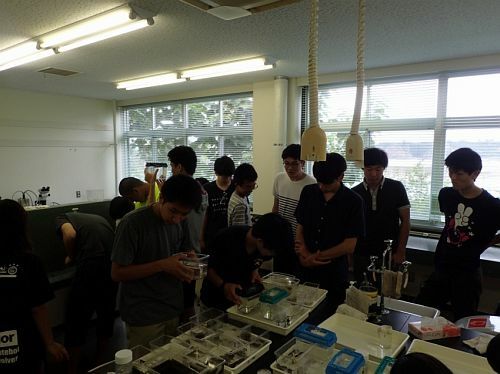 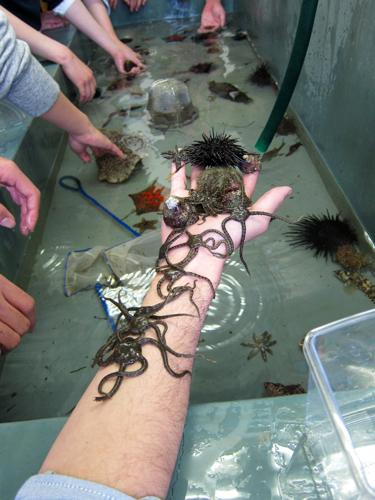 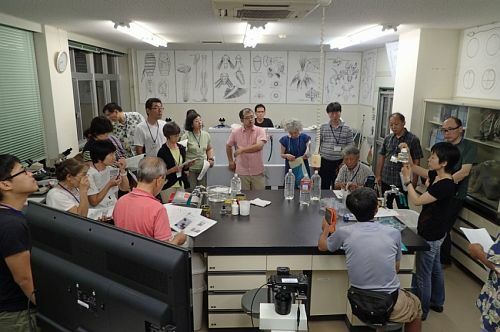 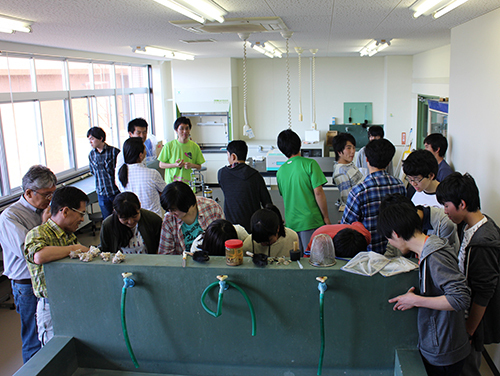 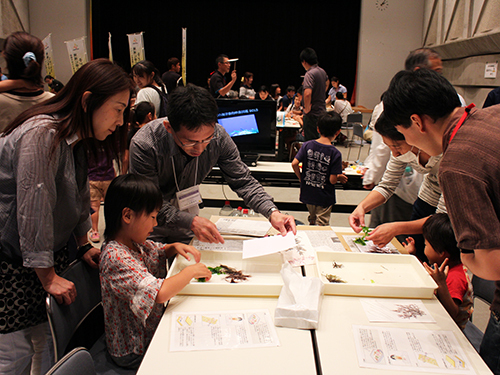 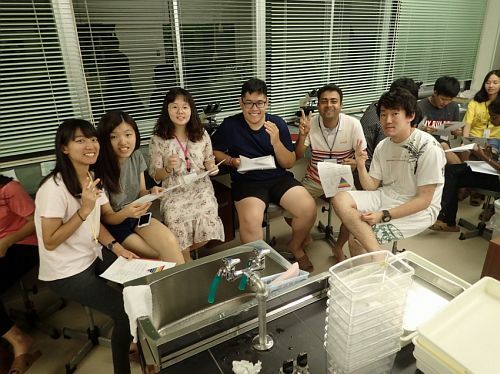 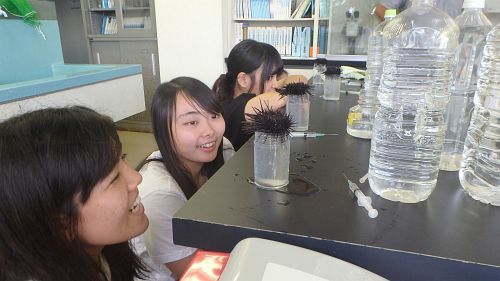 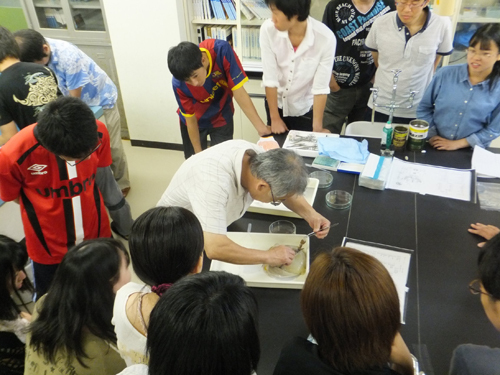 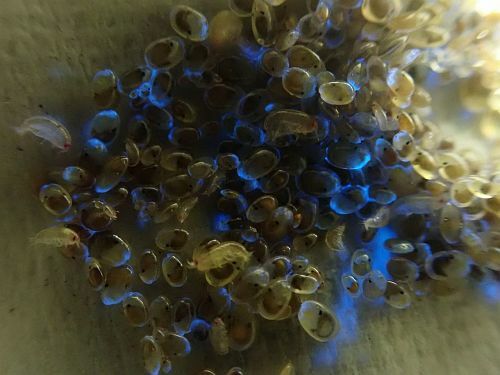 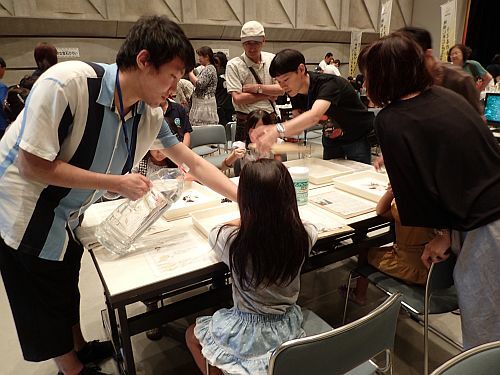 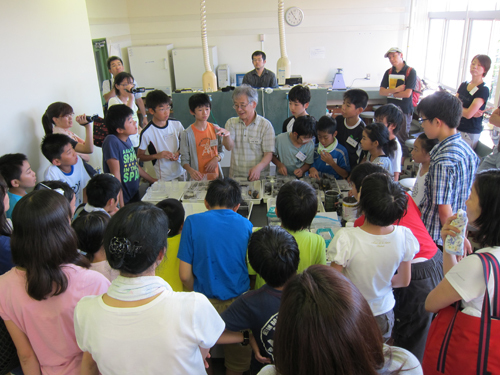 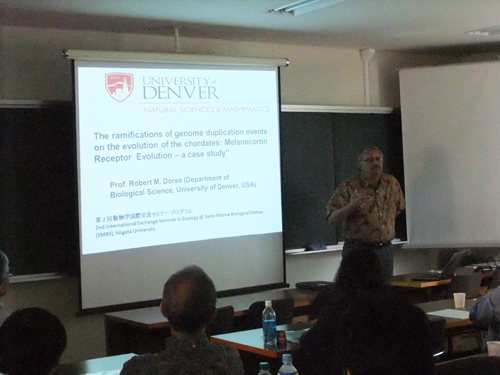 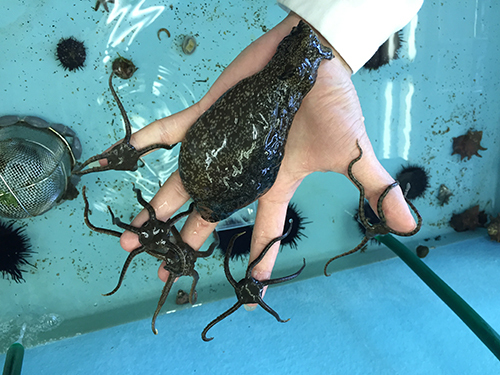 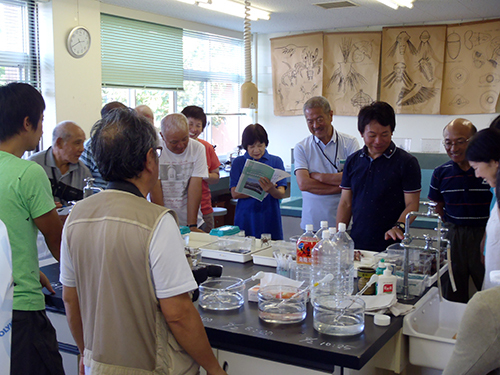 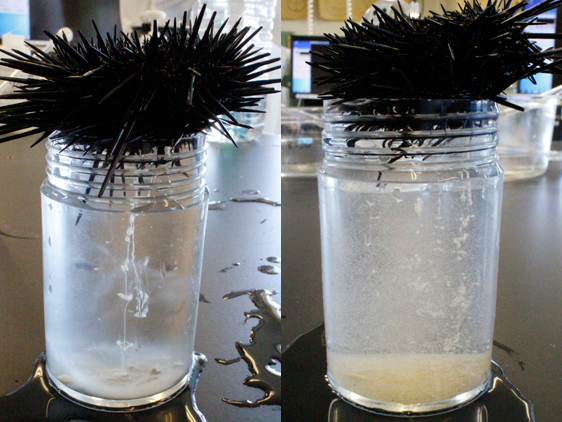 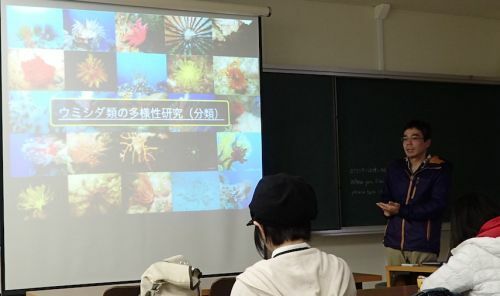 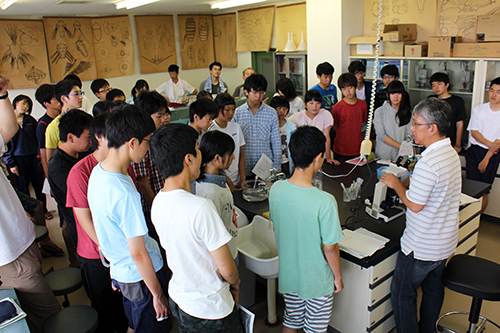 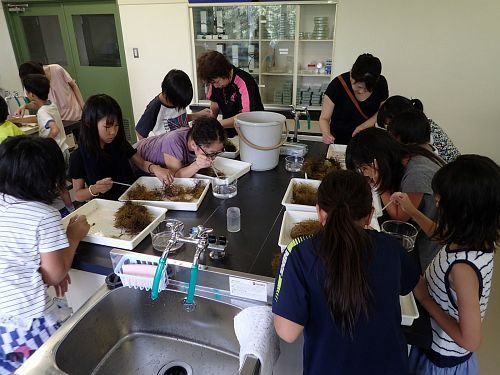 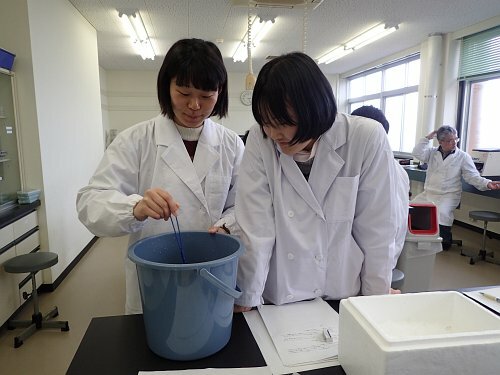 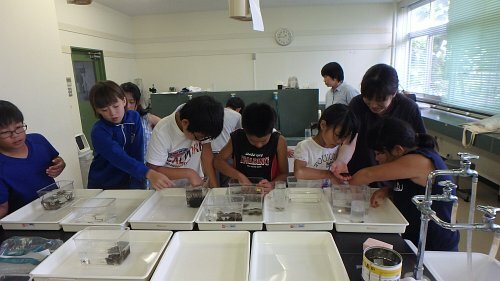 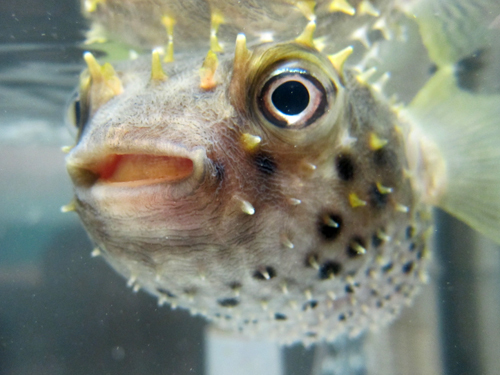 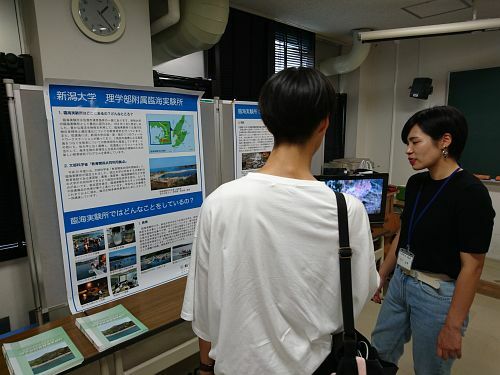 The participants were also observed hand-to-hand fertilization and early development of embryos in sea urchins following a lecture on reproduction and early development (the next generation). 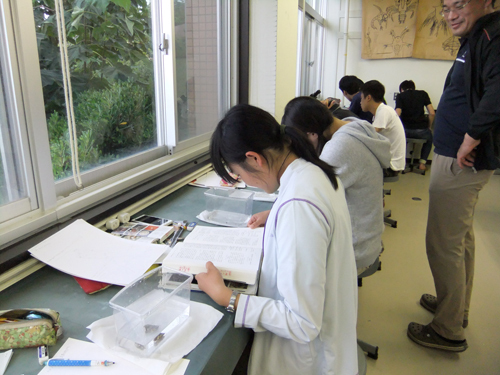 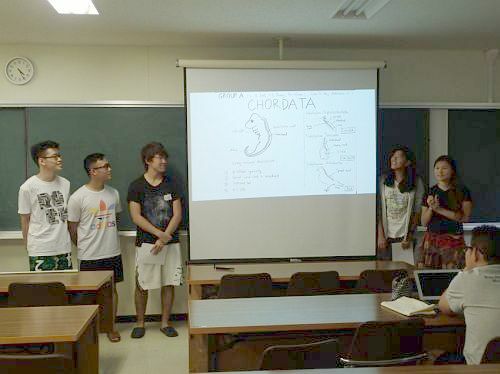 Finally, each participants were sketched an individual species from a certain animal phylum, characterized and presented.